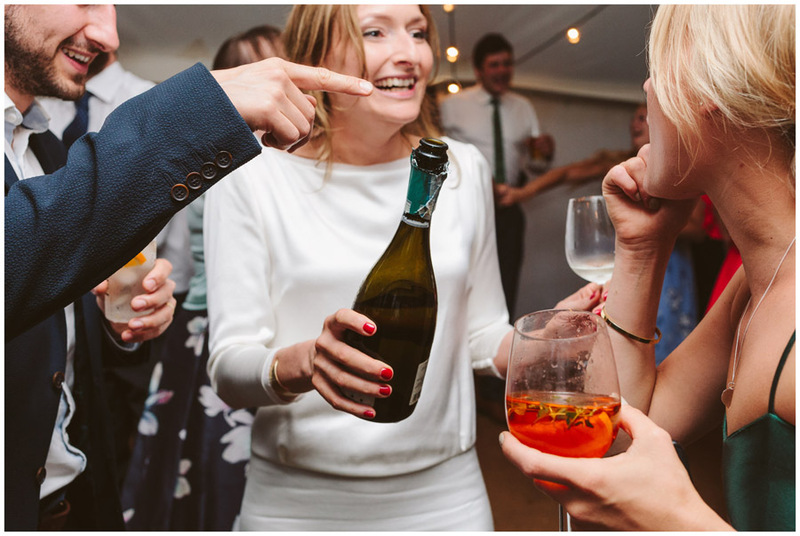 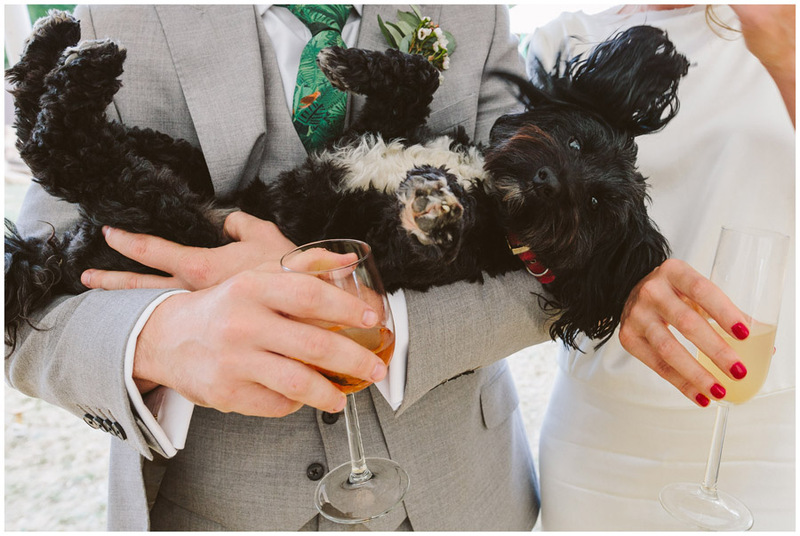 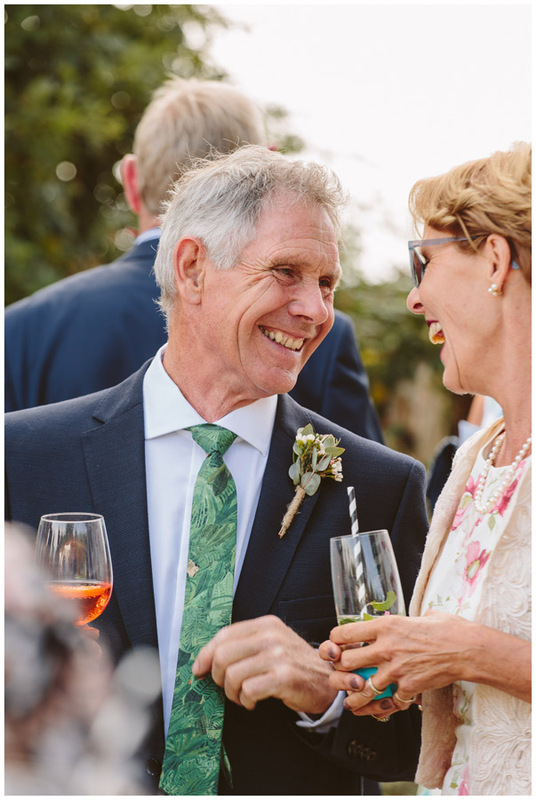 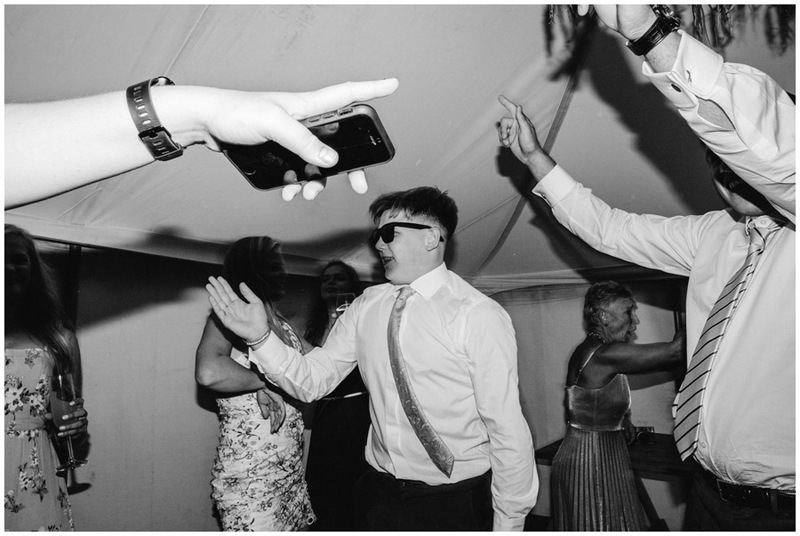 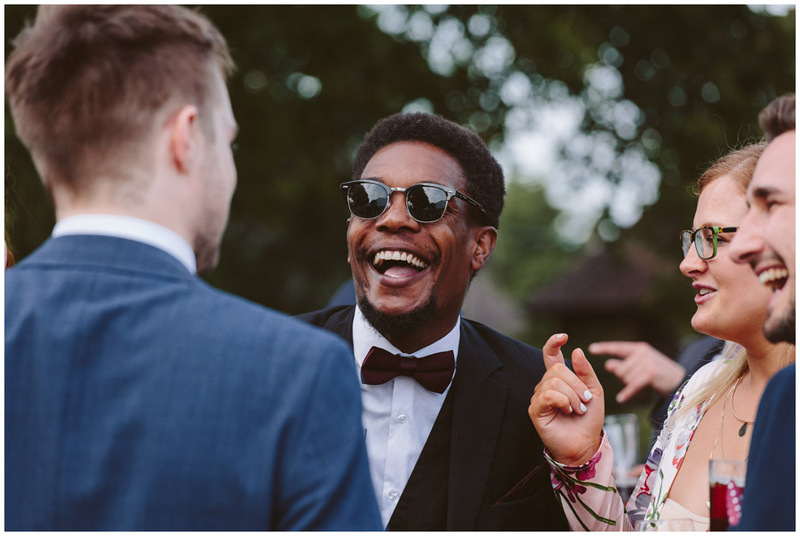 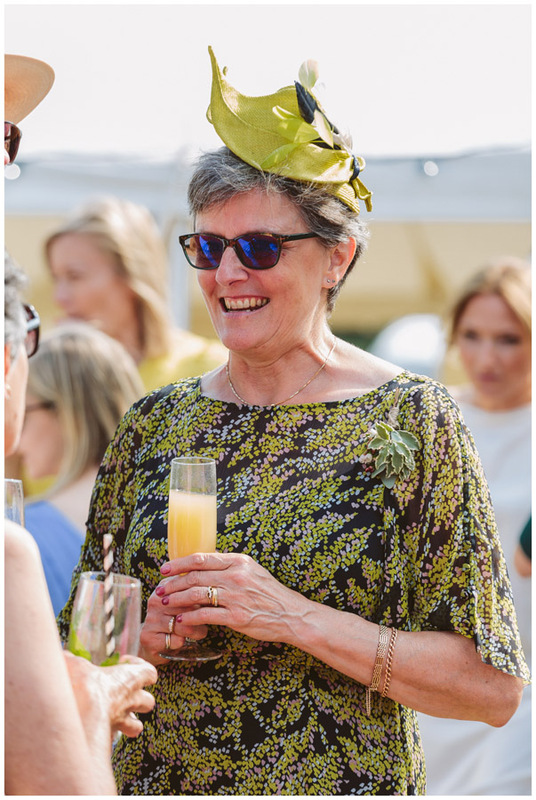 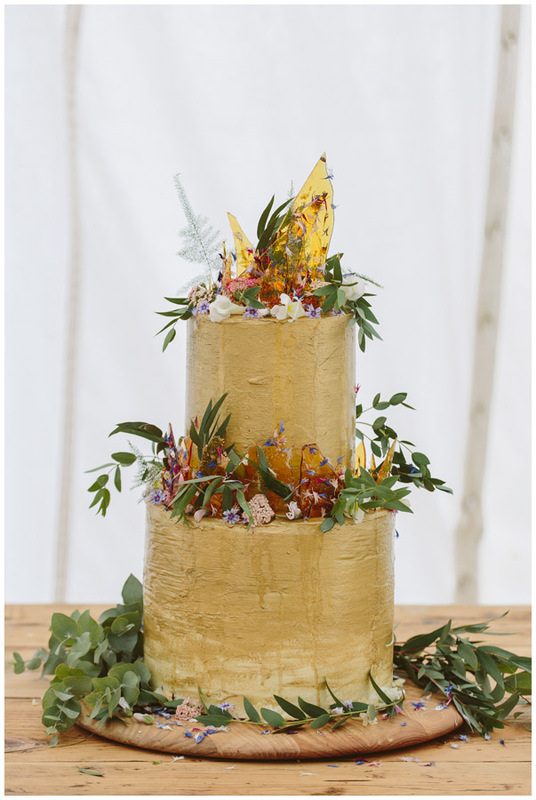 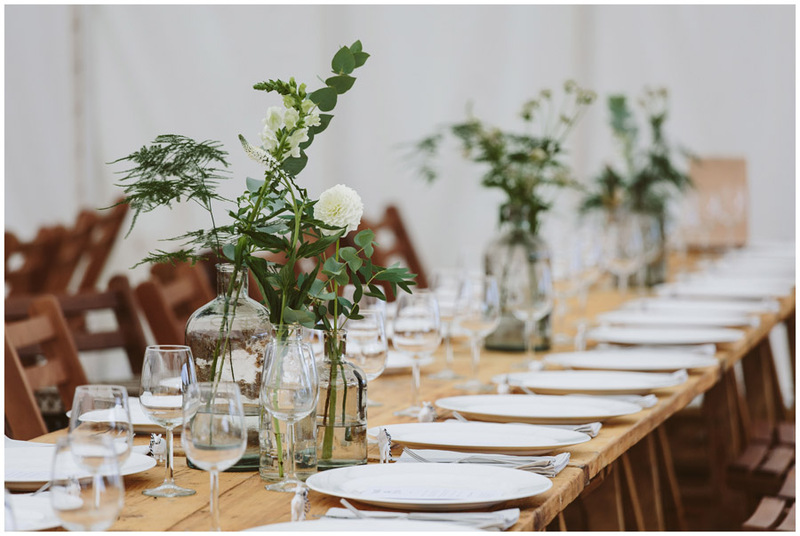 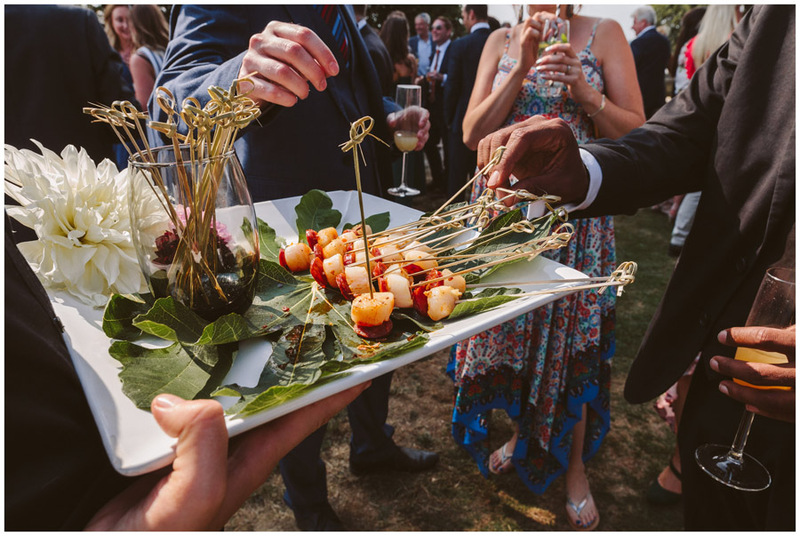 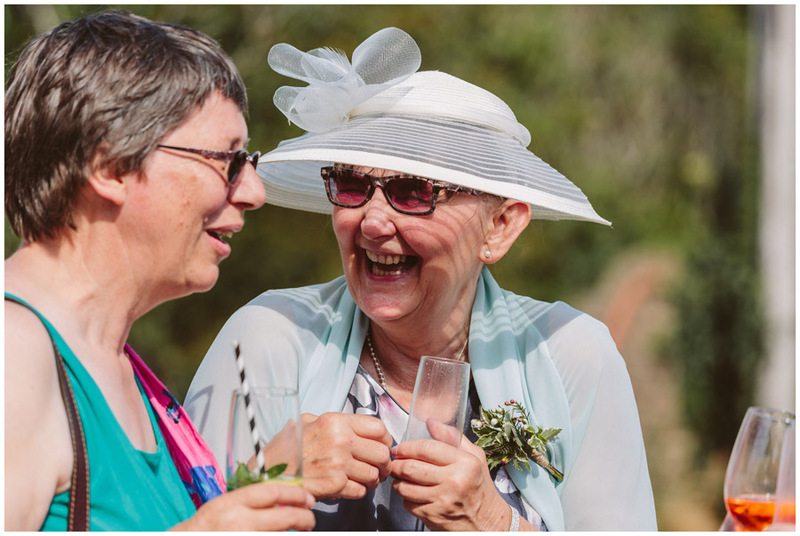 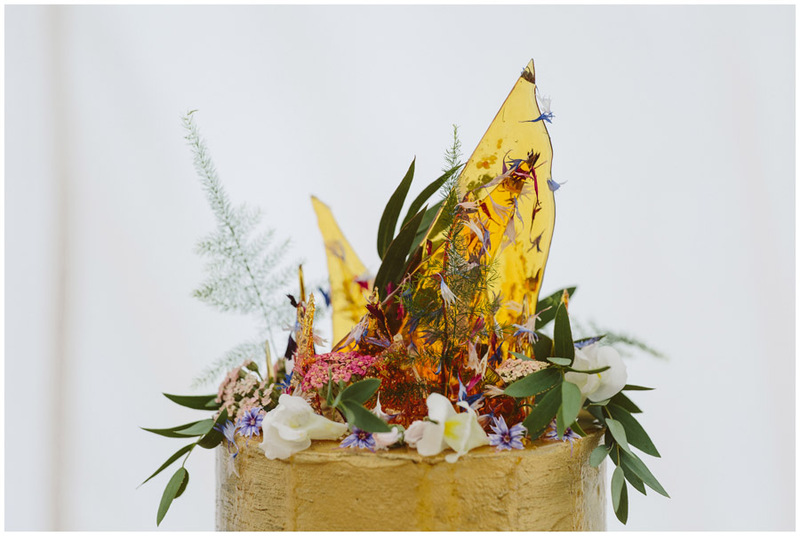 I am always excited when I get enquiries for weddings that are being held at a parents or friends houses as I find they’re usually so relaxed and laid back which suits me and my style perfectly. 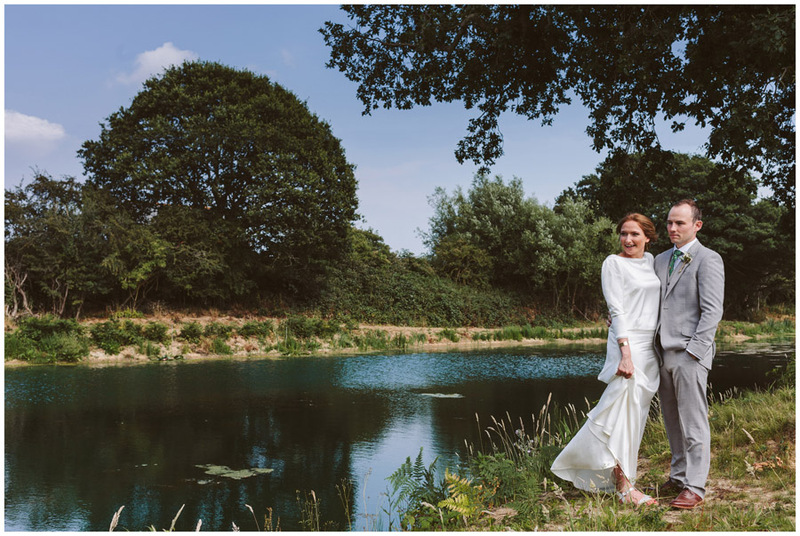 It also means I’m getting a location that no other photographer is likely to have access to and that I am also likely never to shoot at again which makes the variety amazing for me. 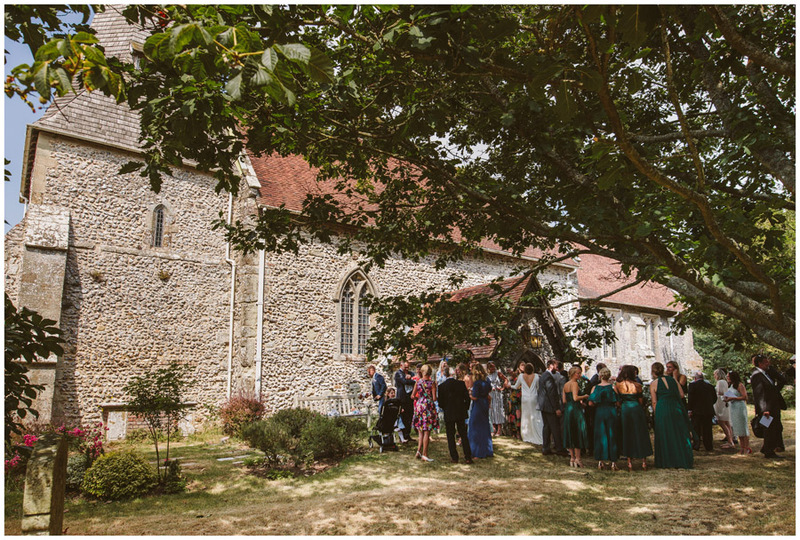 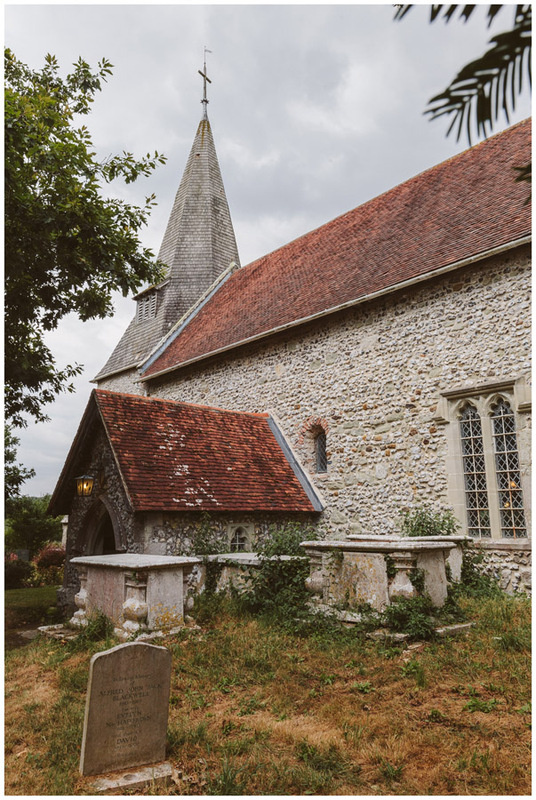 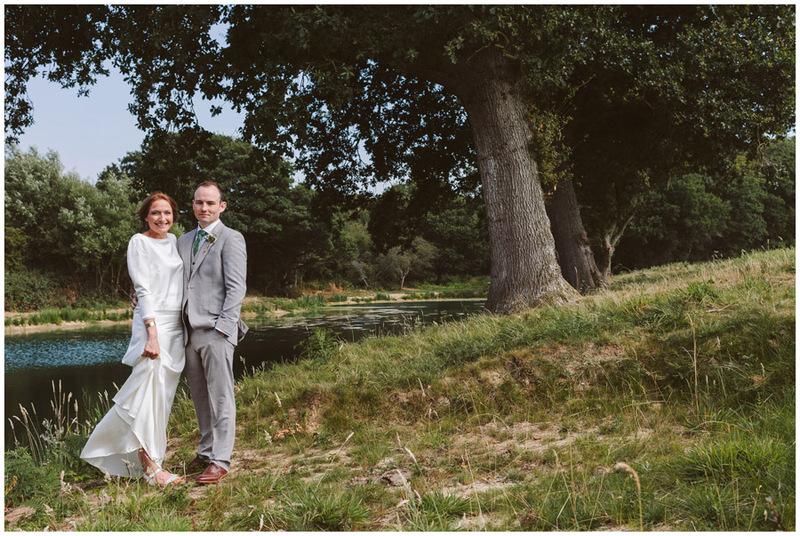 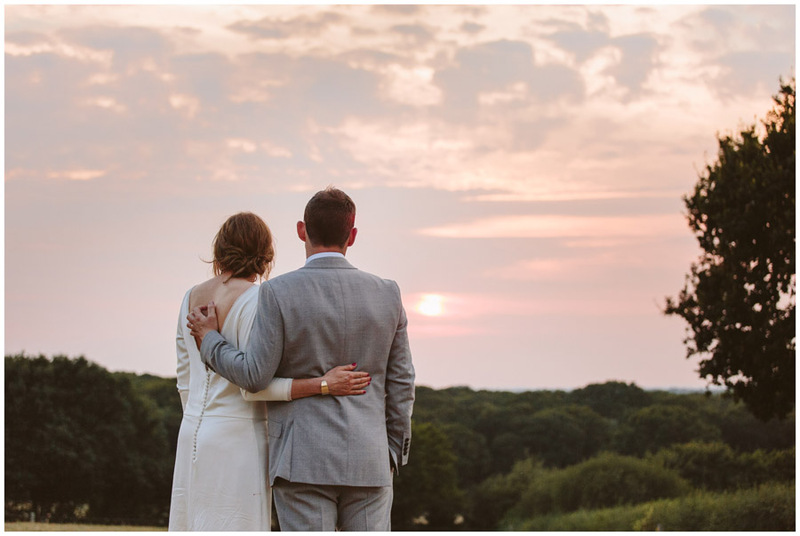 Variety is a massive part of why I love being a documentary wedding photographer, especially in Sussex as there are some truly beautiful locations that I would never otherwise know about or have access to. 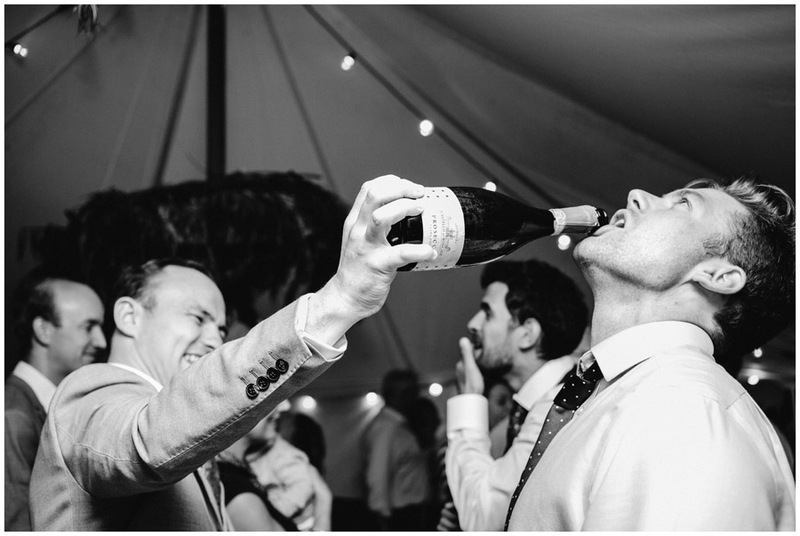 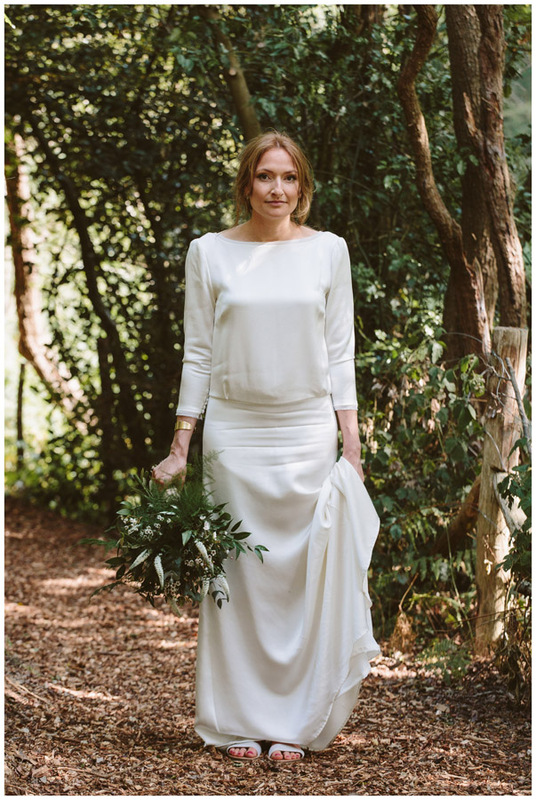 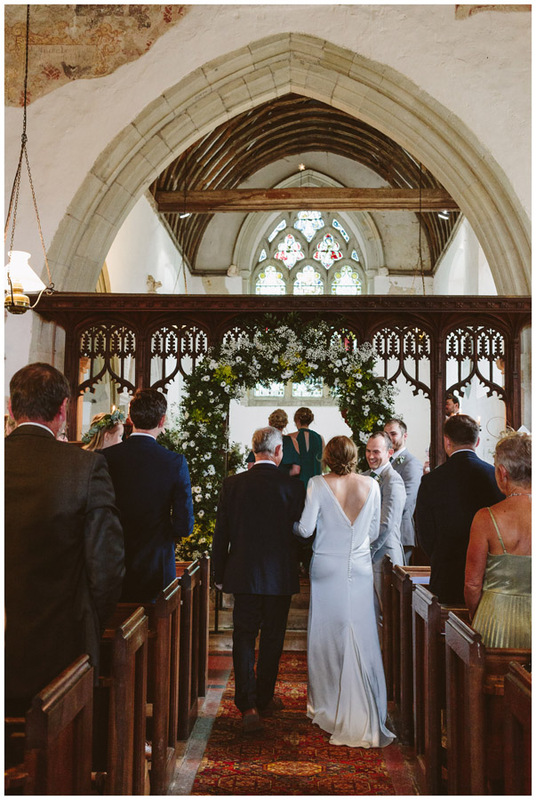 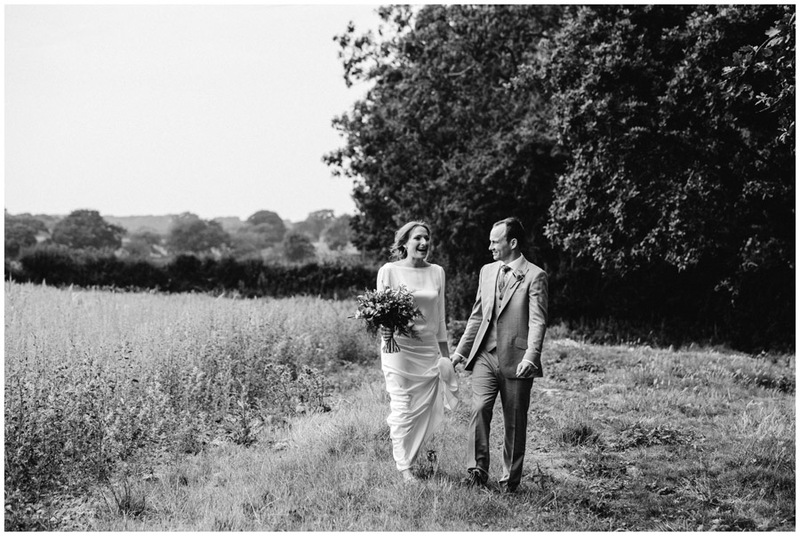 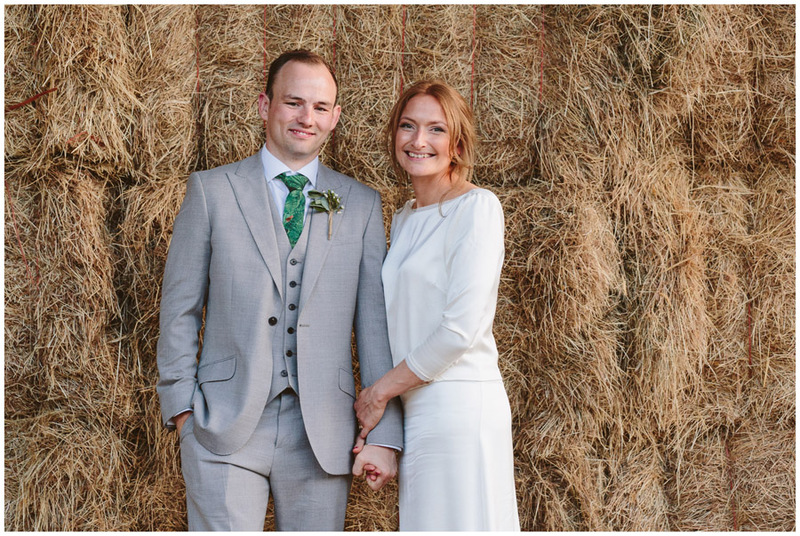 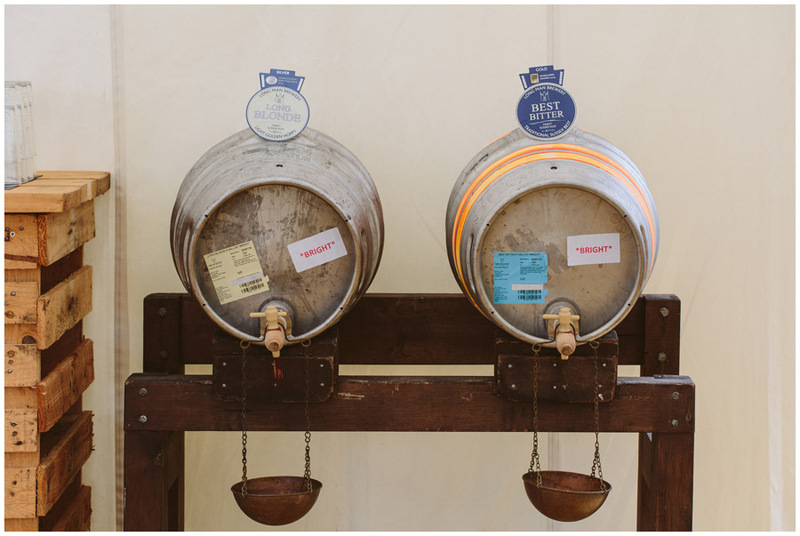 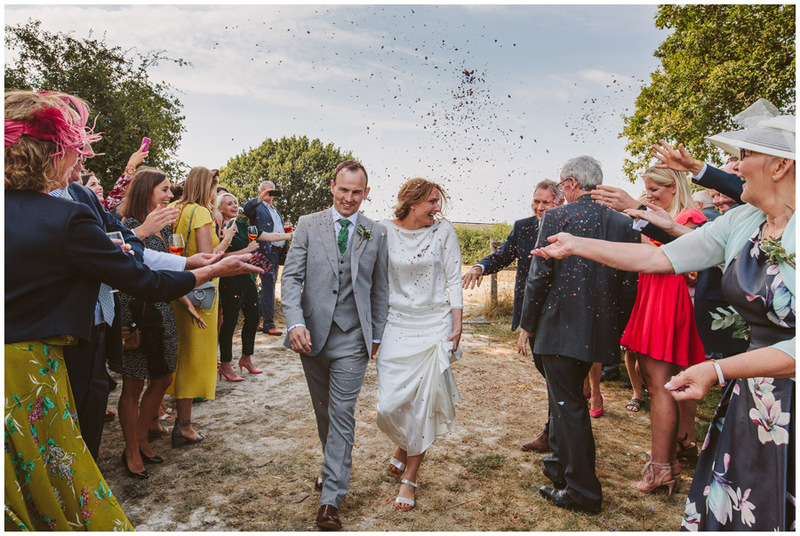 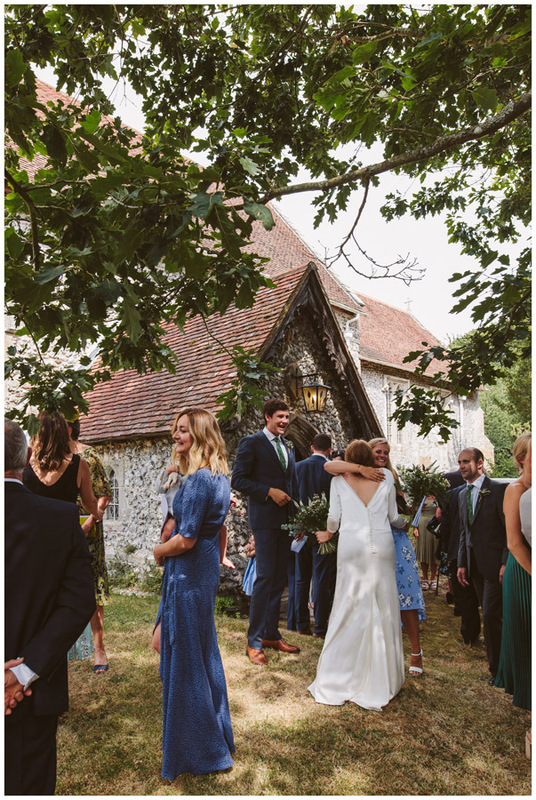 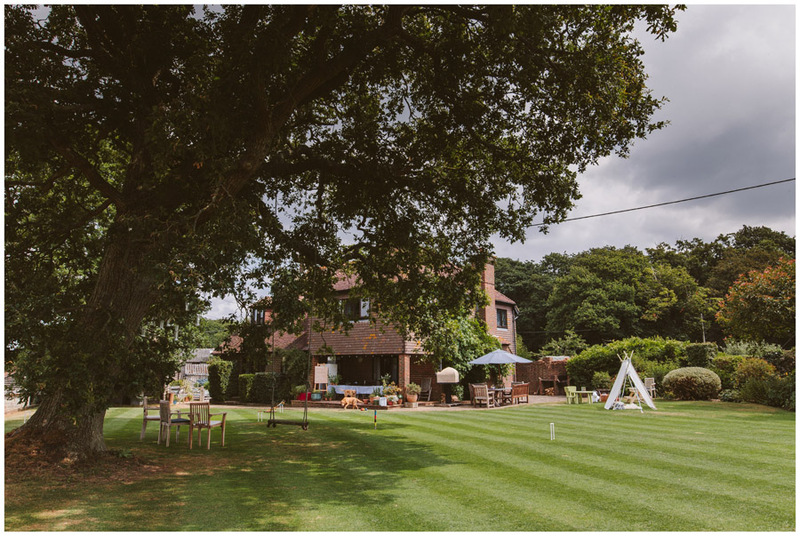 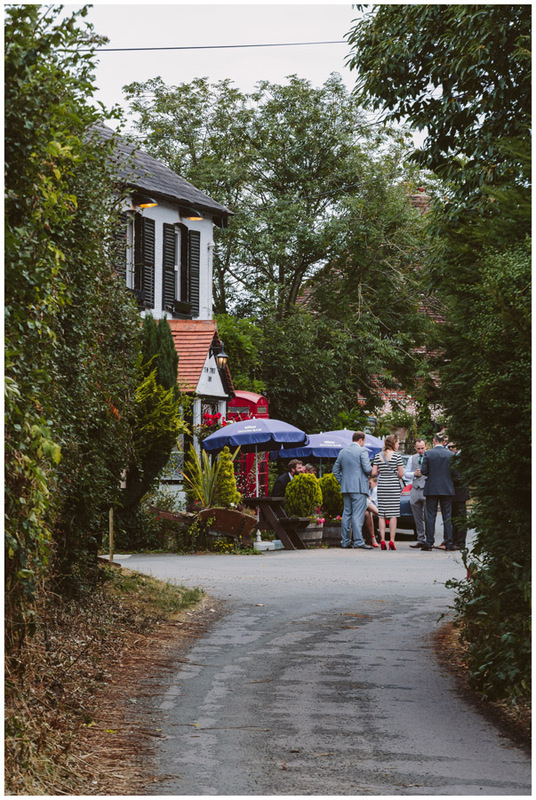 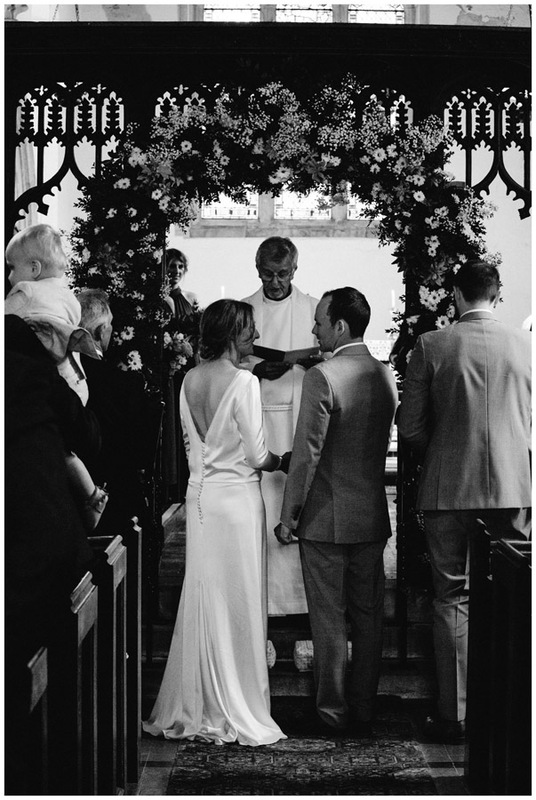 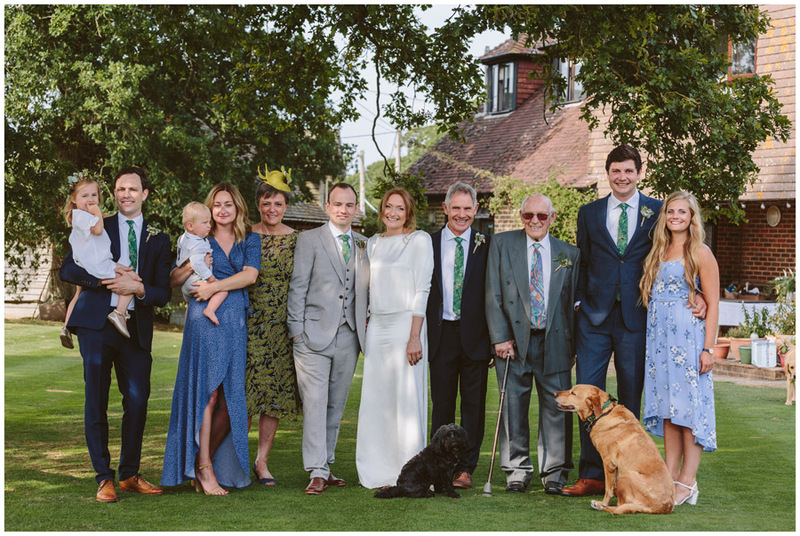 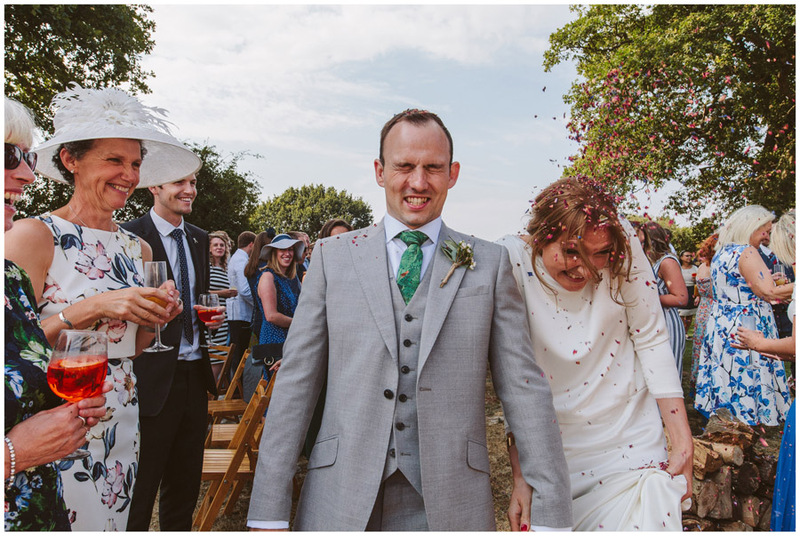 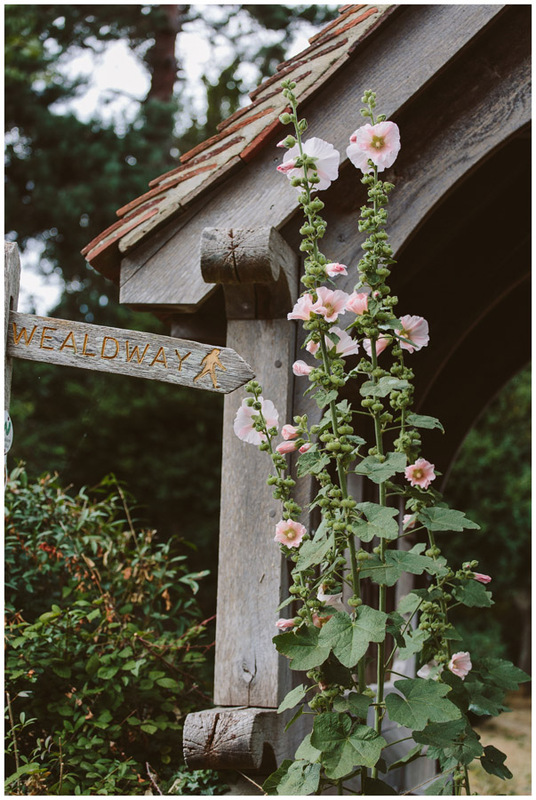 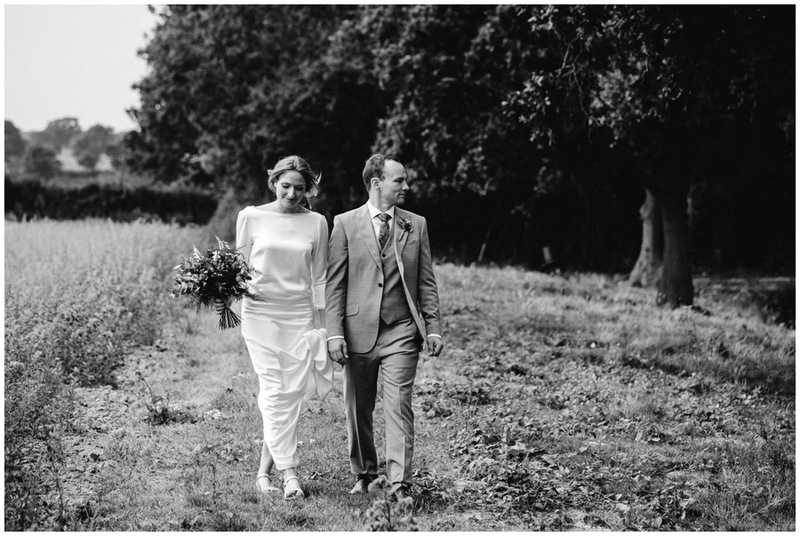 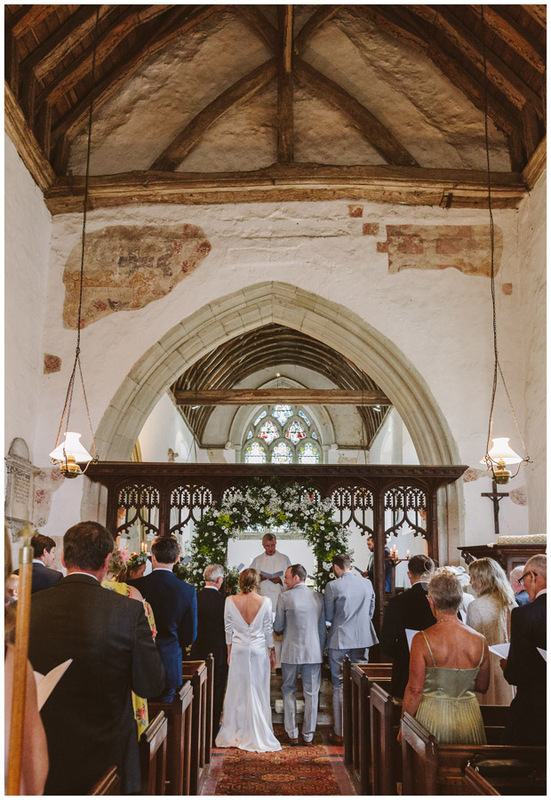 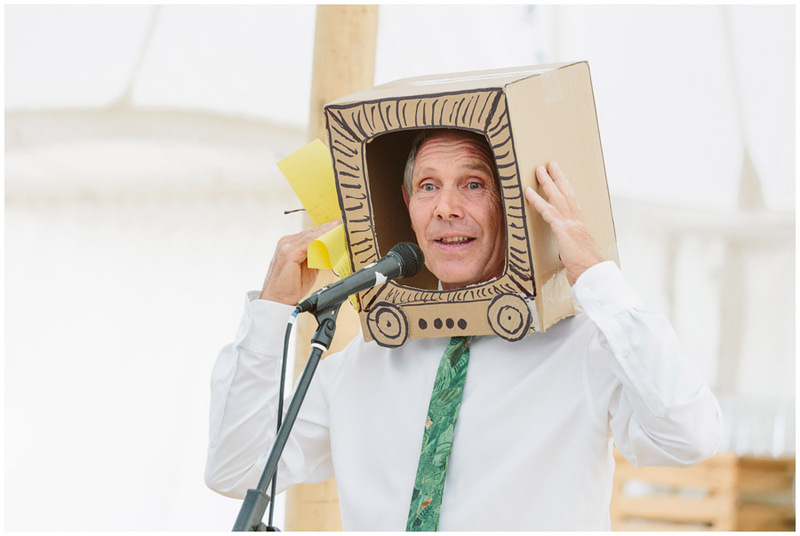 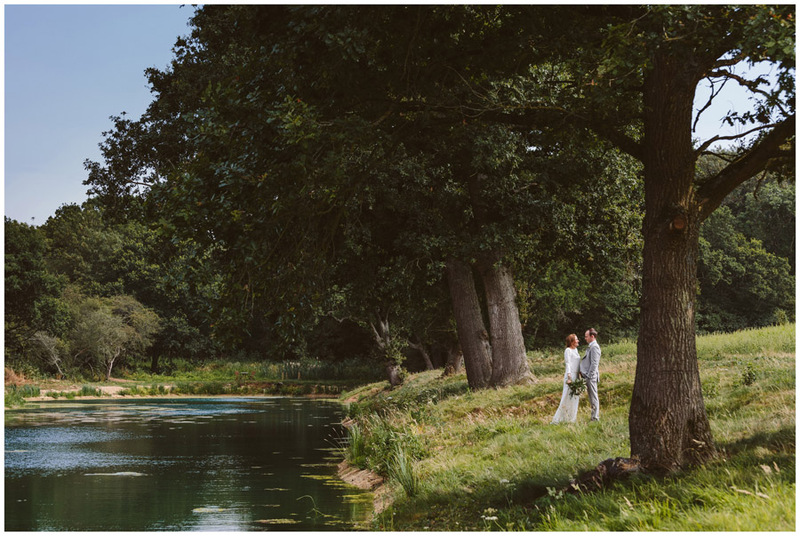 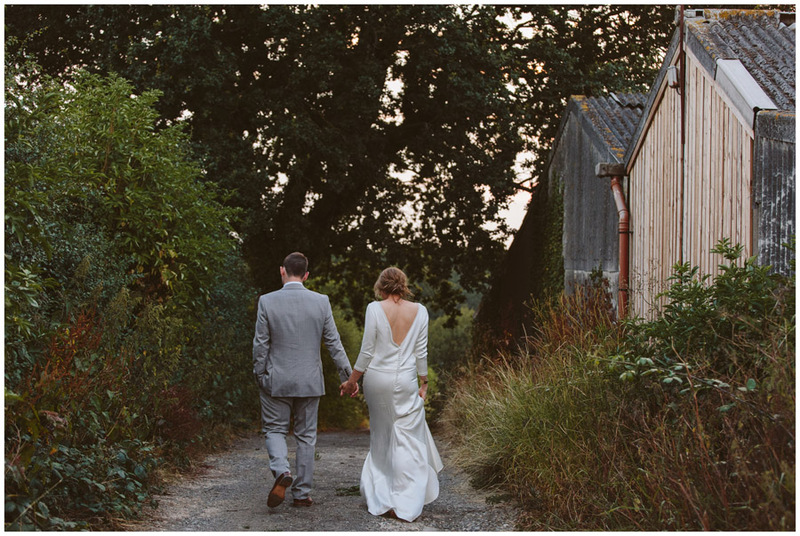 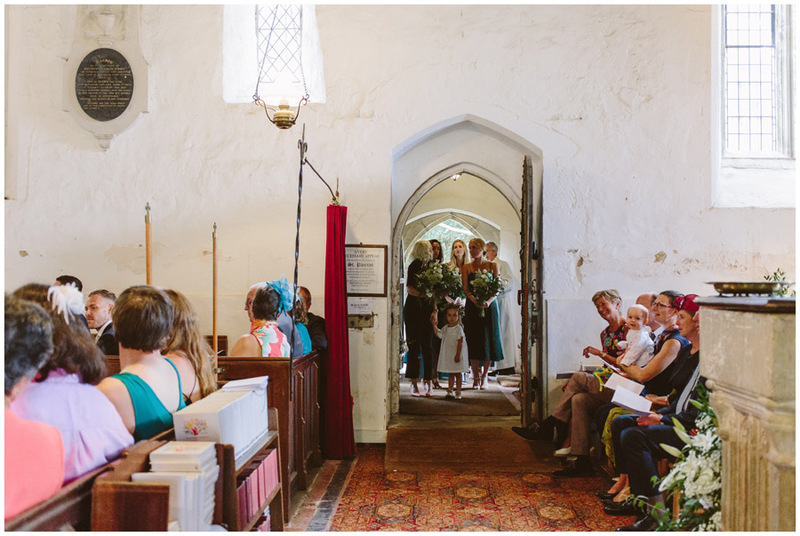 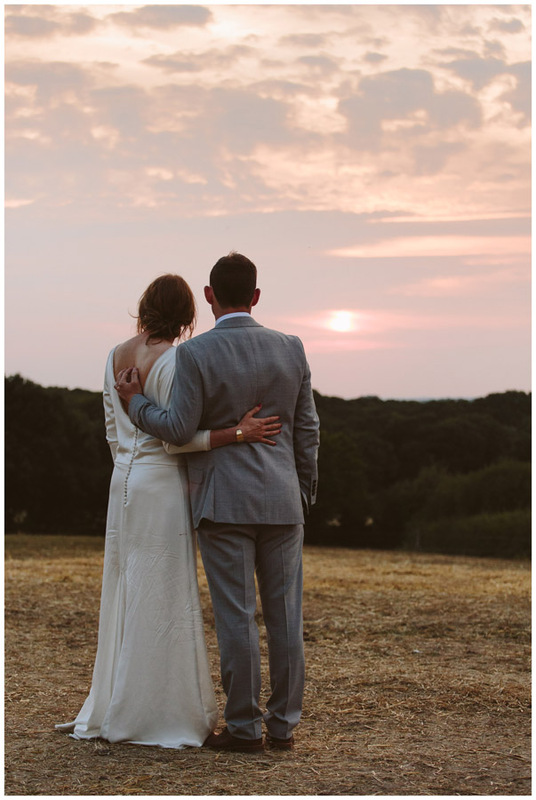 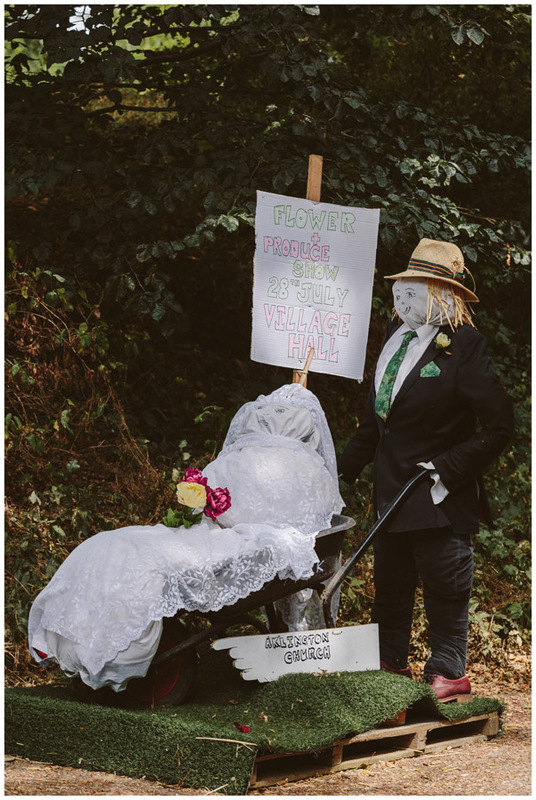 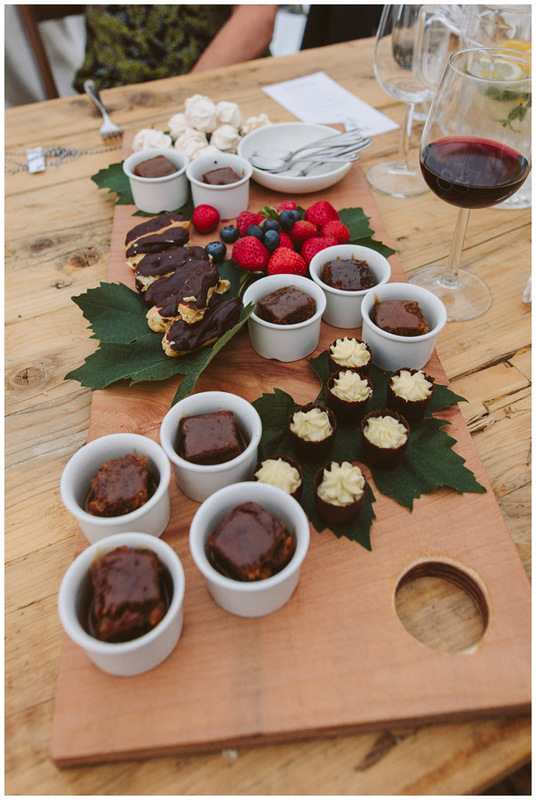 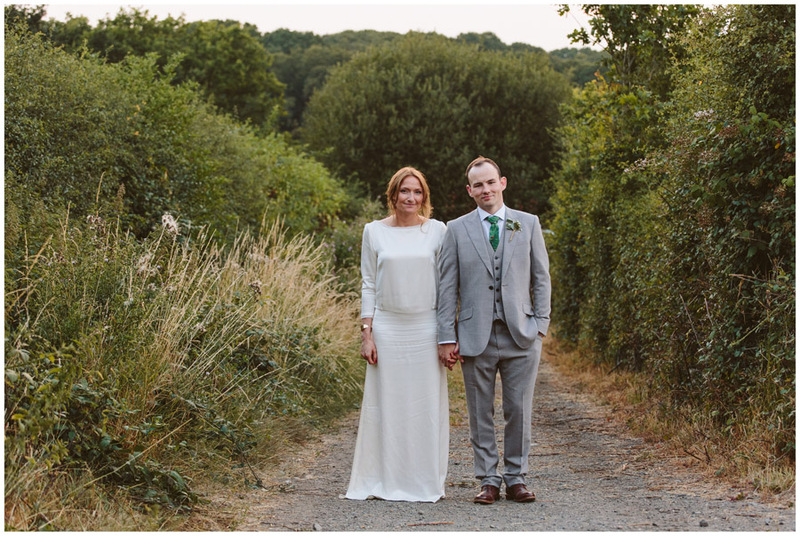 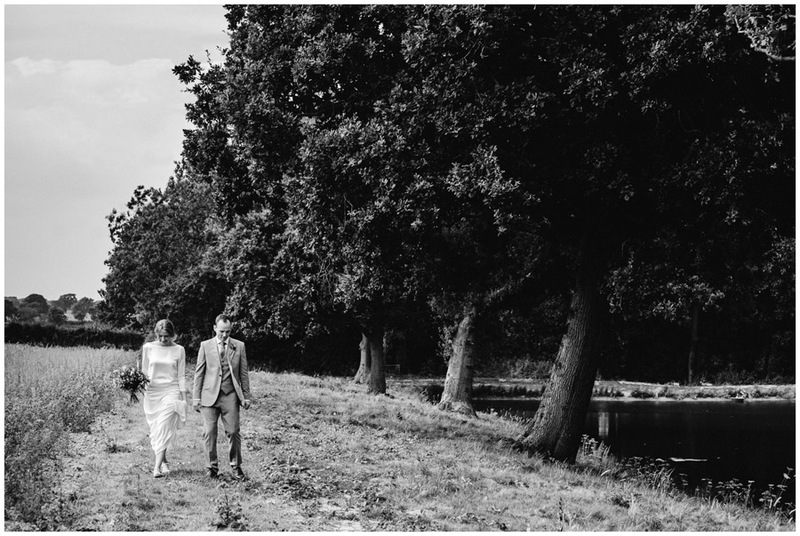 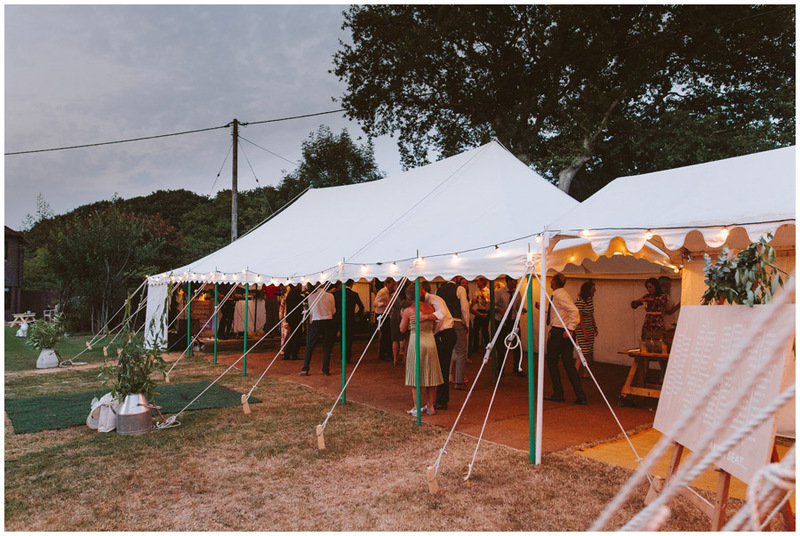 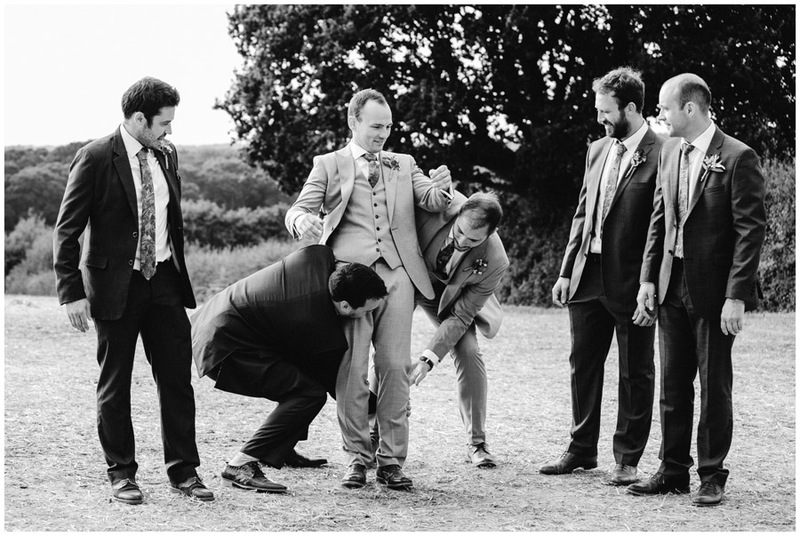 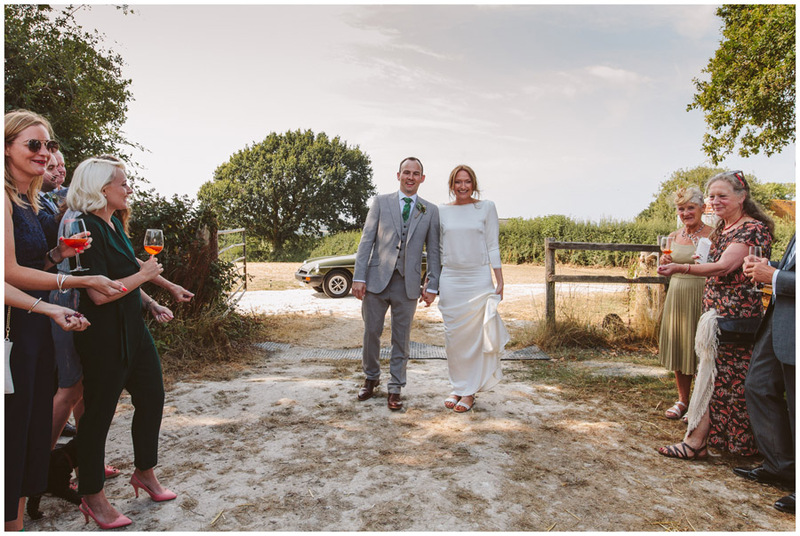 On this occasion the location was my brides family home which is on a working farm in Sussex – VERY exciting! 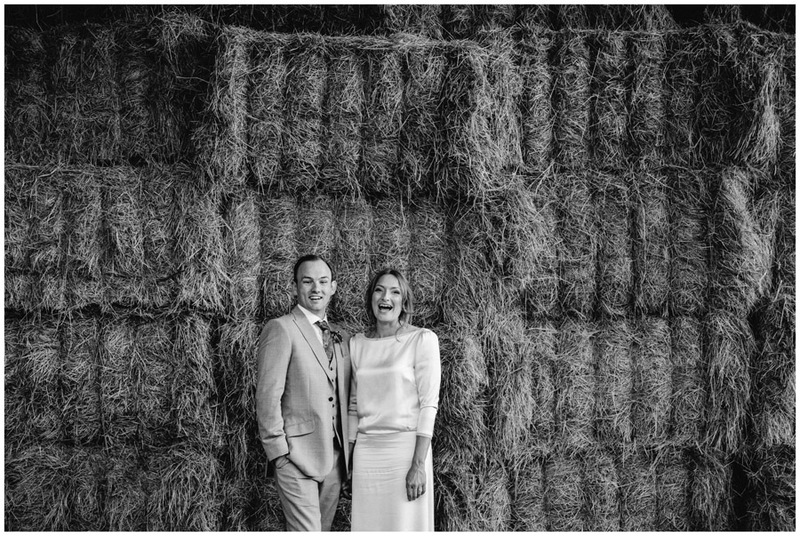 J&M were having an engagement shoot before their day so we decided to do this at the farm so we could have a good scout around for their wedding day and use some different locations for the two different shoots, it was a stunning hot day when I met them at the farm for the E-Shoot where I also met J’s parents who were so welcoming and warm towards me, even offering me a lovely glass of local sparkling wine – YUM!! 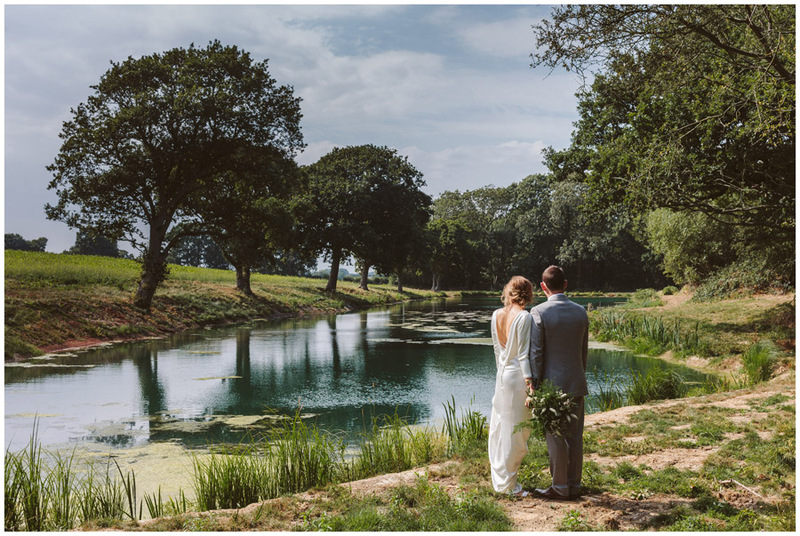 – as we sat around chatting after the shoot looking out at the beautiful views as the sun grew low ……… I couldn’t wait to be back here for their wedding day! 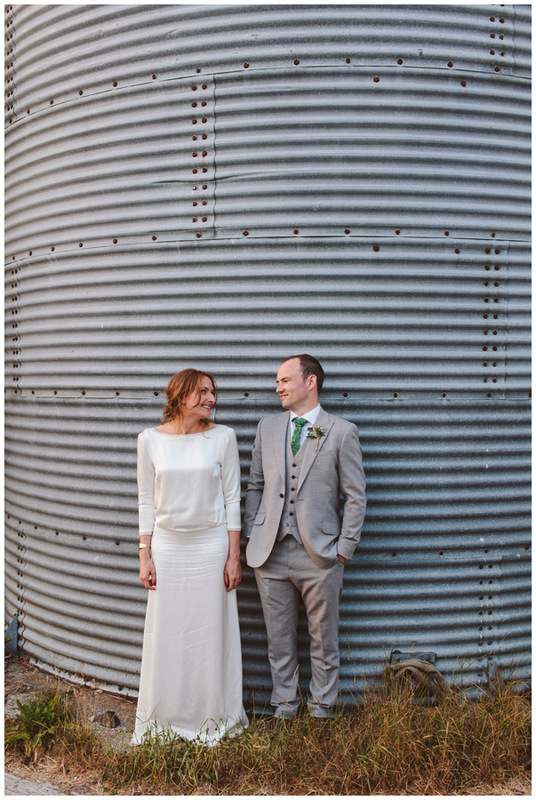 We were so lucky to have another sunny and warm day for their wedding on the farm. 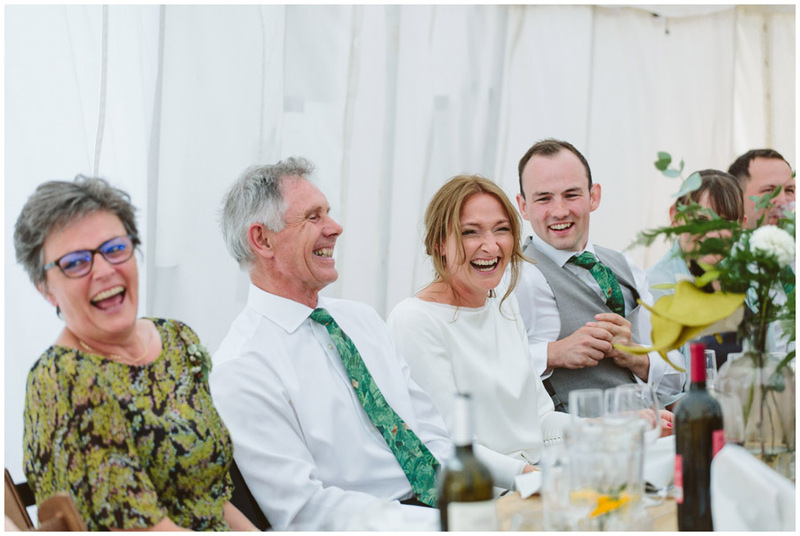 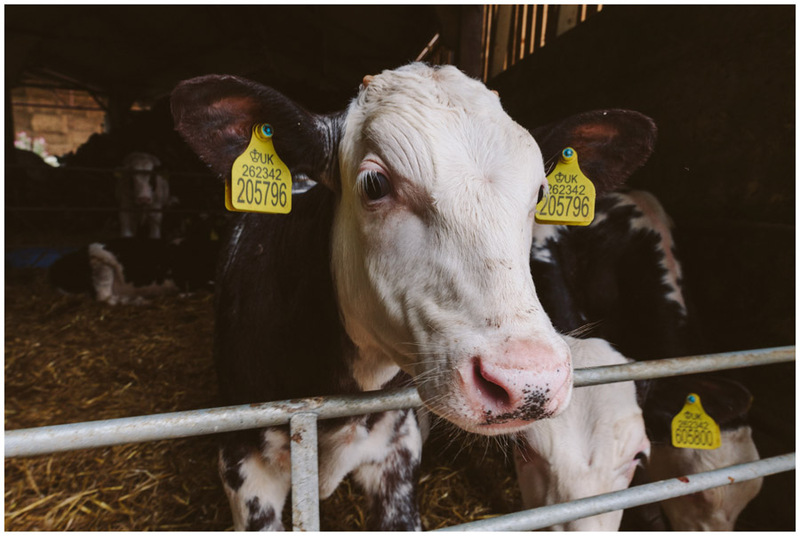 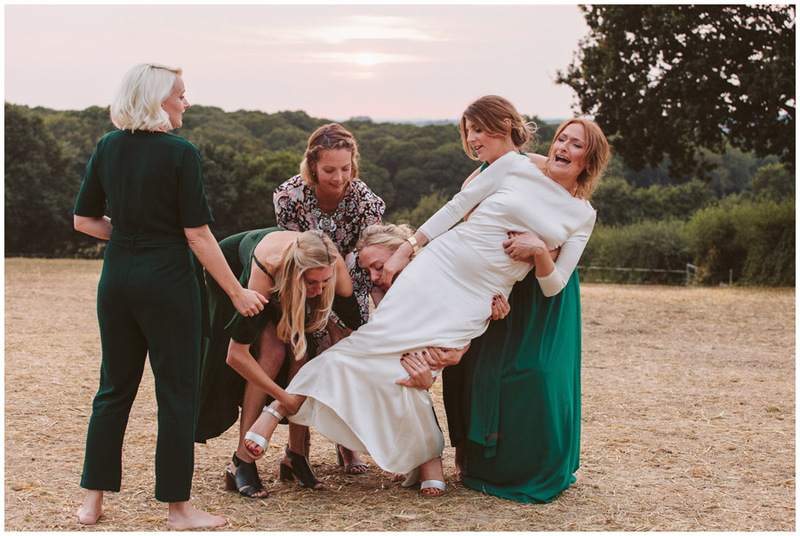 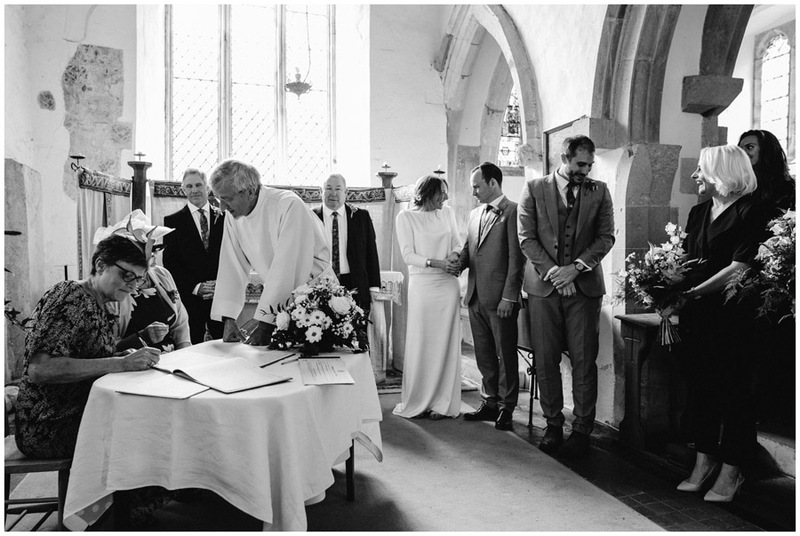 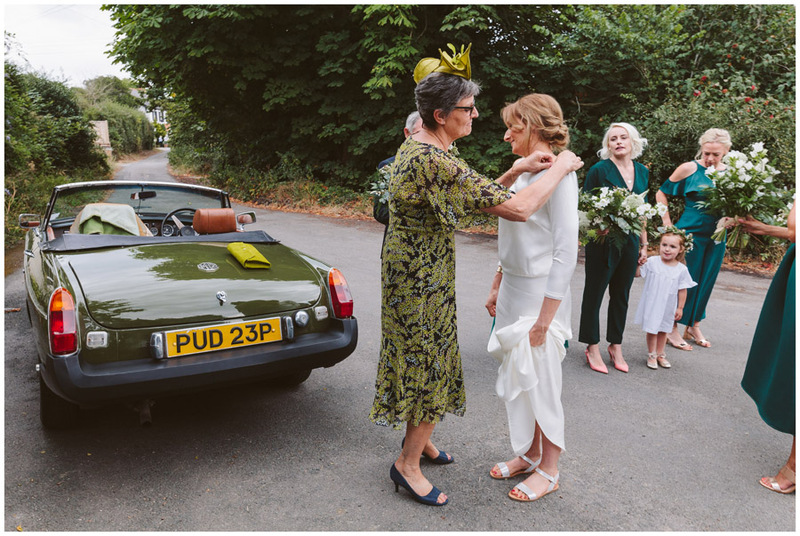 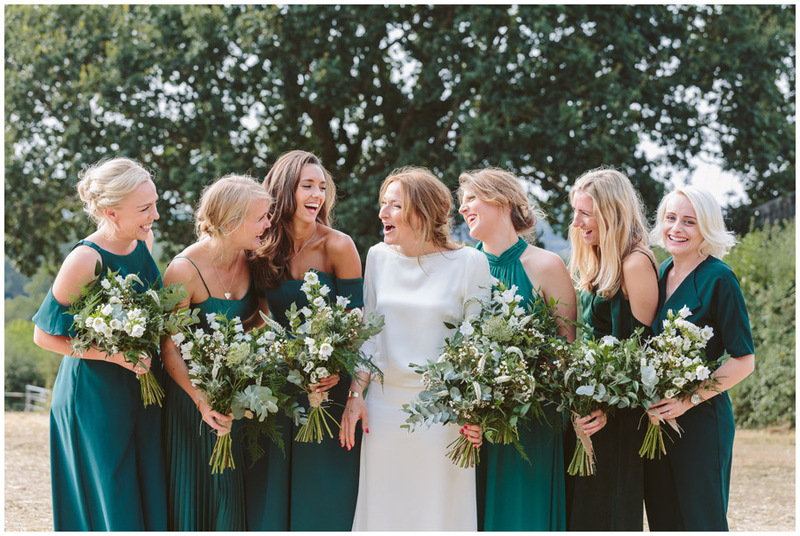 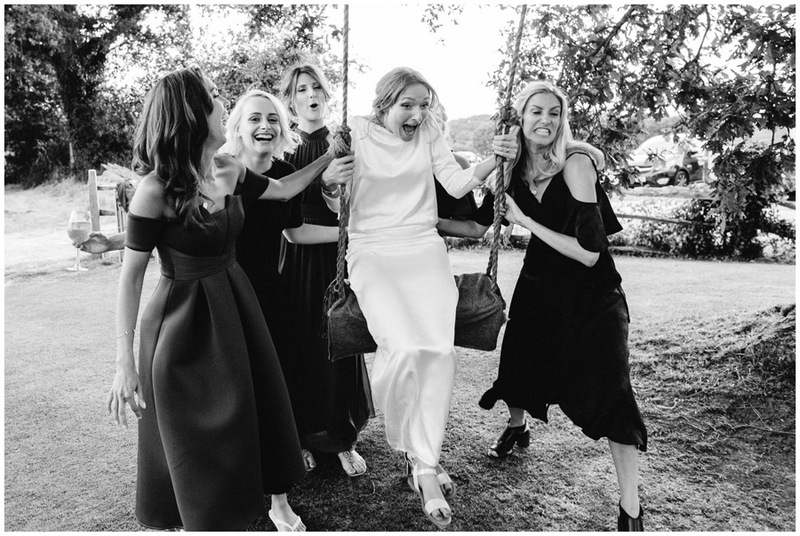 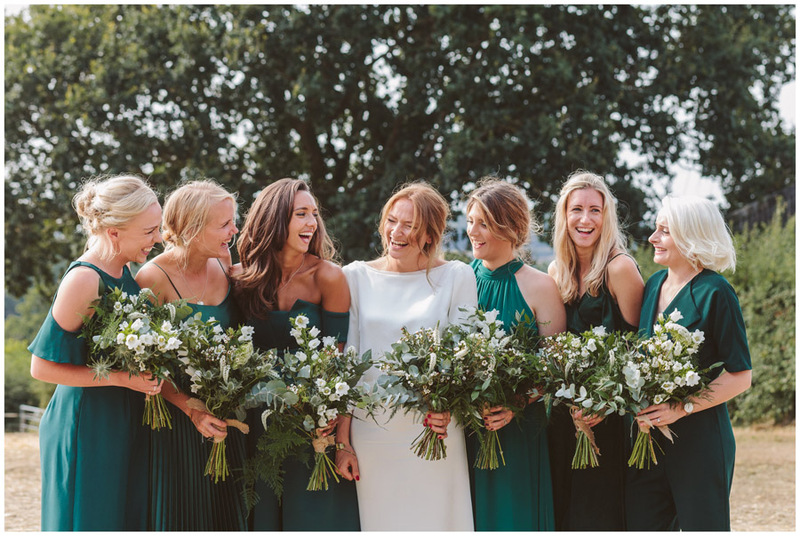 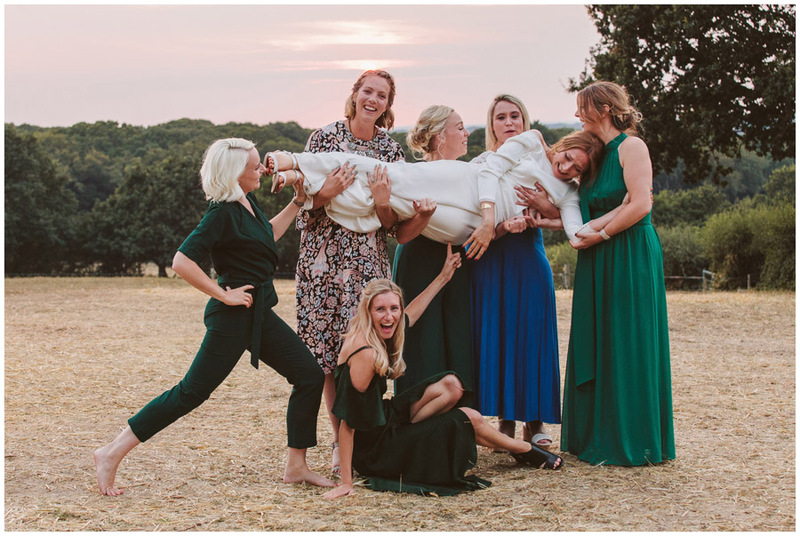 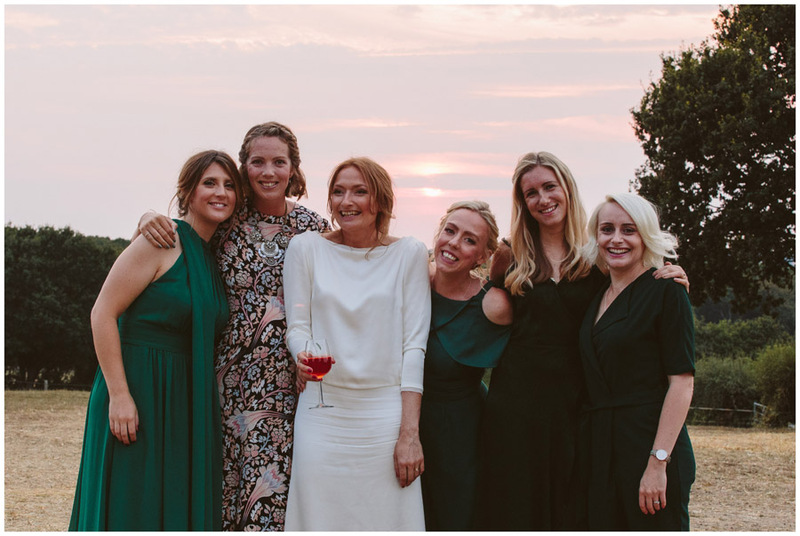 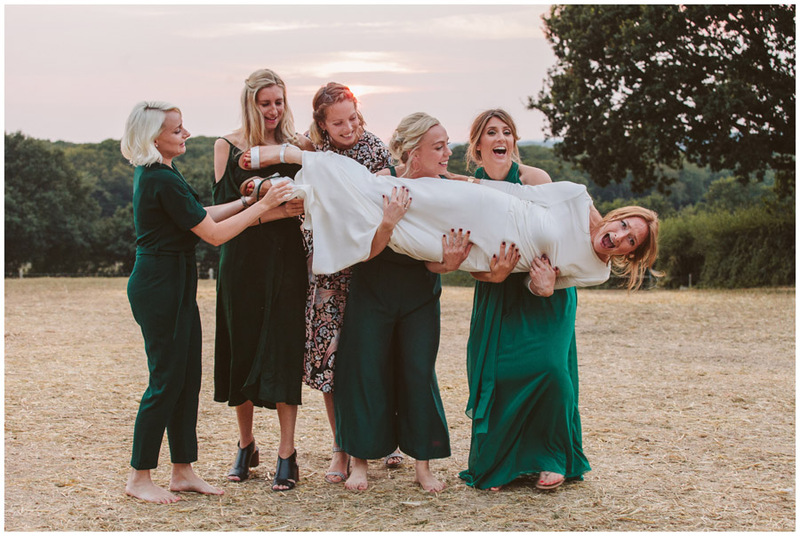 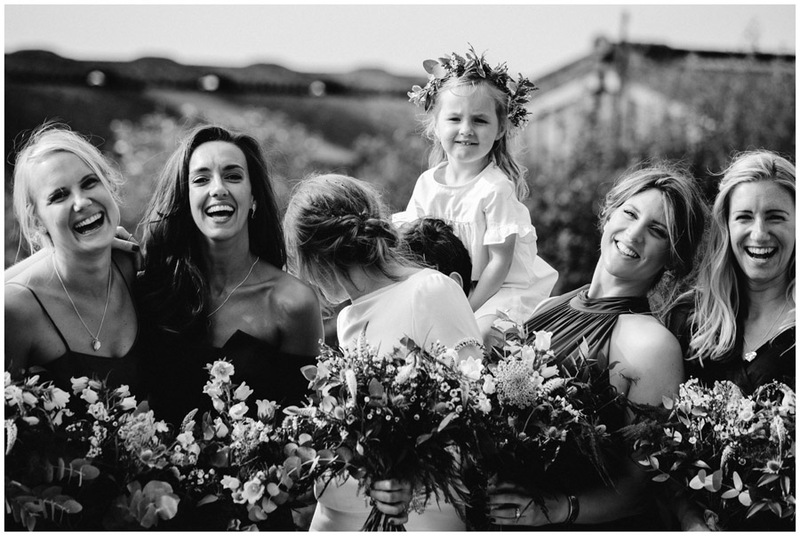 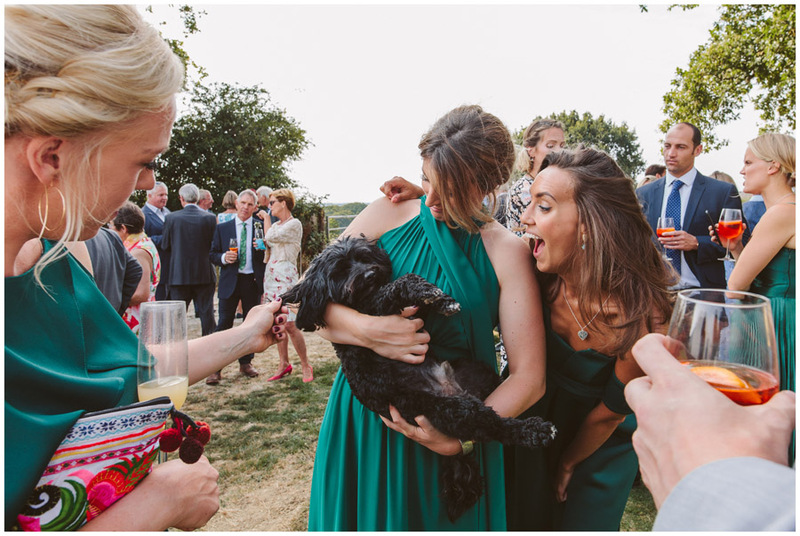 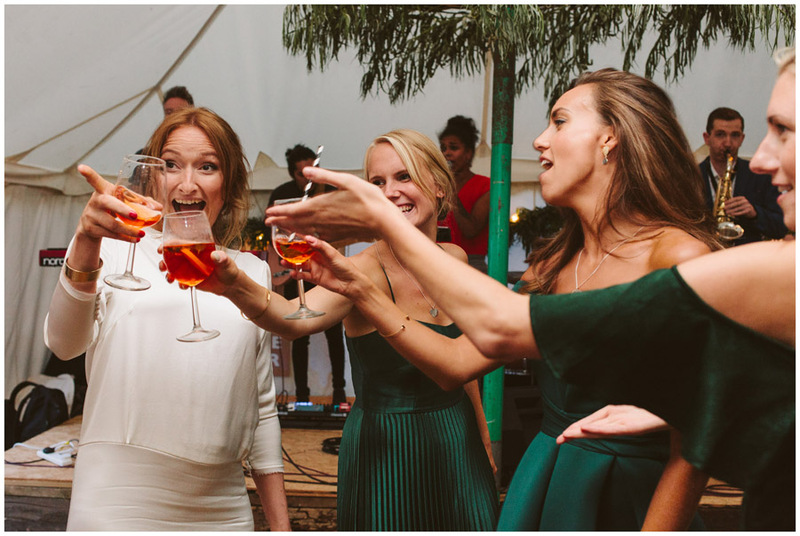 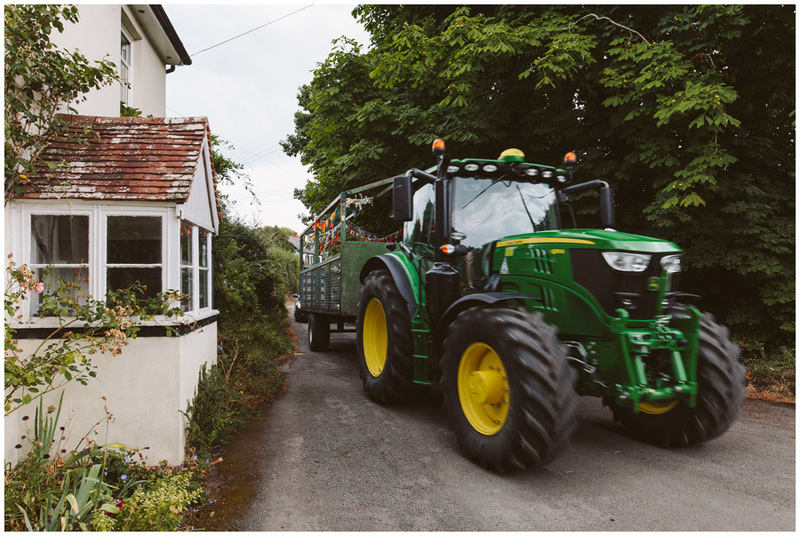 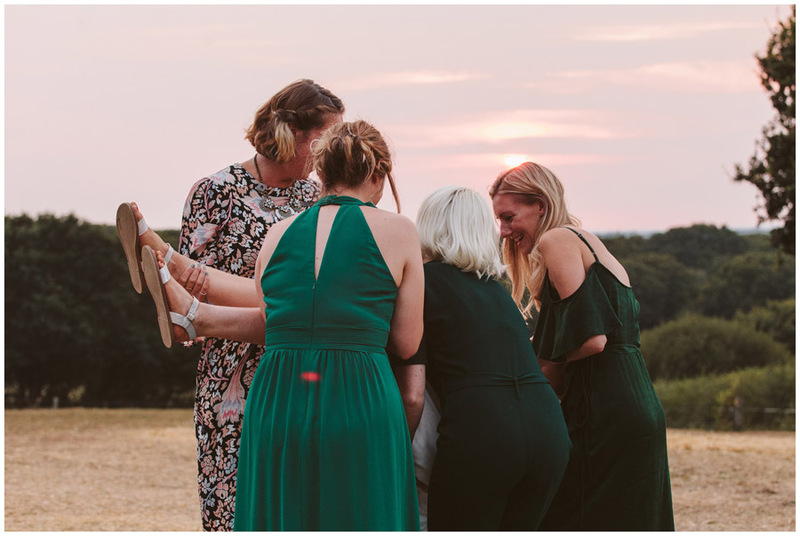 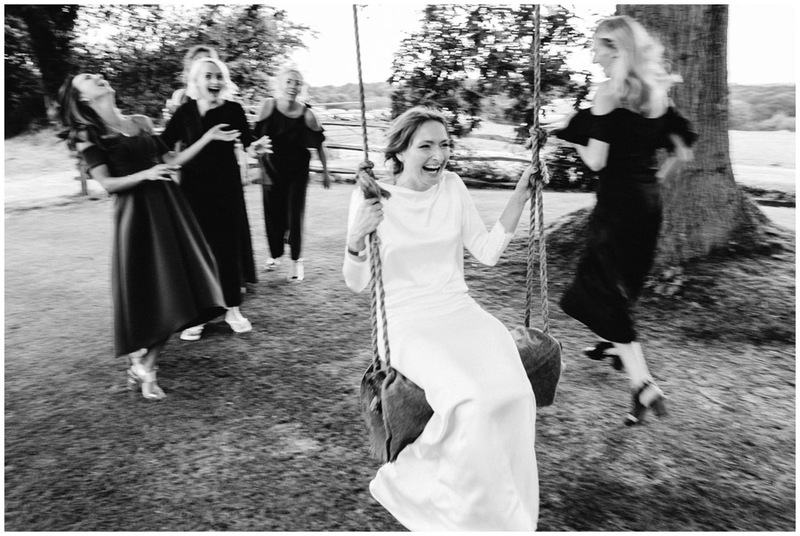 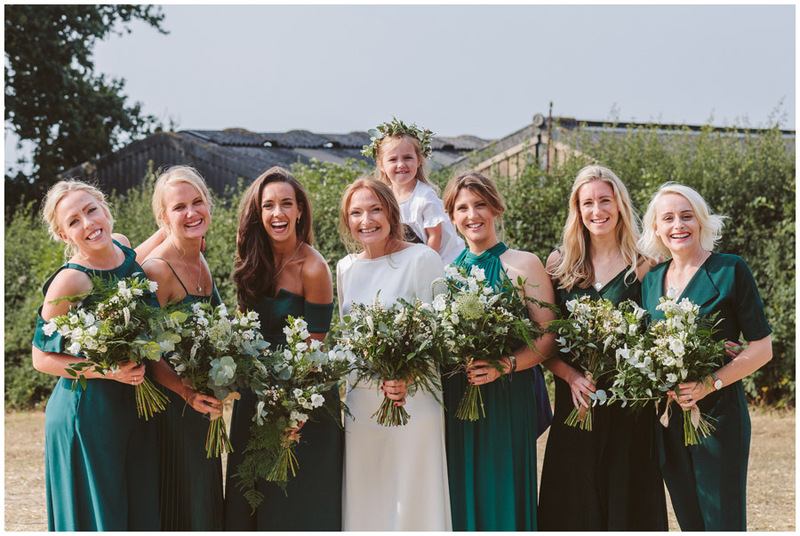 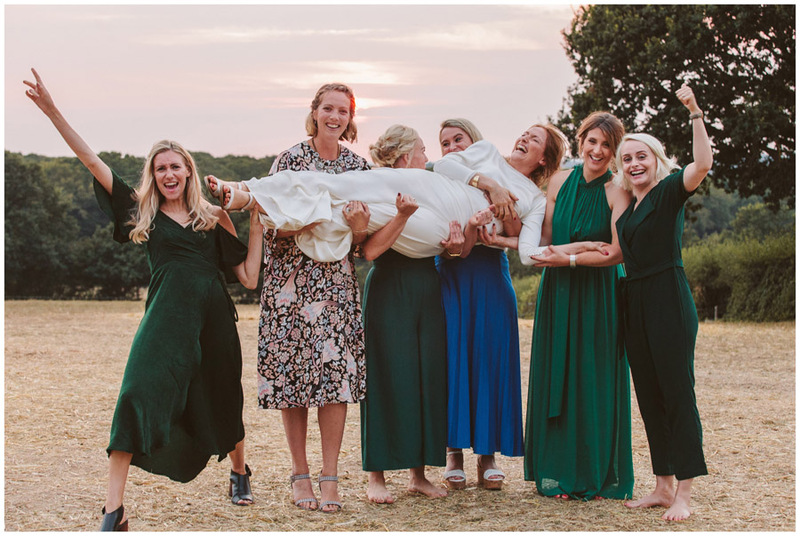 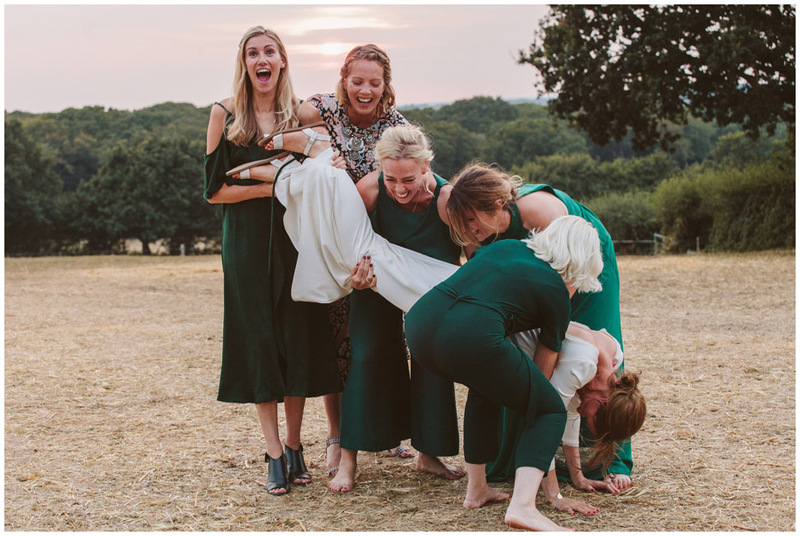 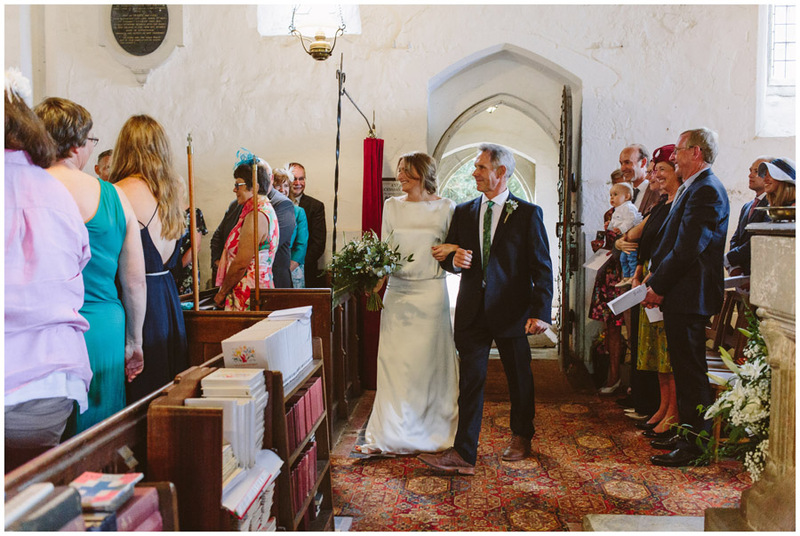 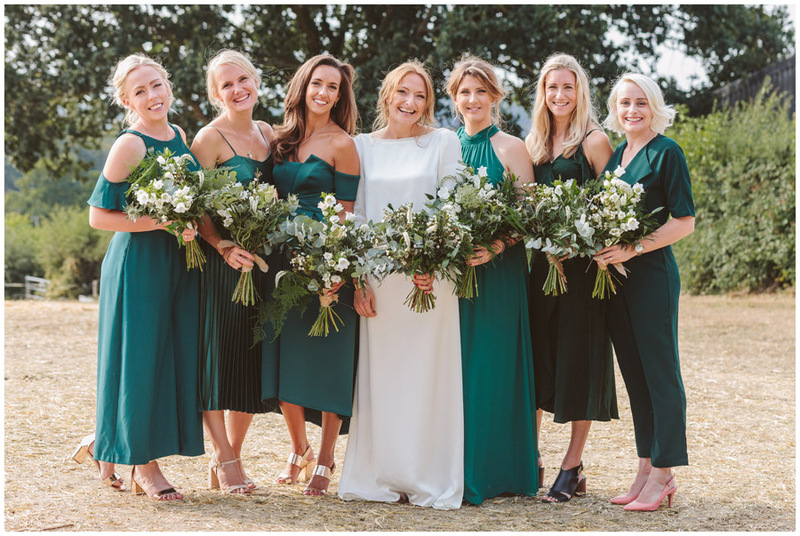 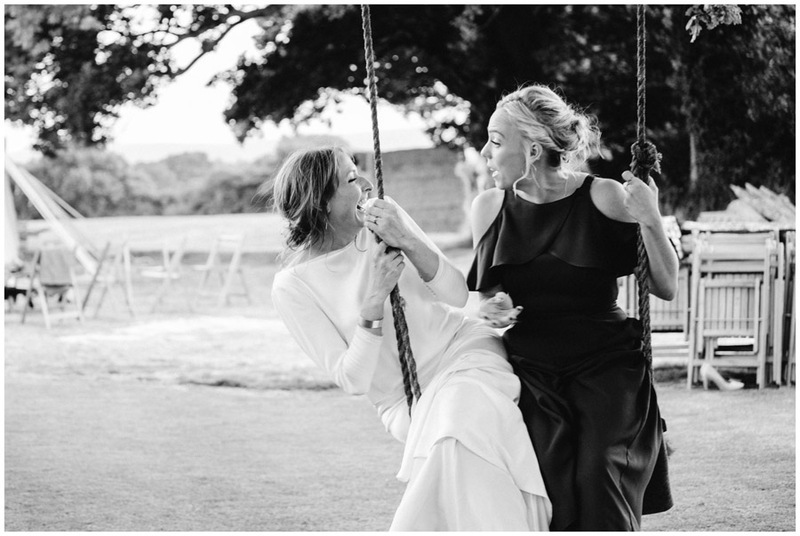 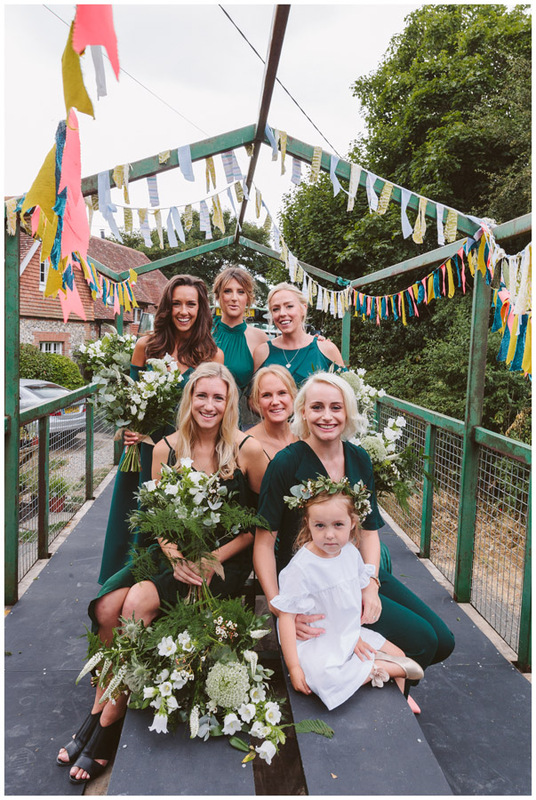 I started with morning prep at the house with the girls and as the church was only 5 mins down the road I grabbed a lift with a family member while the bridesmaids and some guest were driven on a trailer pulled by a tractor – PERFECT right!! 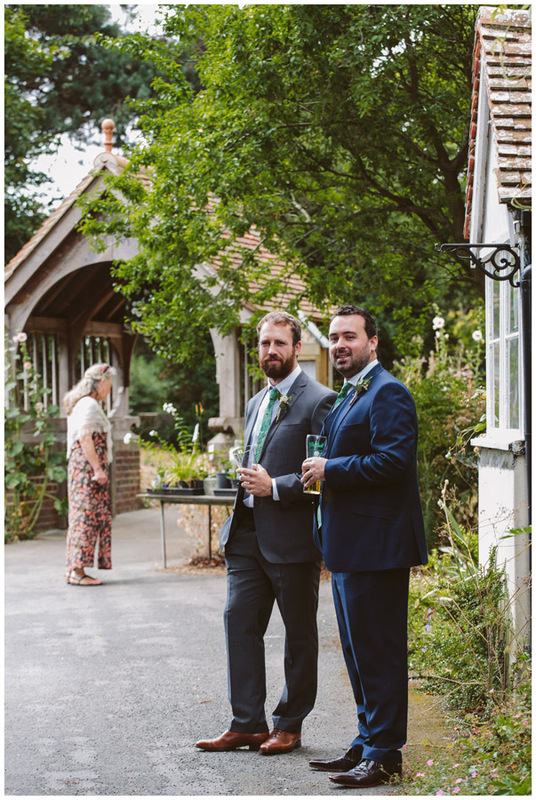 I got there a little early so that I could get some photos of the boys at the pub just a minutes walk from the church. 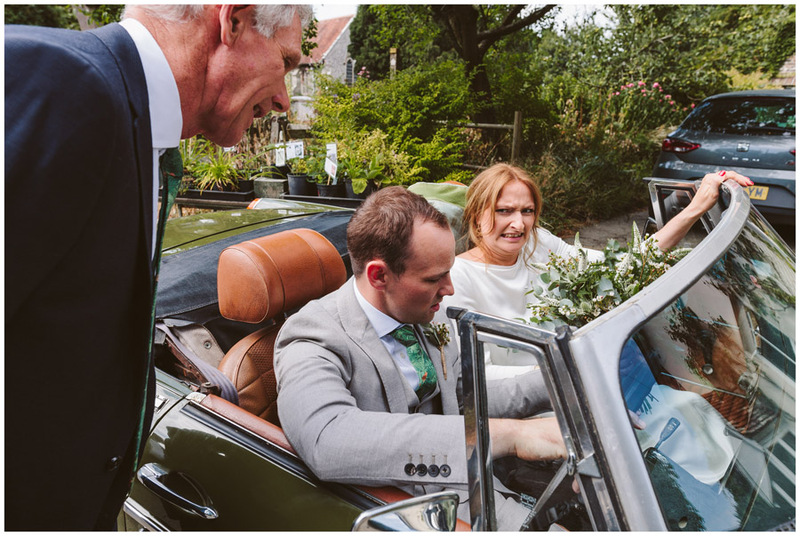 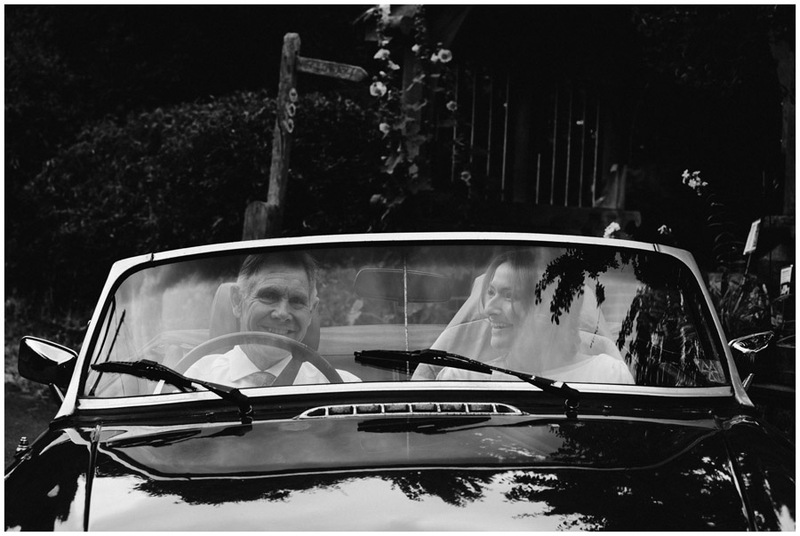 After the ceremony my couple drove themselves in my brides dads beautiful MG around to the back of the farm land. 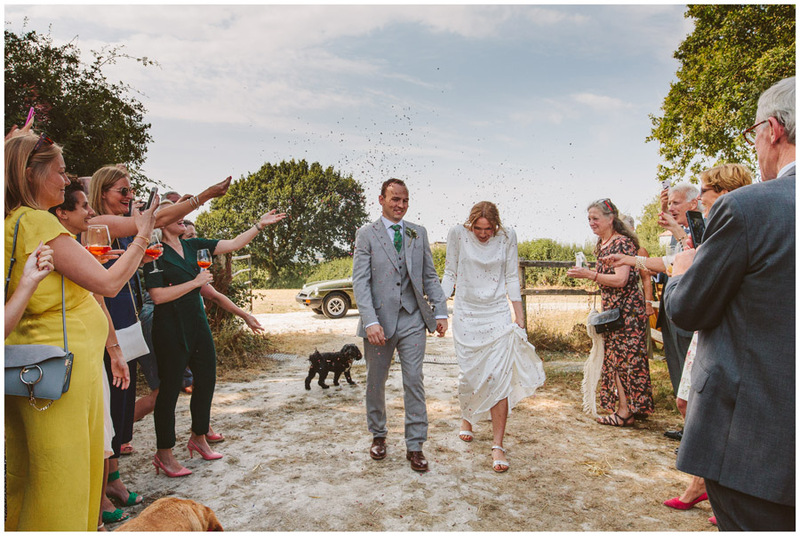 I met them with her brother and partner in the Landrover where my bride and groom joined us and we drove across the fields to the lake. 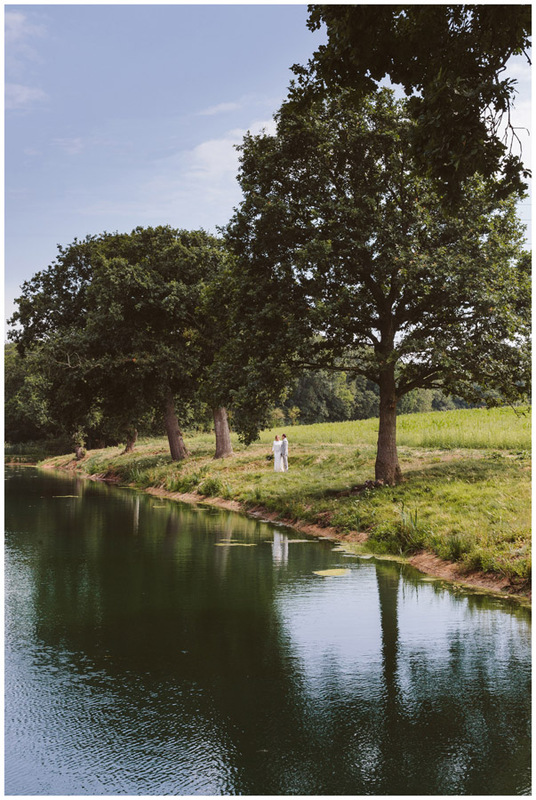 Her brother had also organised some champagne at one end of the lake as a surprise which was lovely. 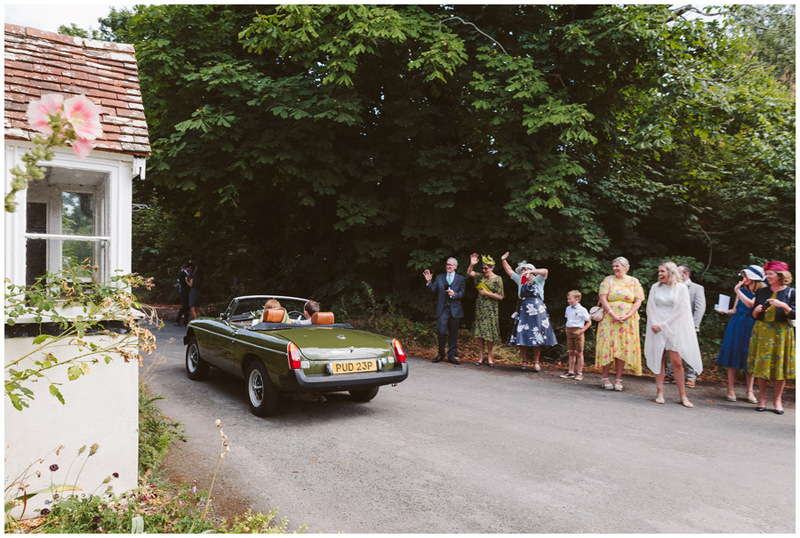 After photos we all drove back up to the house – where the MG had been driven back around (oh yes it was all vey well organised!) 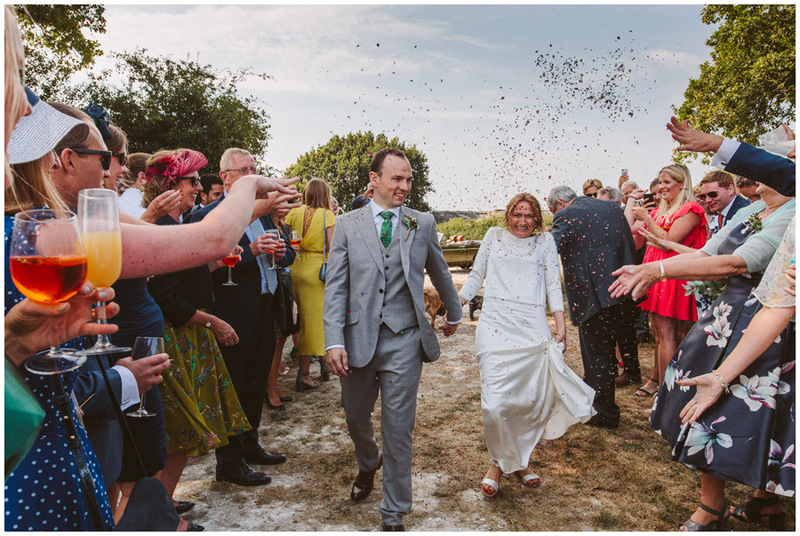 so my couple could make their entrance straight to a confetti line! 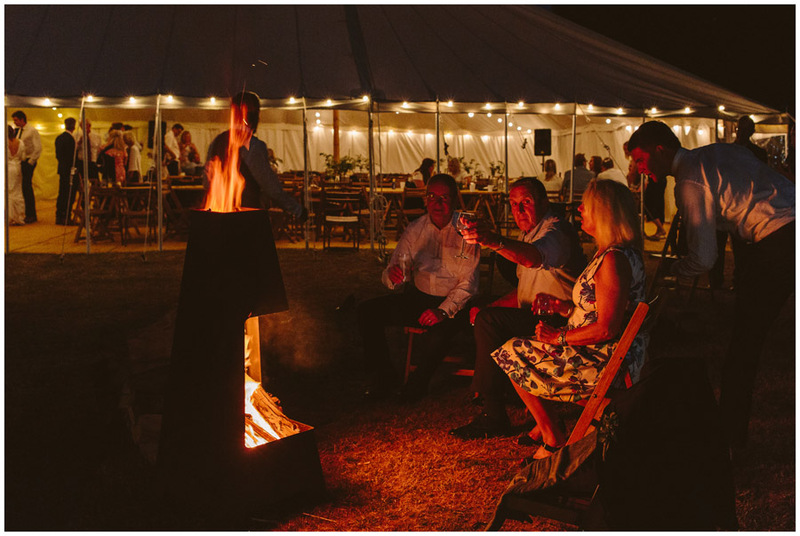 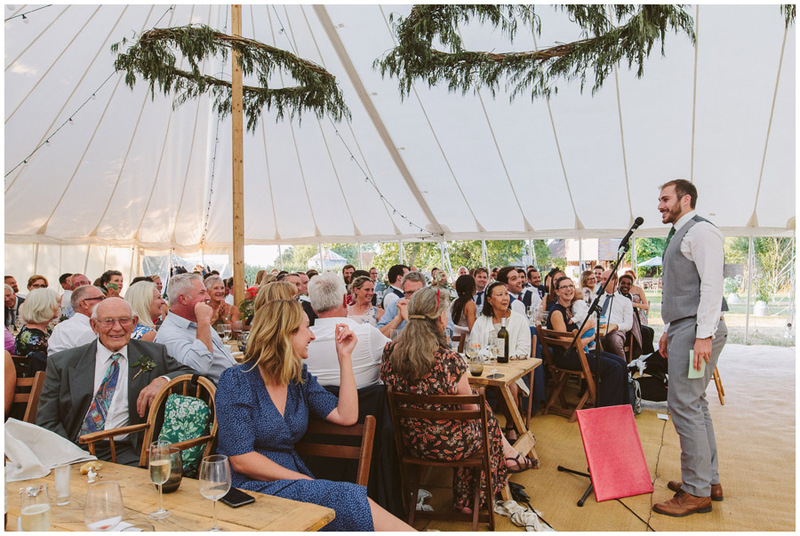 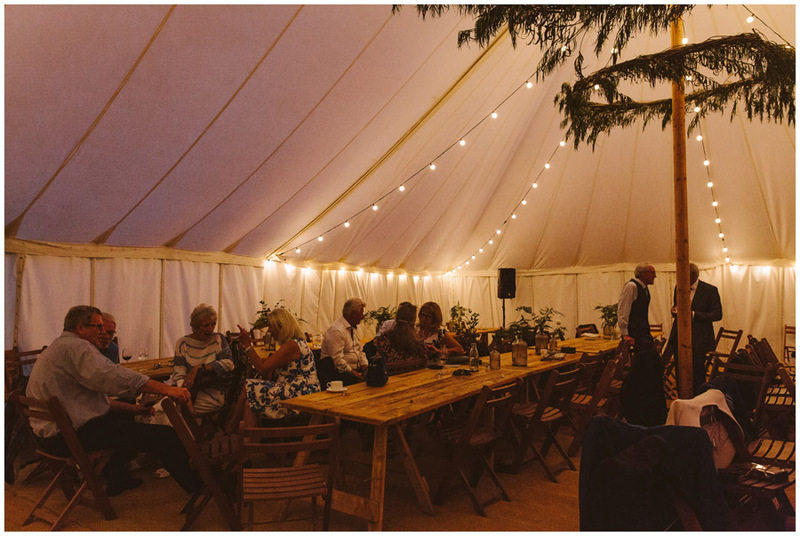 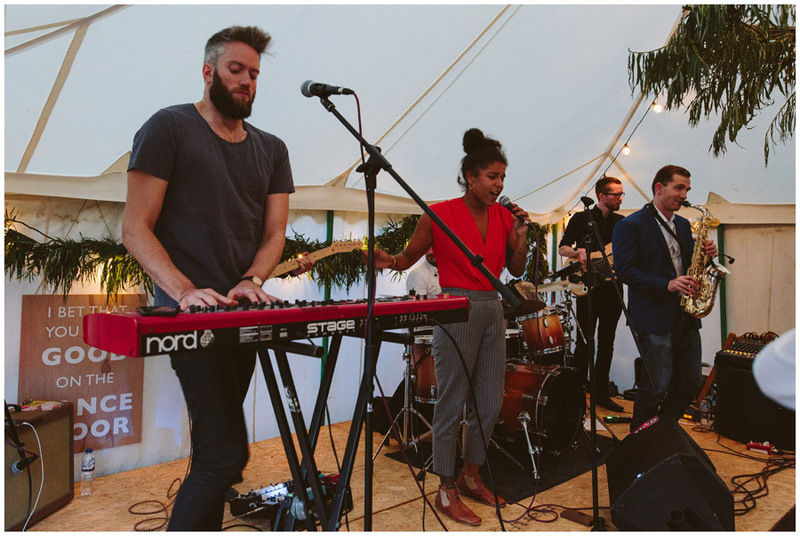 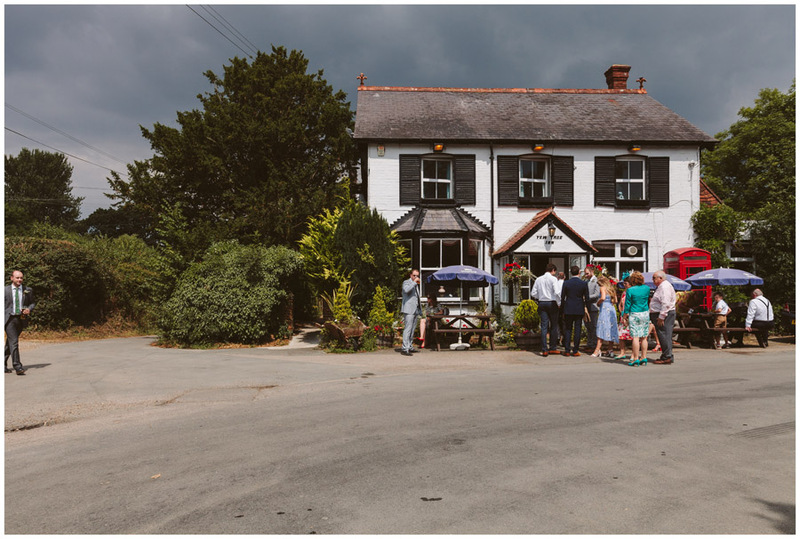 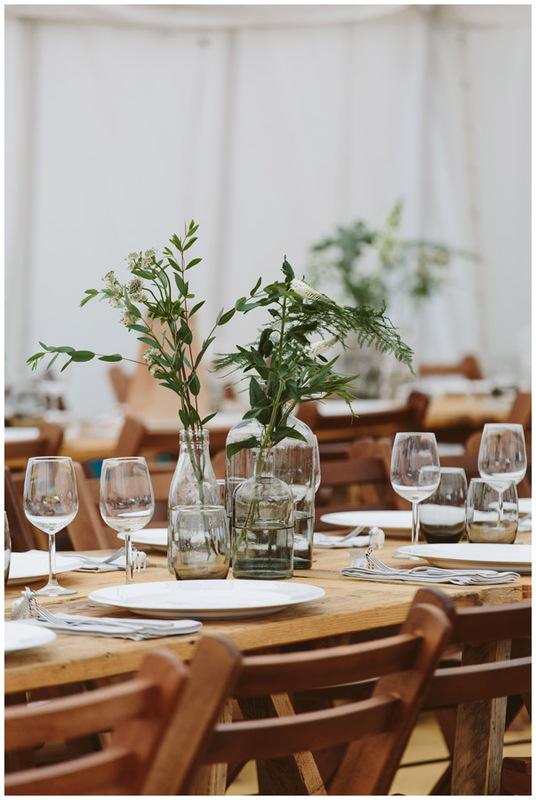 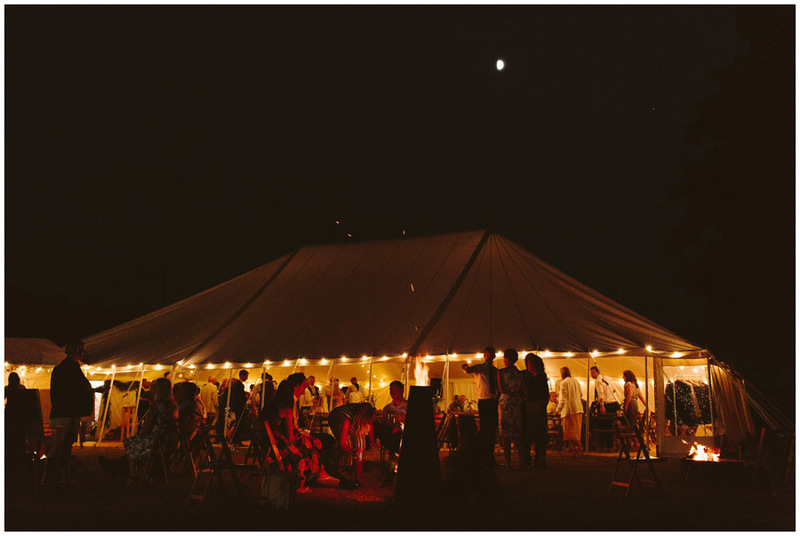 Having a wedding at such blank canvas venue means you can play with time a little more and aren’t restricted to time lines that some venues have – this doesn’t mean you don’t have to plan though! 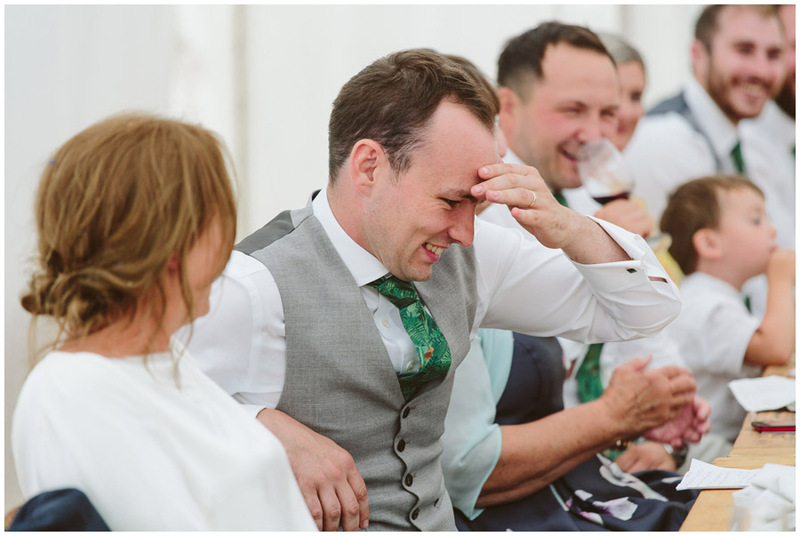 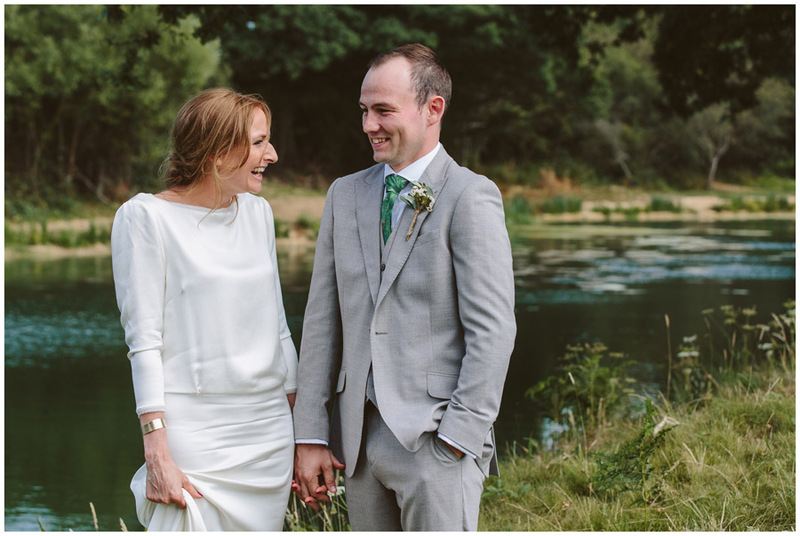 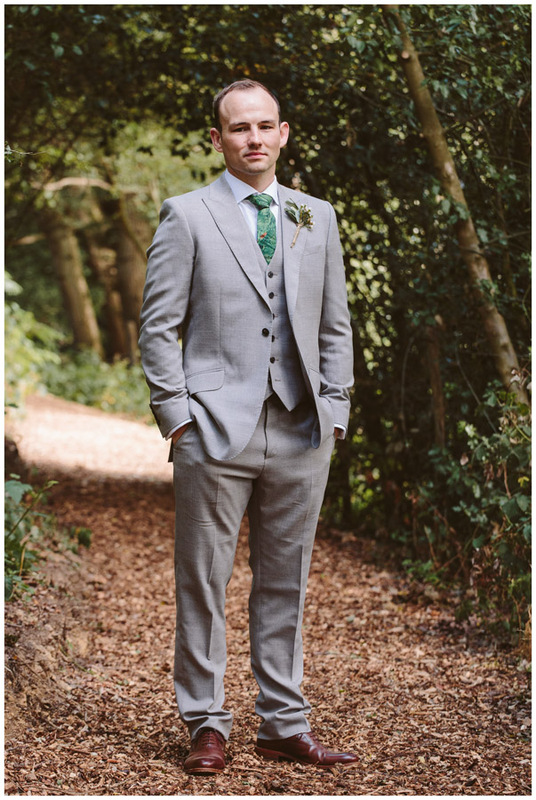 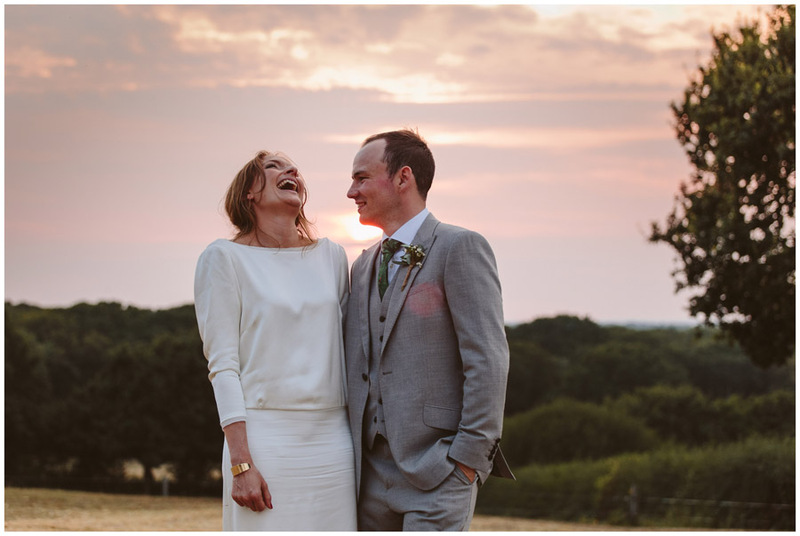 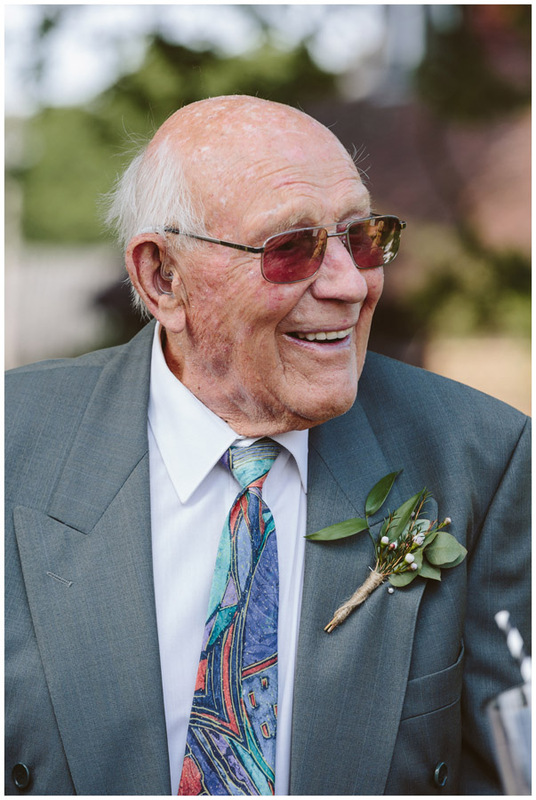 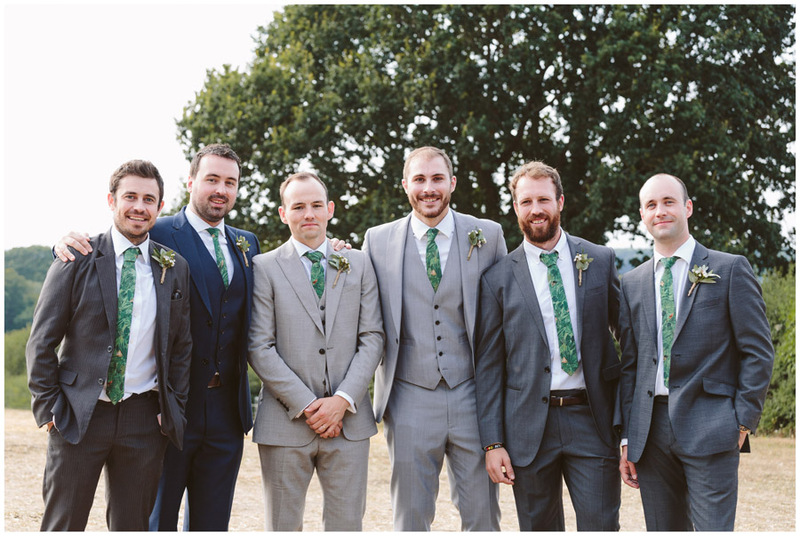 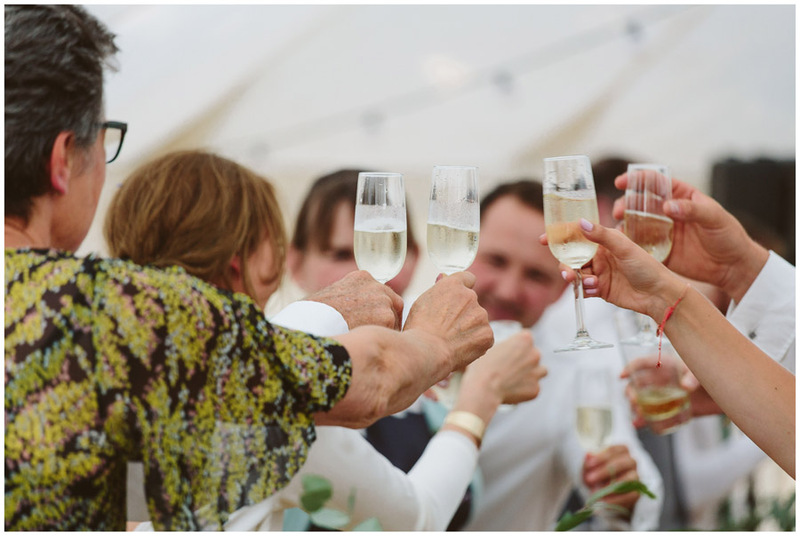 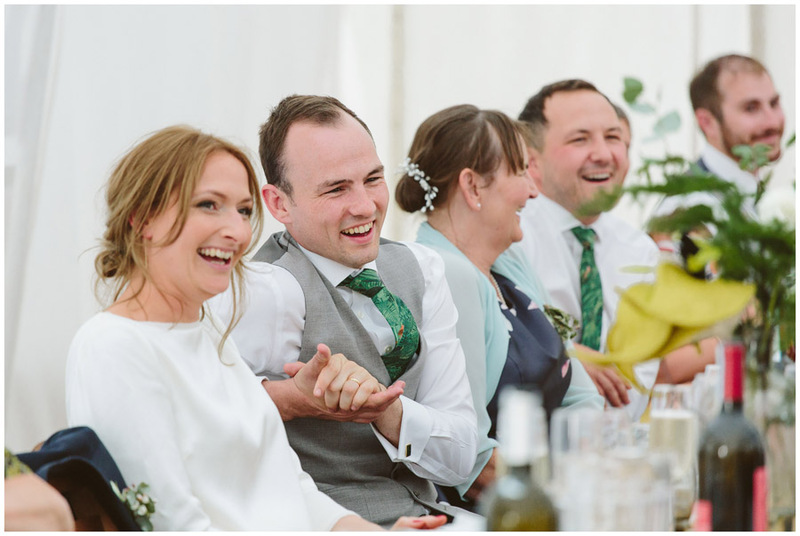 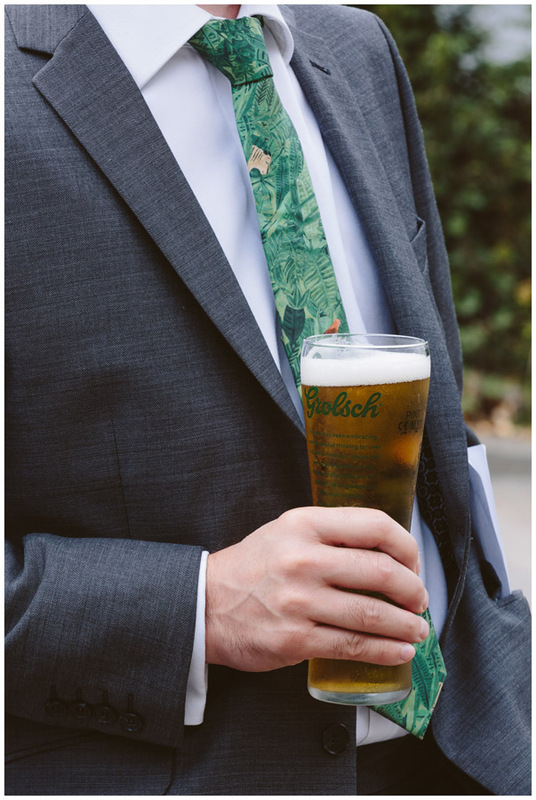 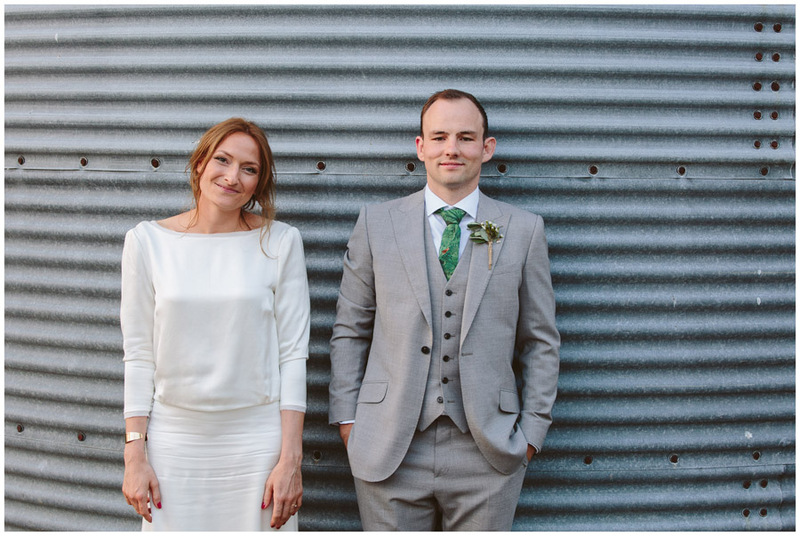 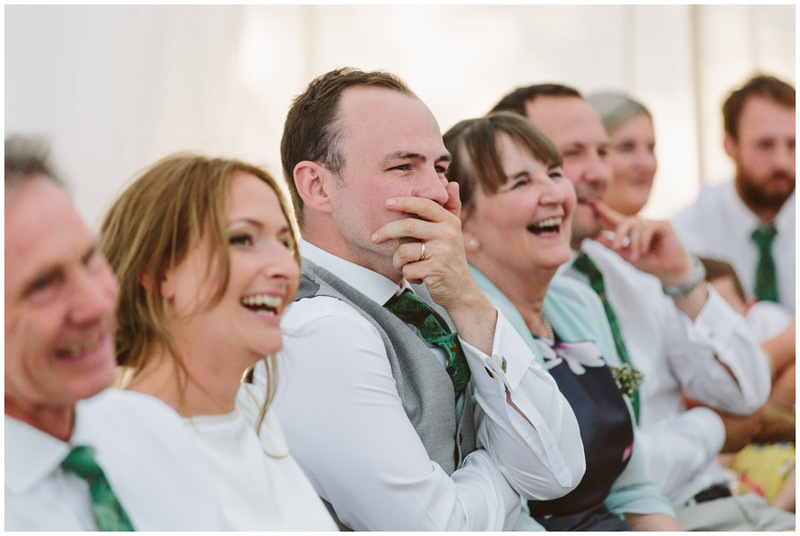 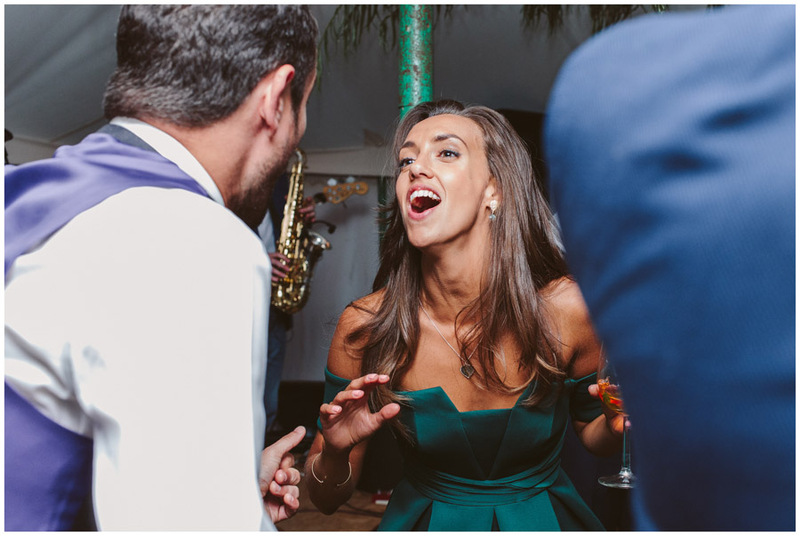 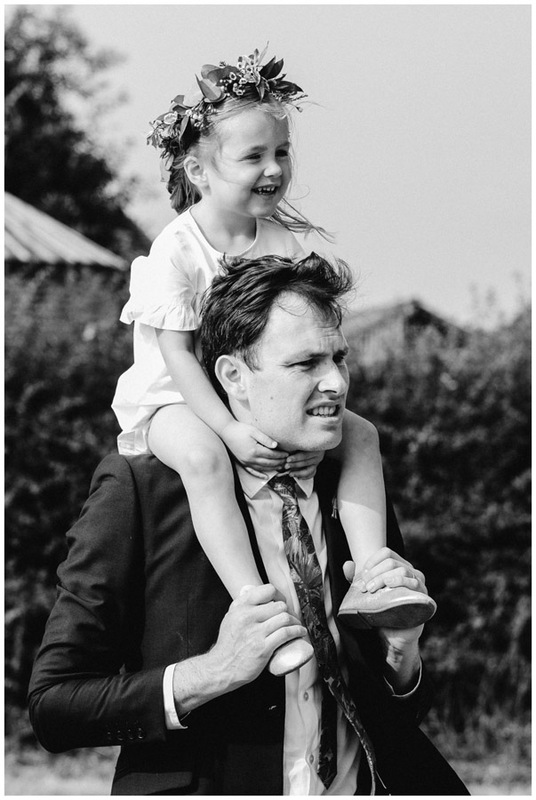 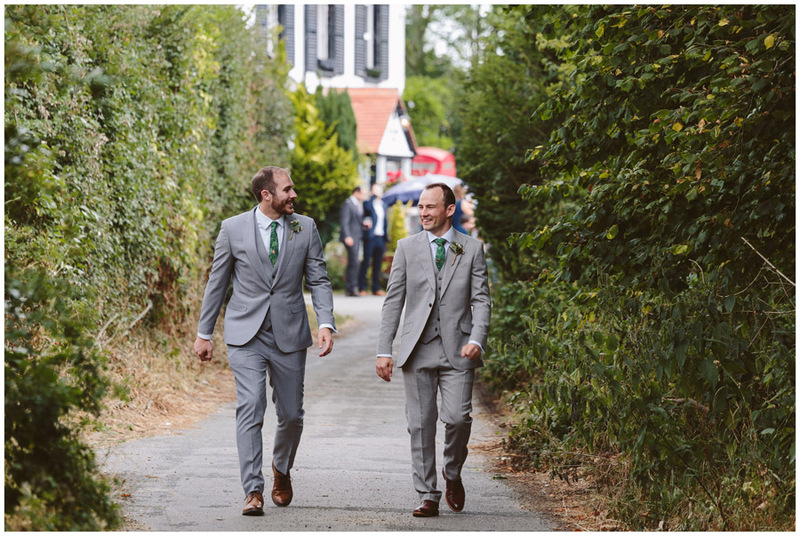 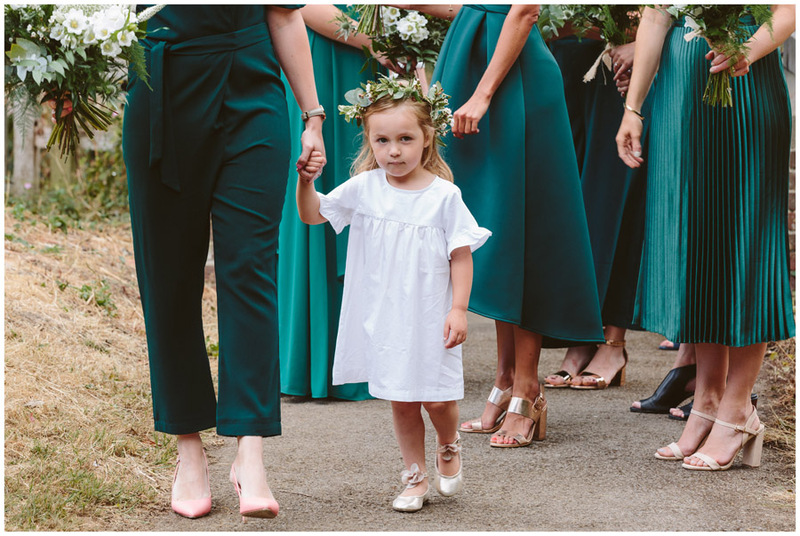 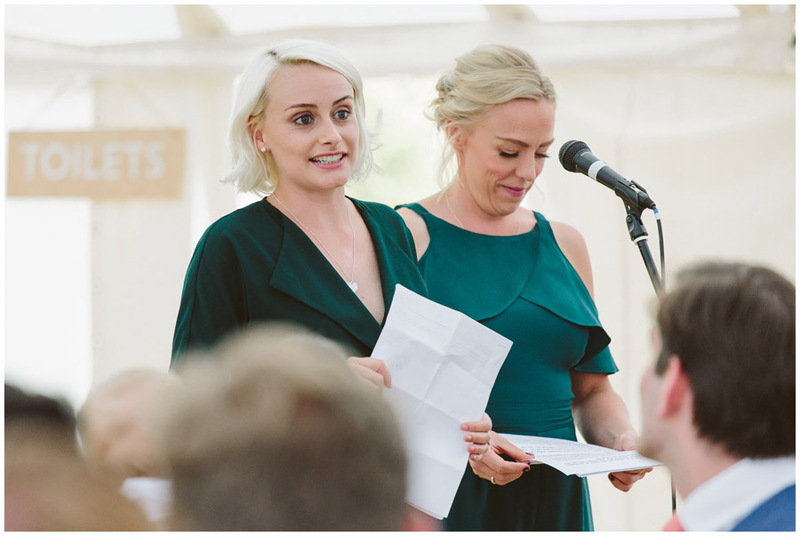 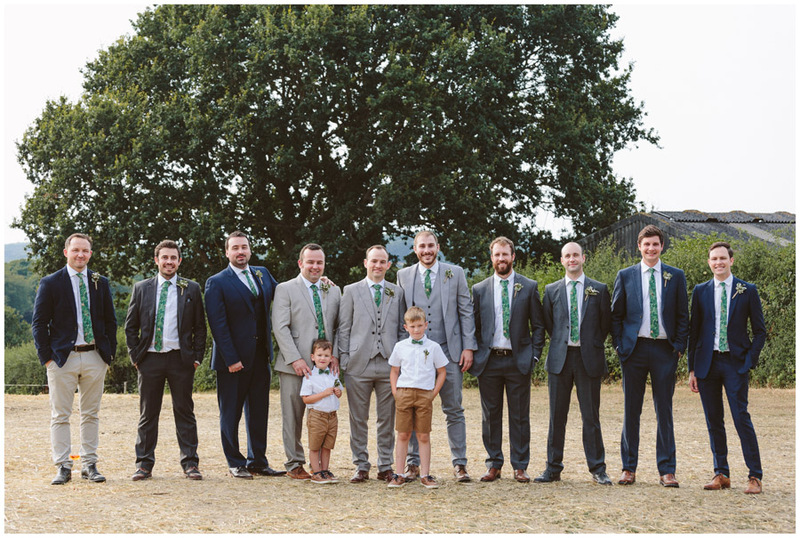 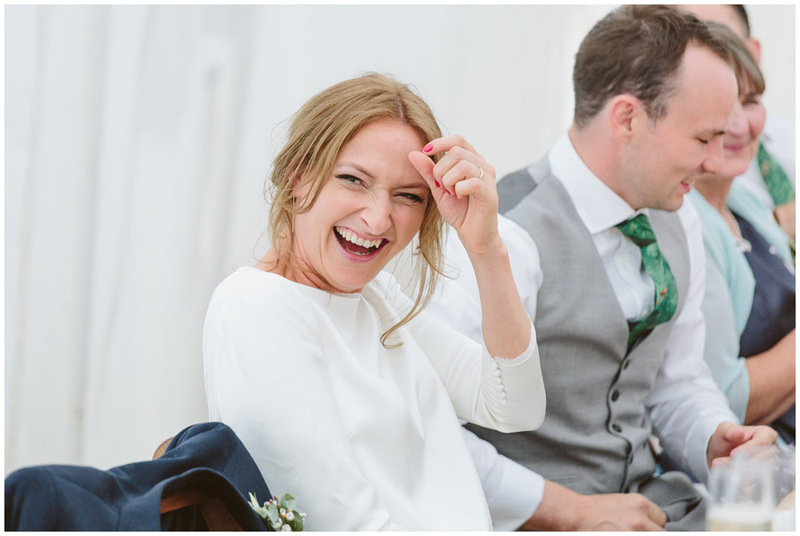 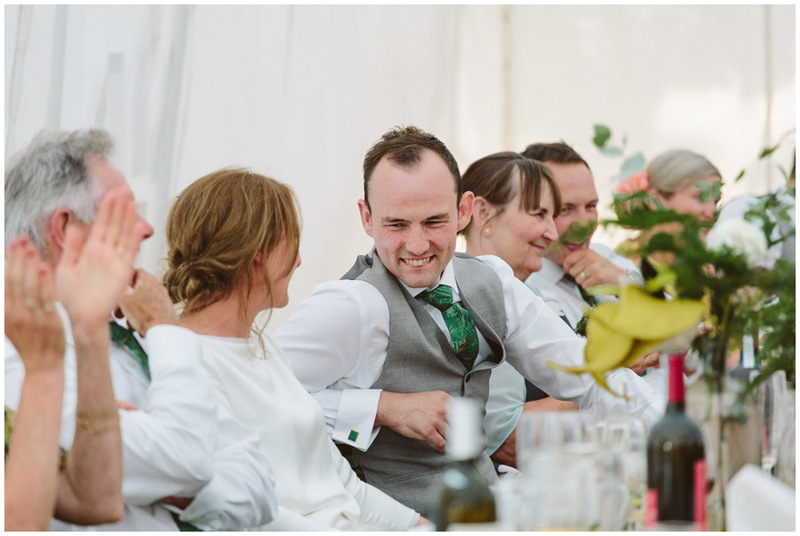 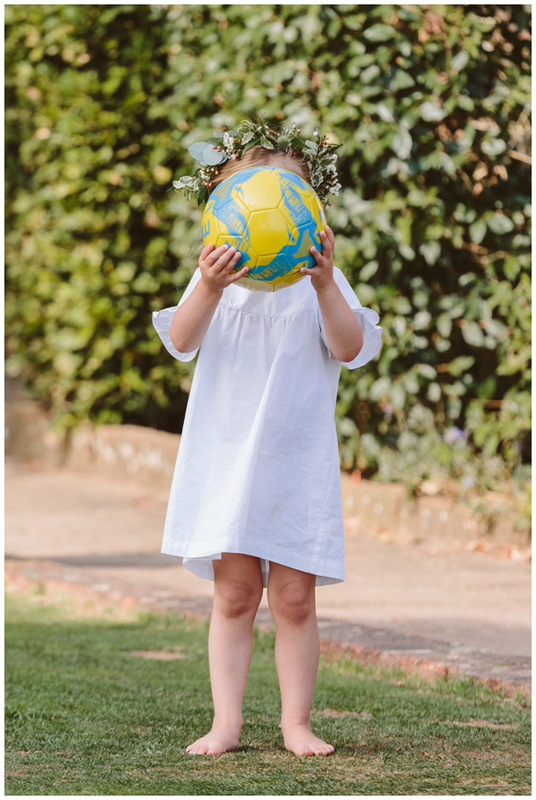 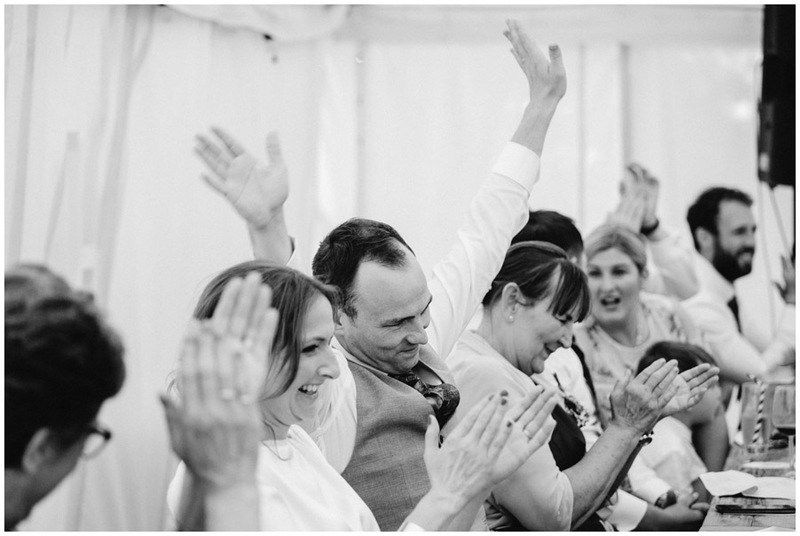 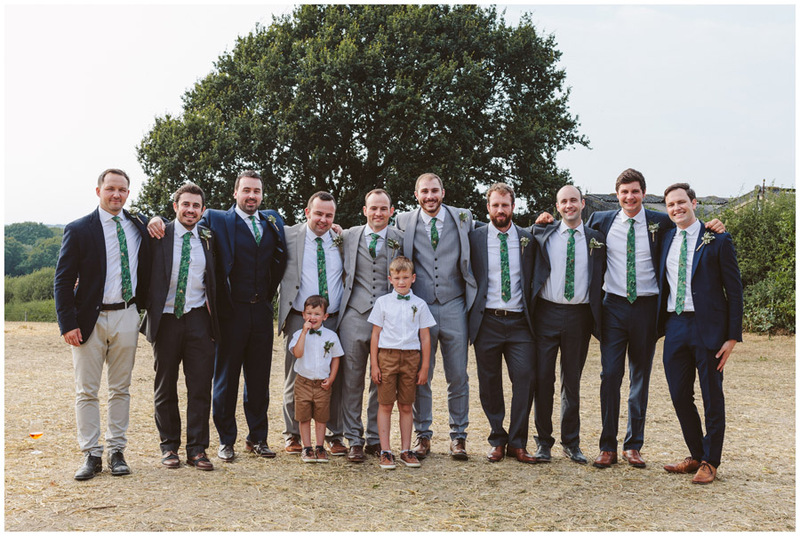 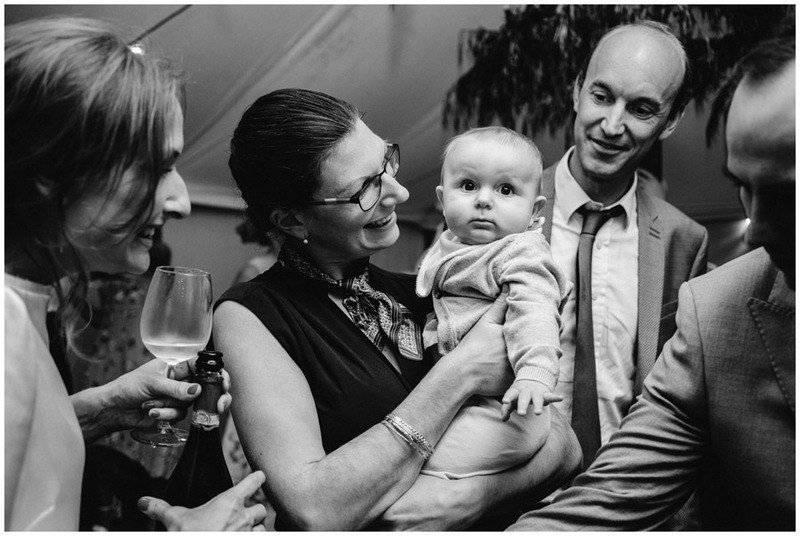 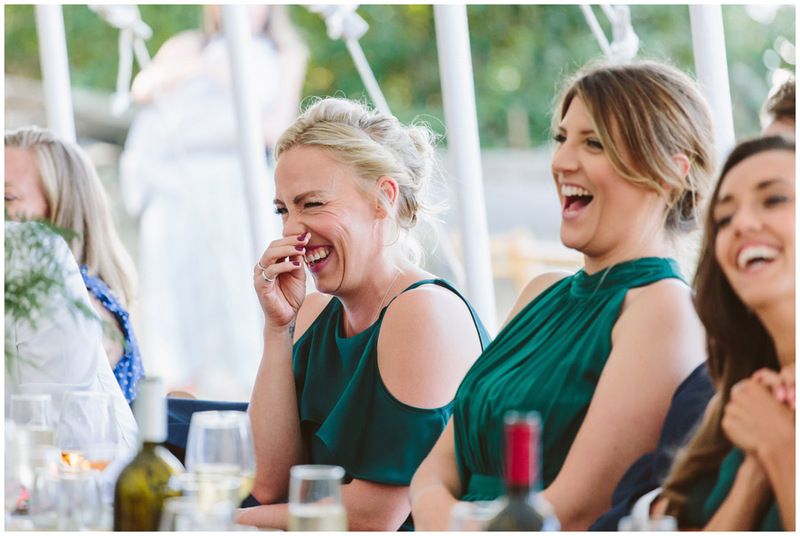 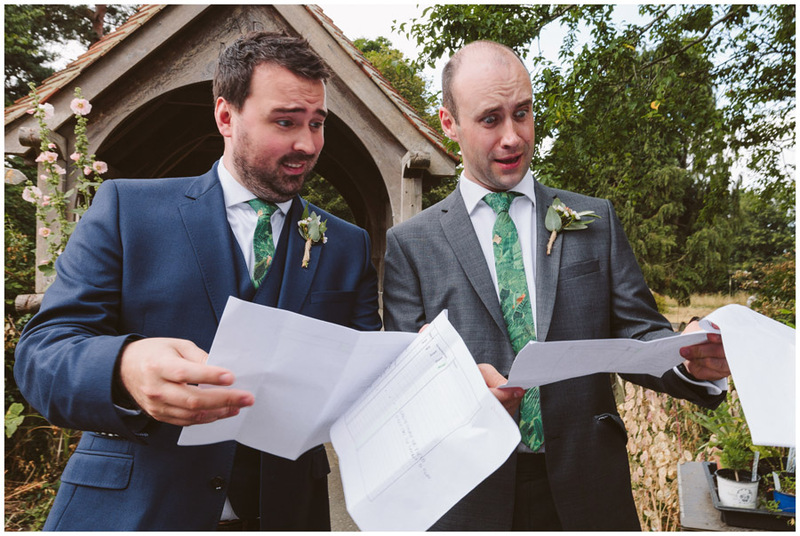 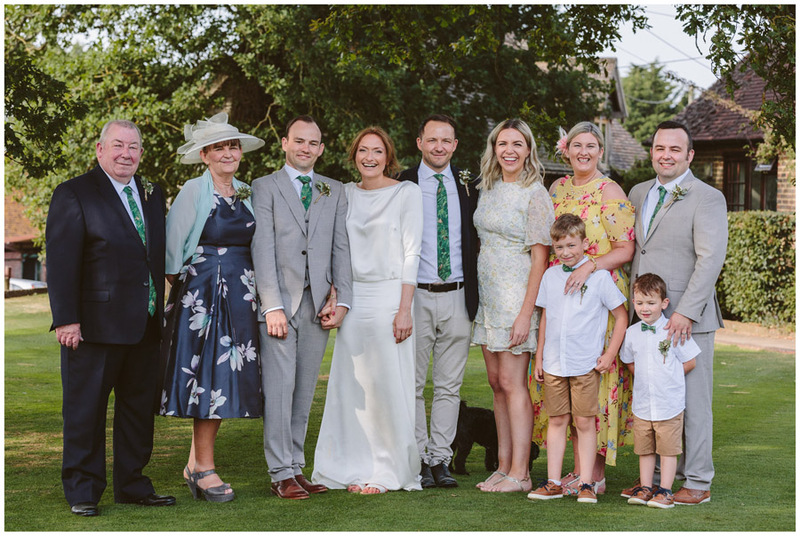 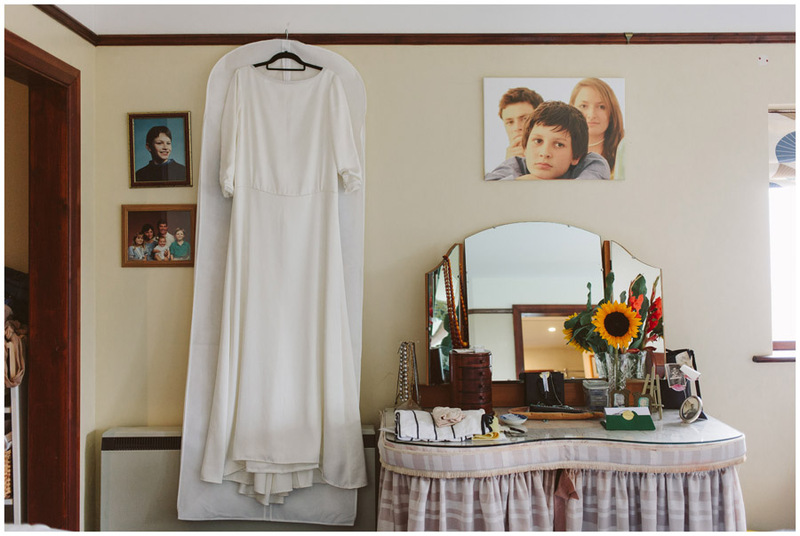 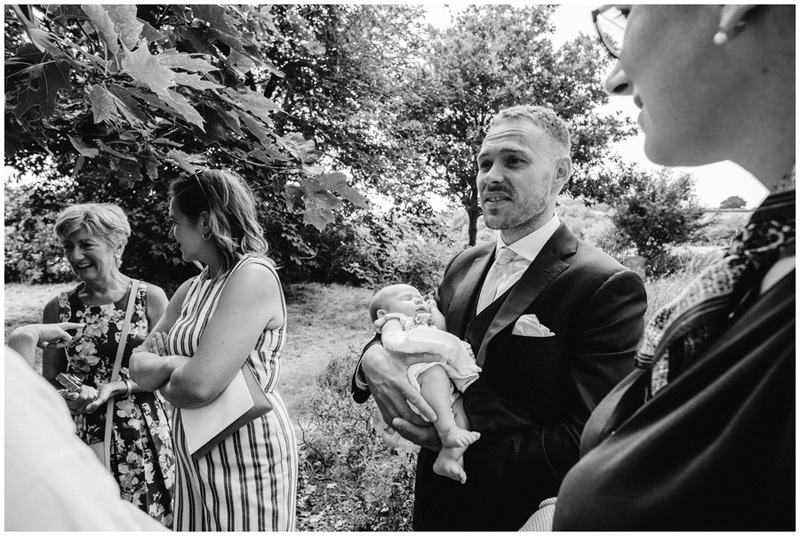 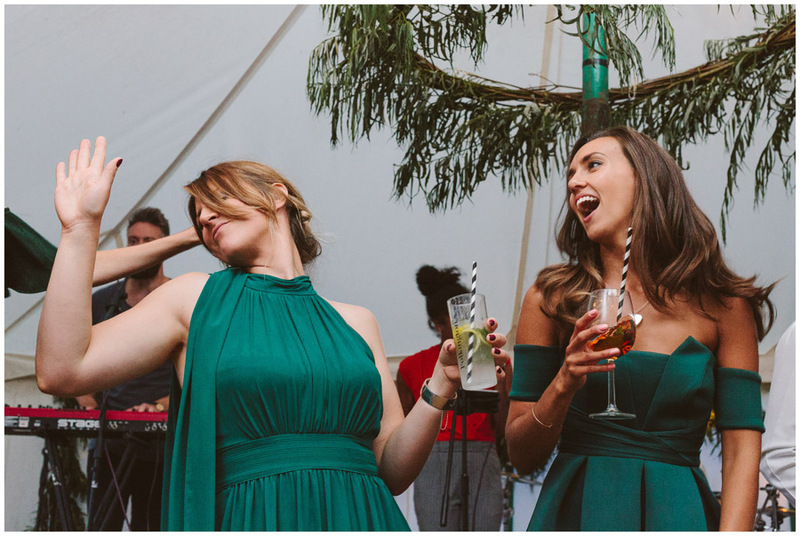 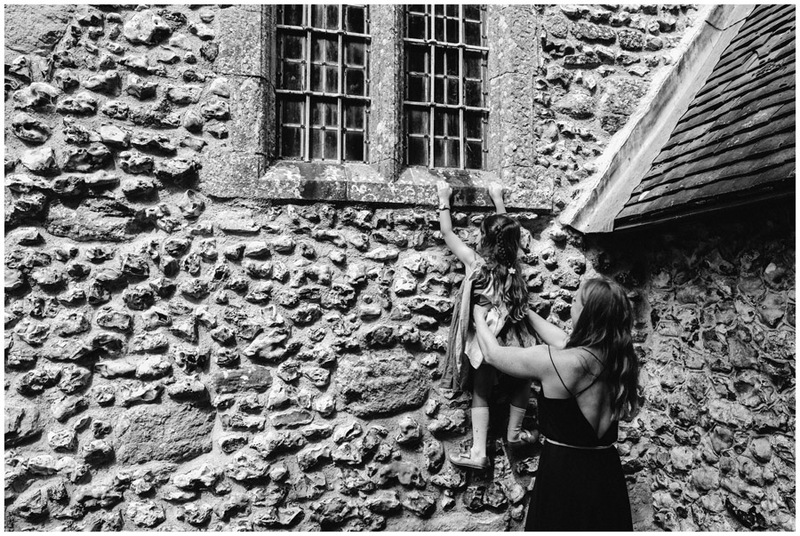 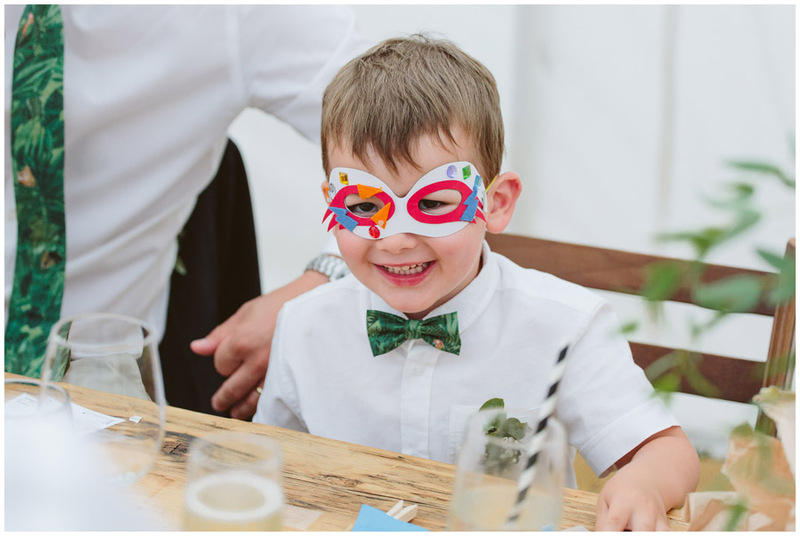 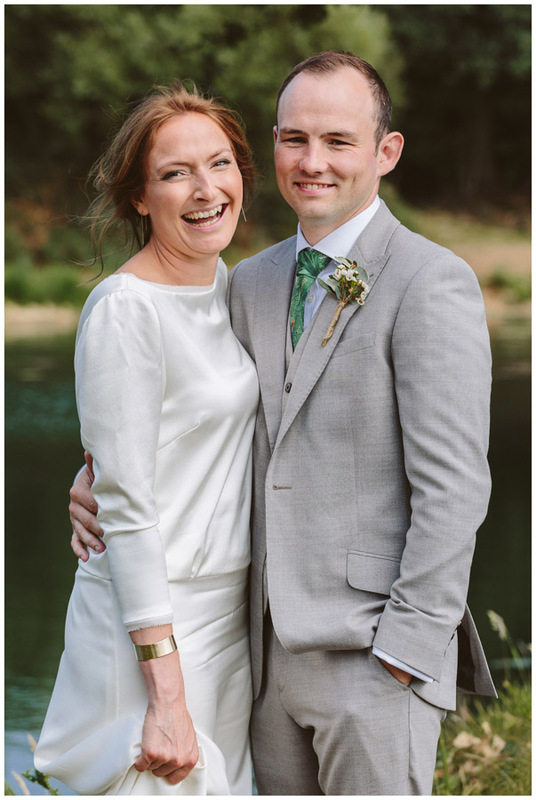 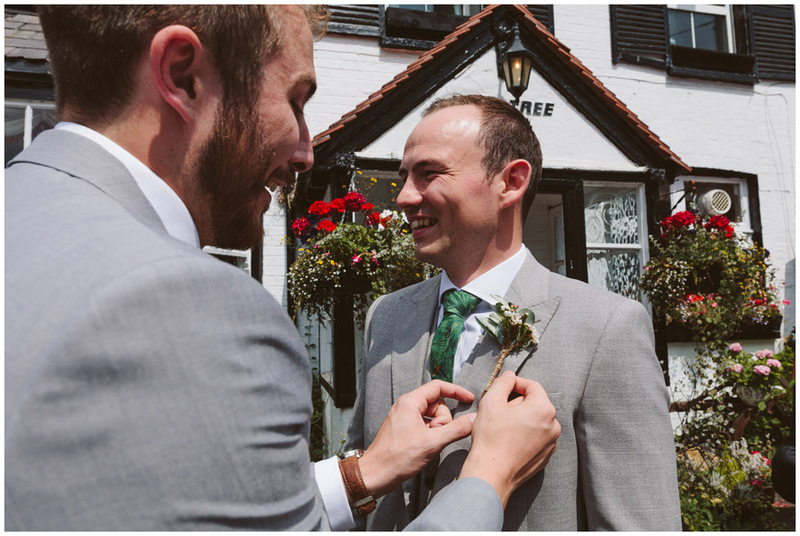 I went through their time line with them at the E-Shoot as I obviously have lots of experience with weddings and how they run and the kinds of times you’ll need for things – but actually J’s mum had got all the timings spot on! 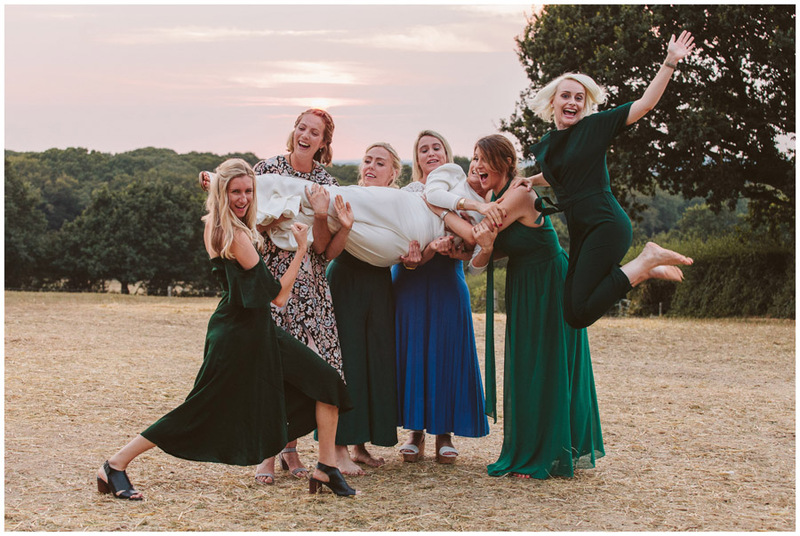 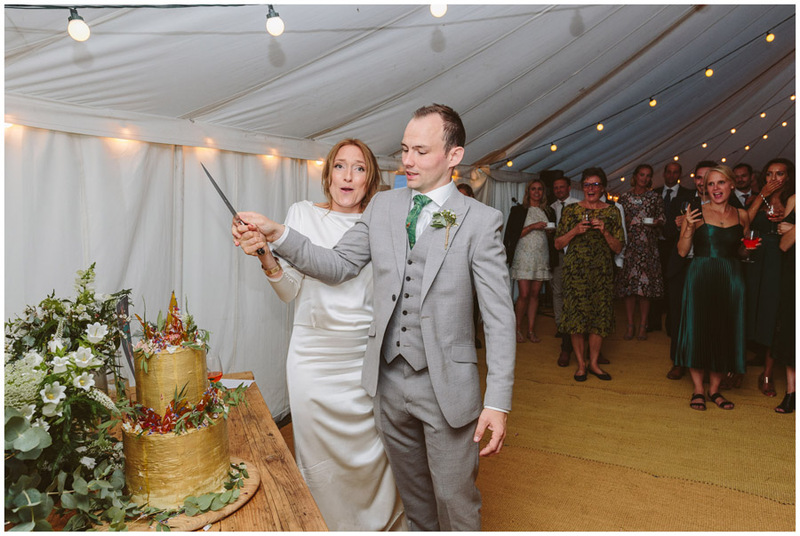 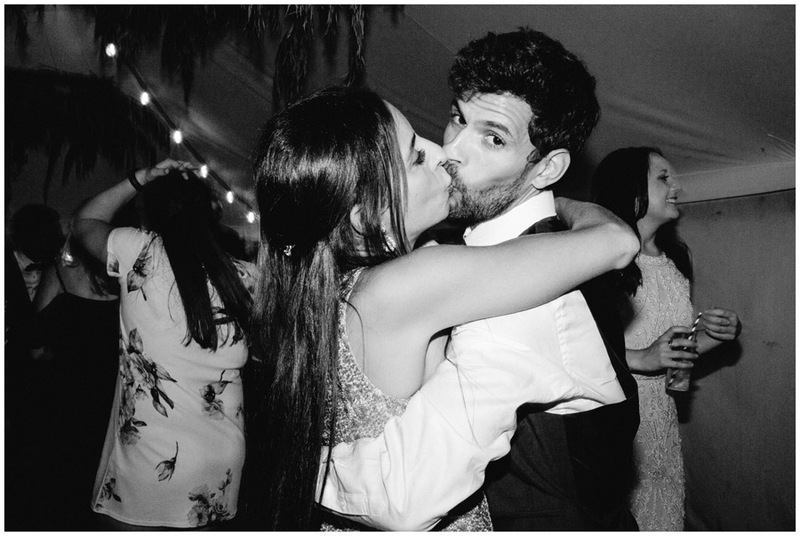 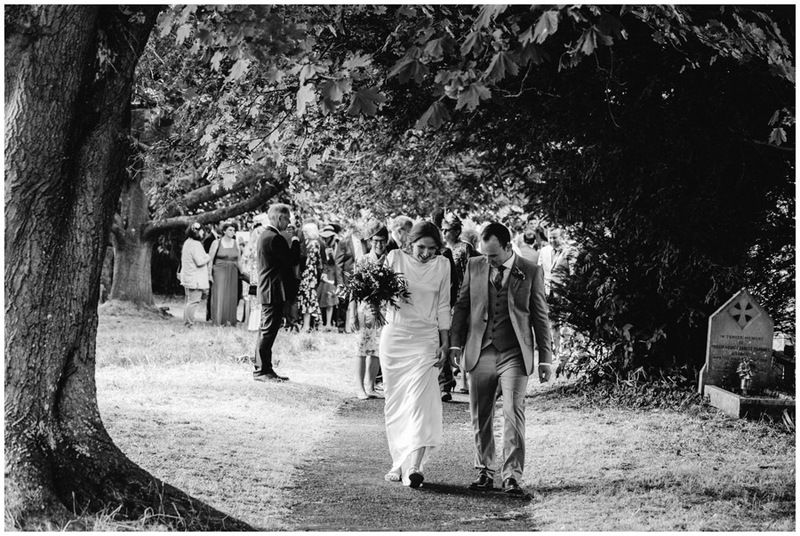 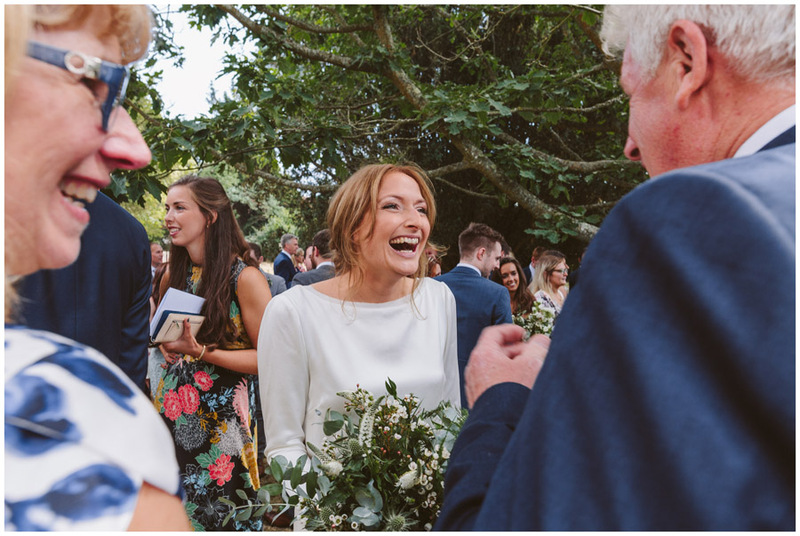 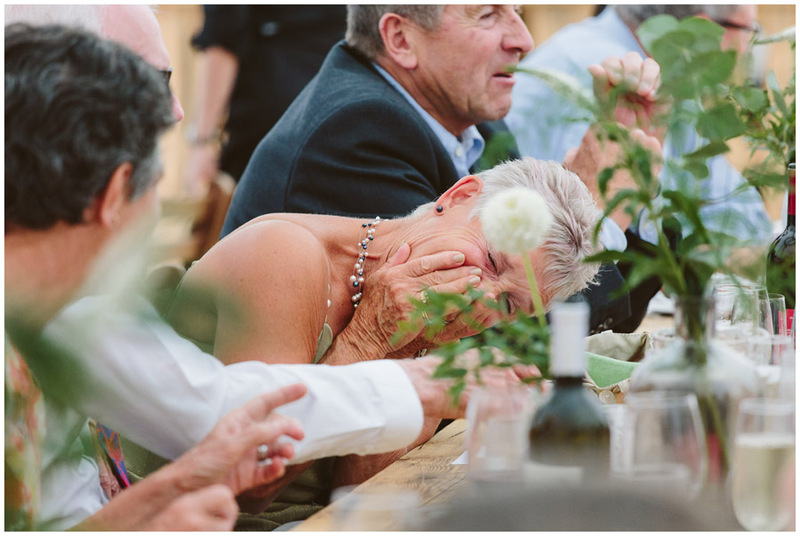 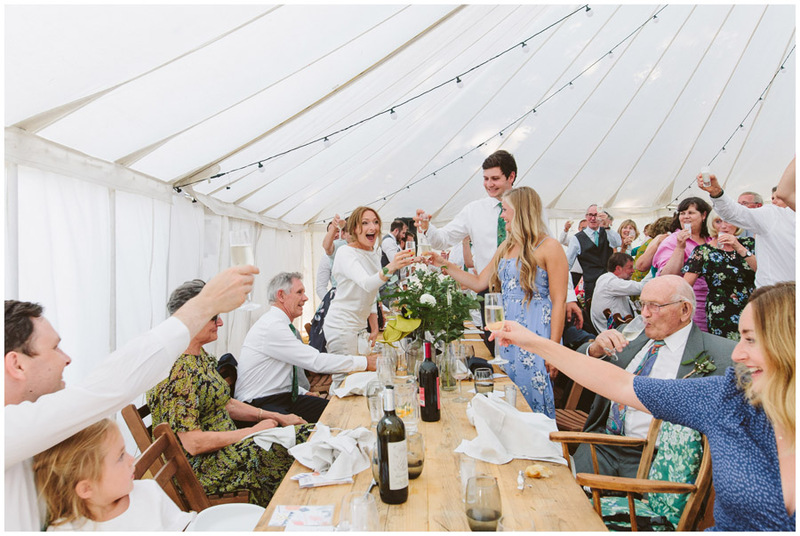 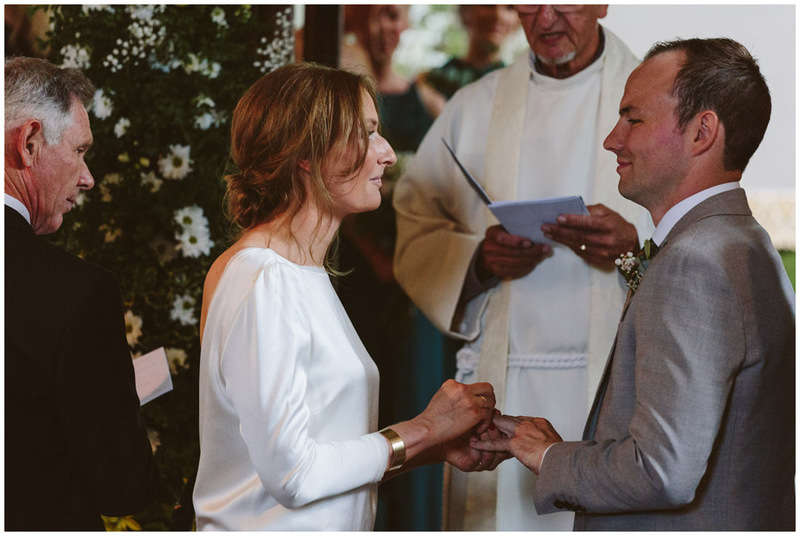 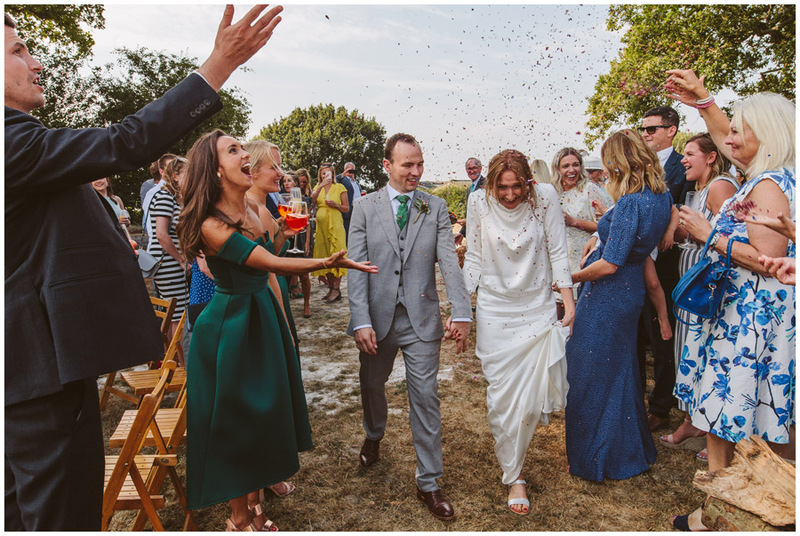 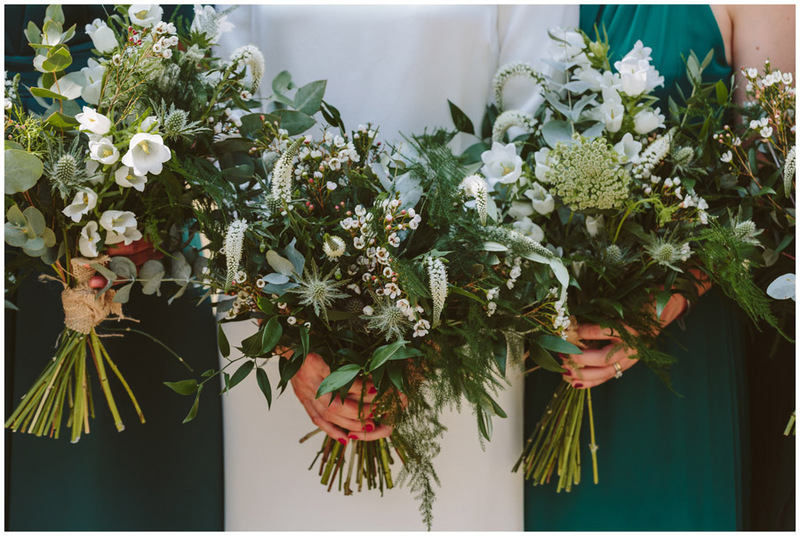 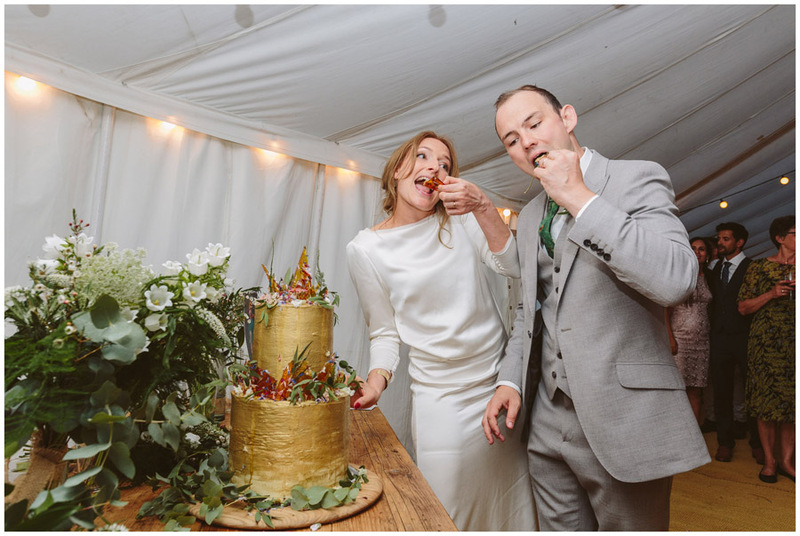 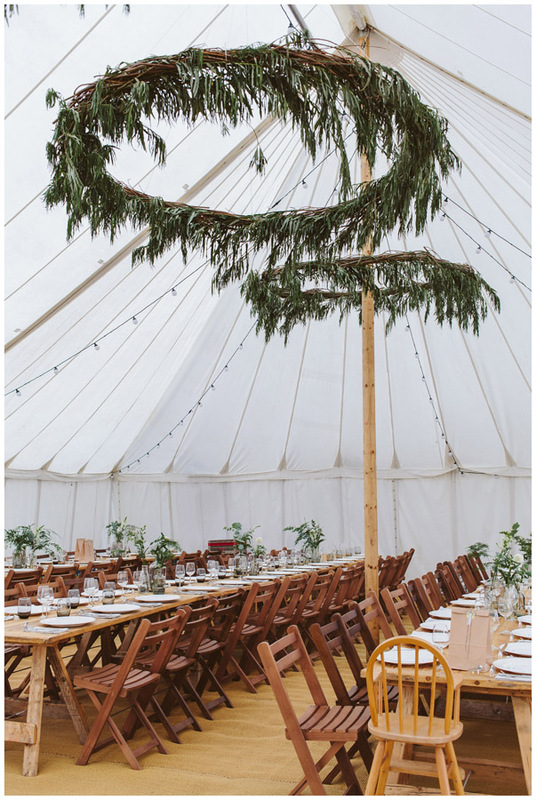 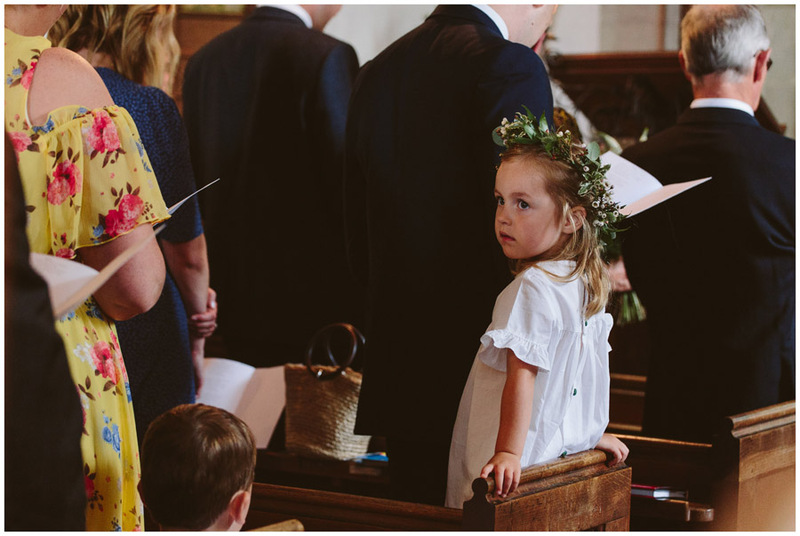 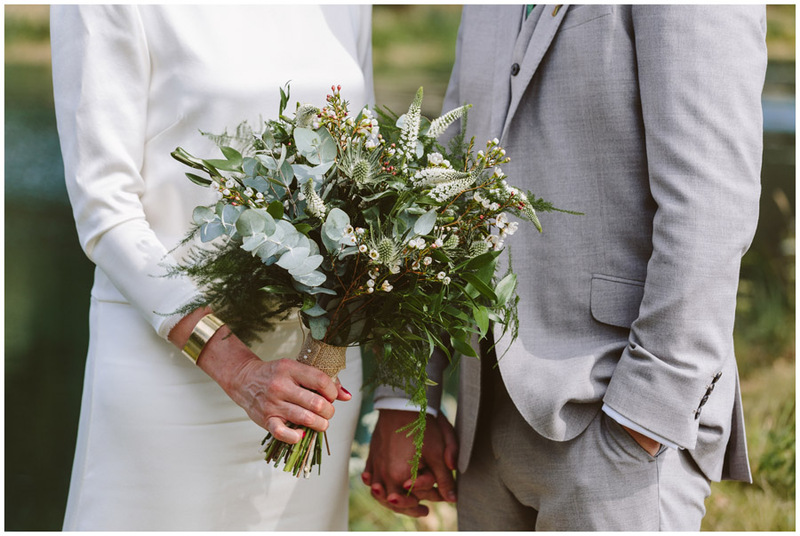 It might have seemed a little over the top to everyone else but she was dead right to be as meticulous as she was and giving extra time to things, especially with quite a few logistical elements to their day – the day ran completely to time schedule and nothing felt rushed! 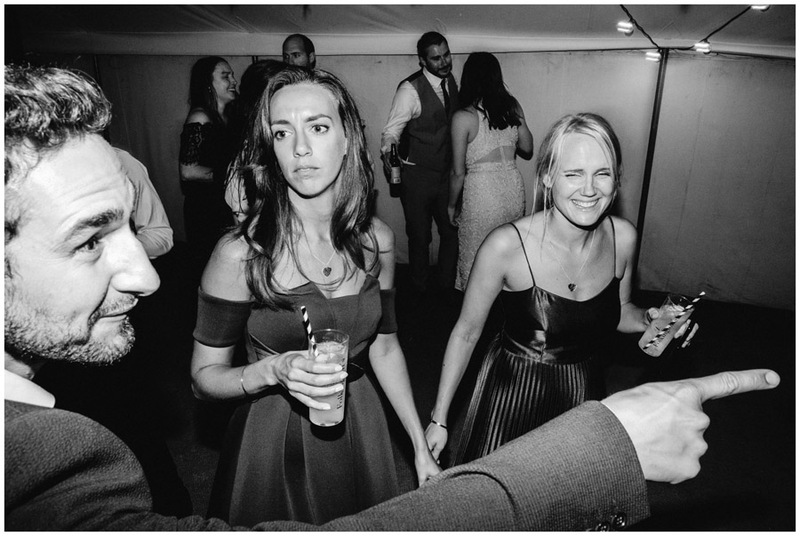 – which is unusual. 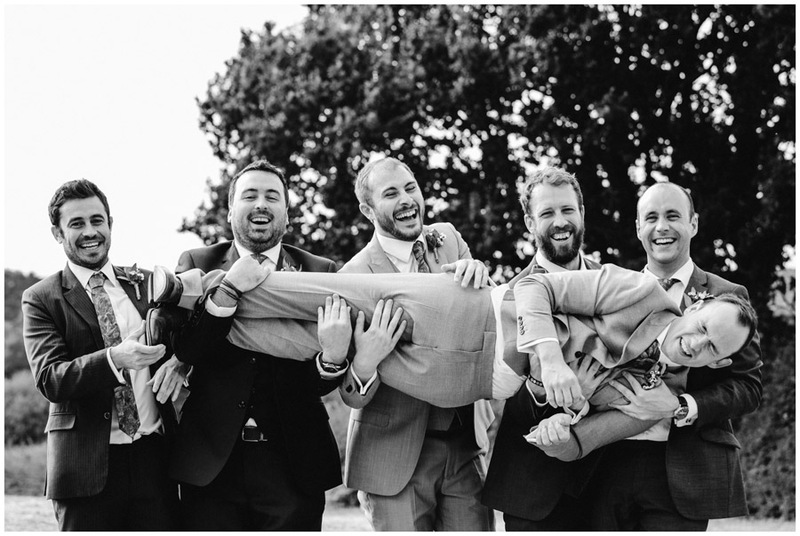 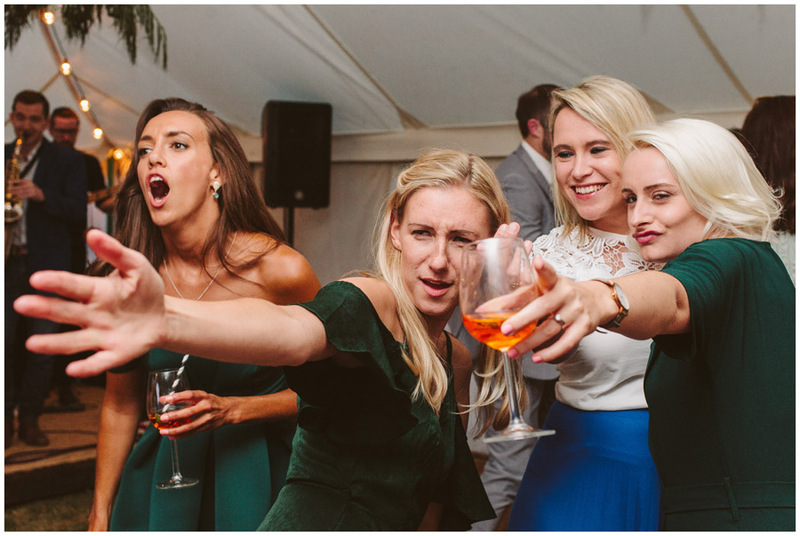 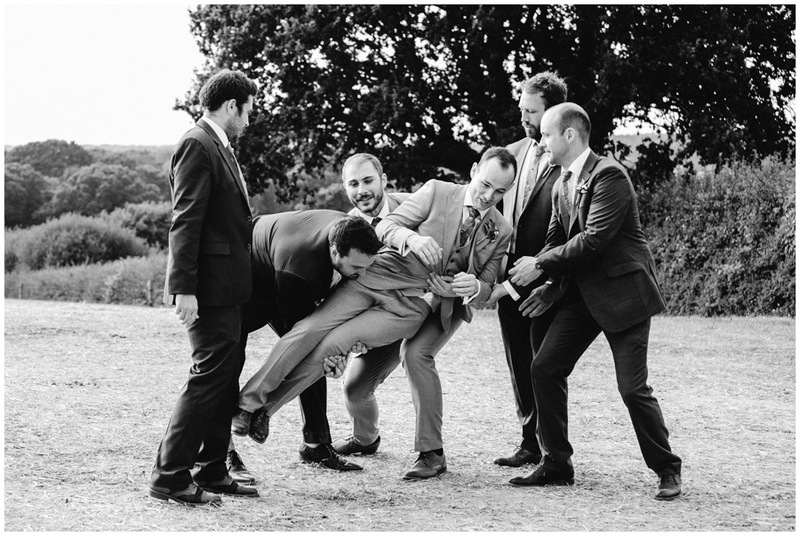 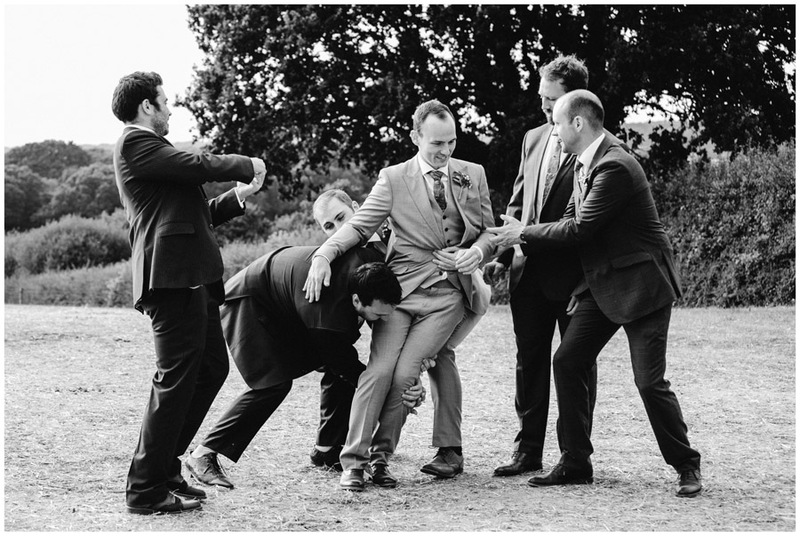 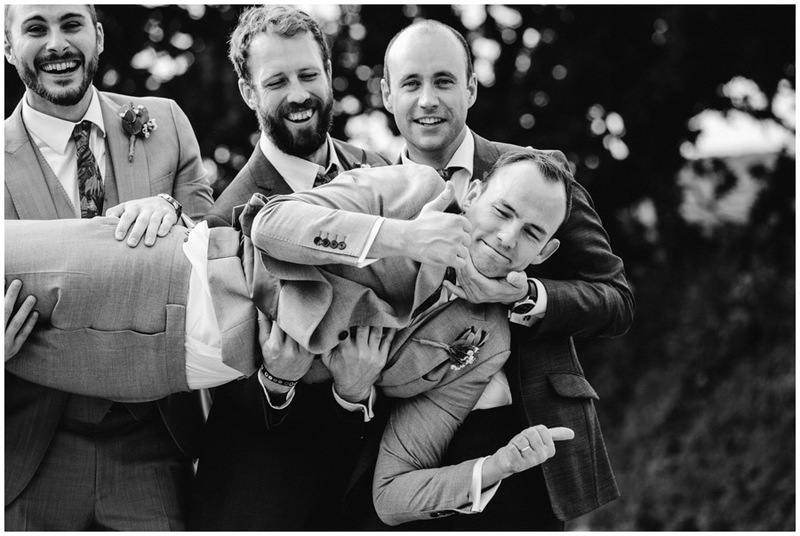 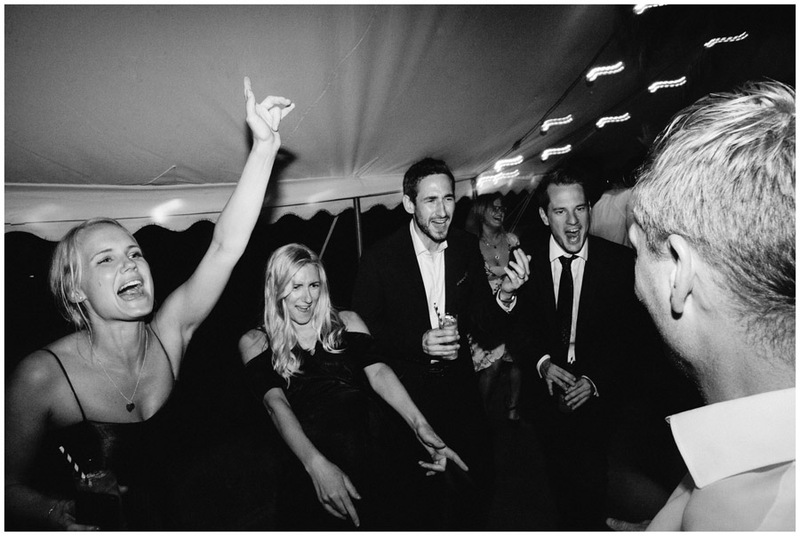 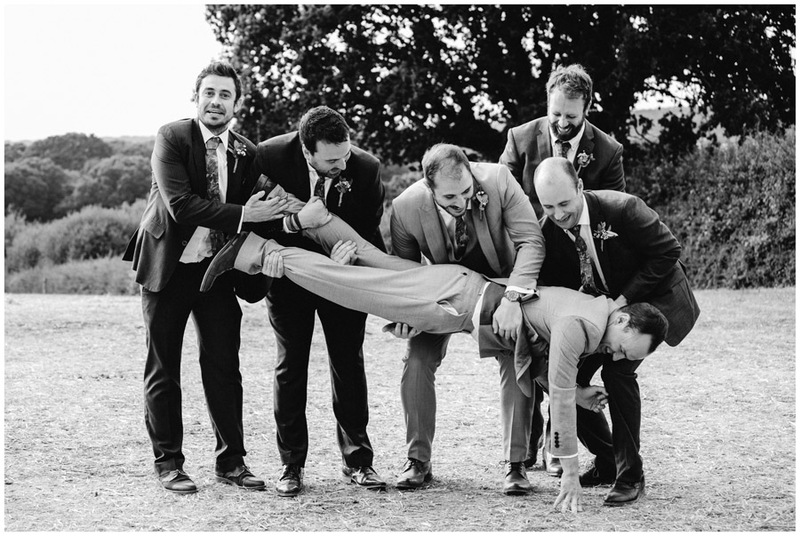 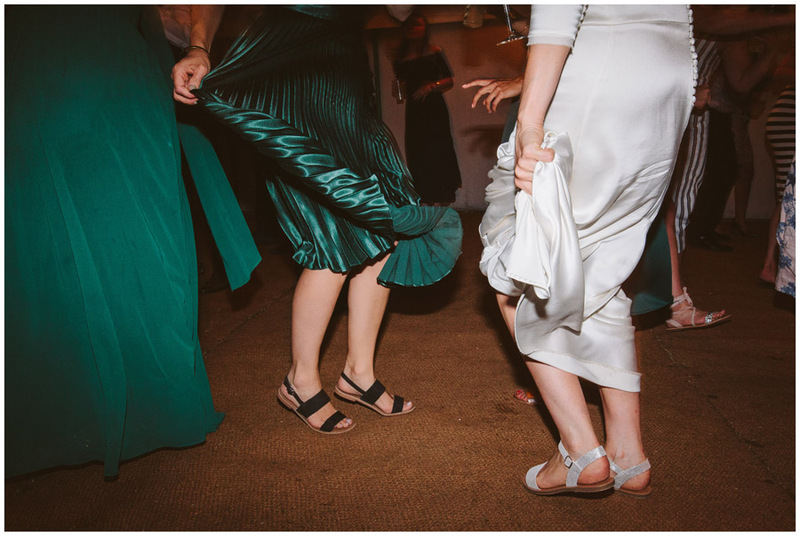 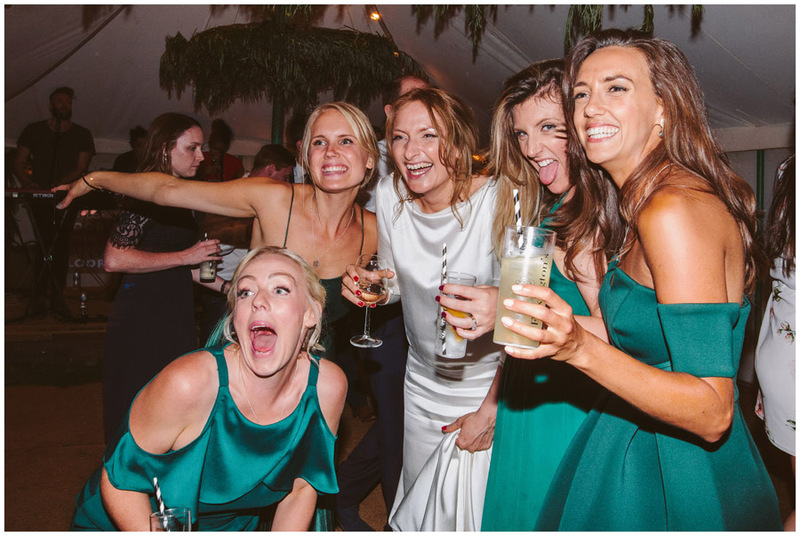 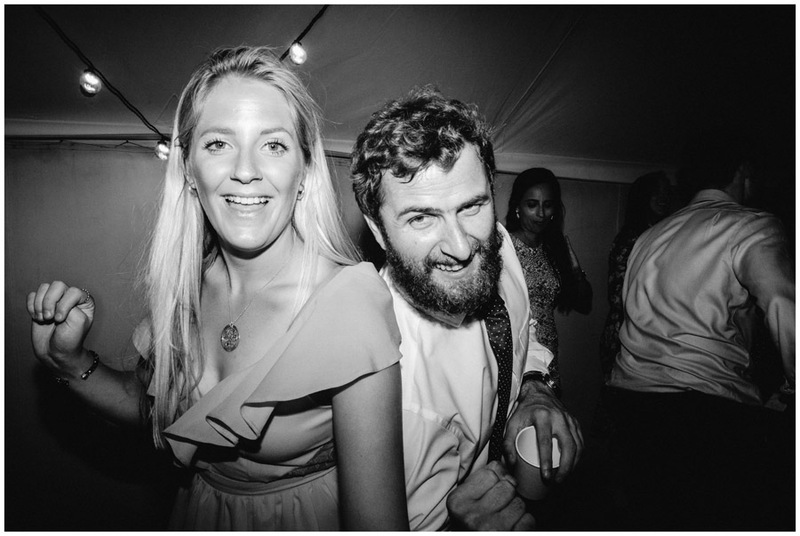 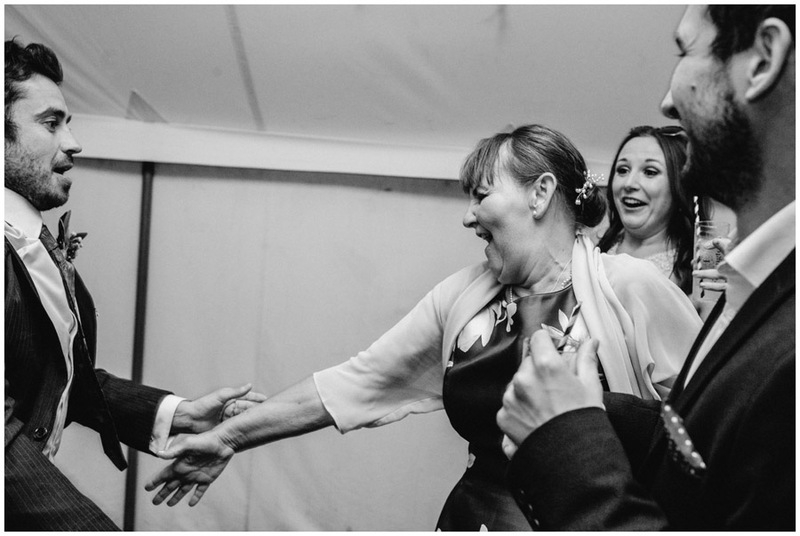 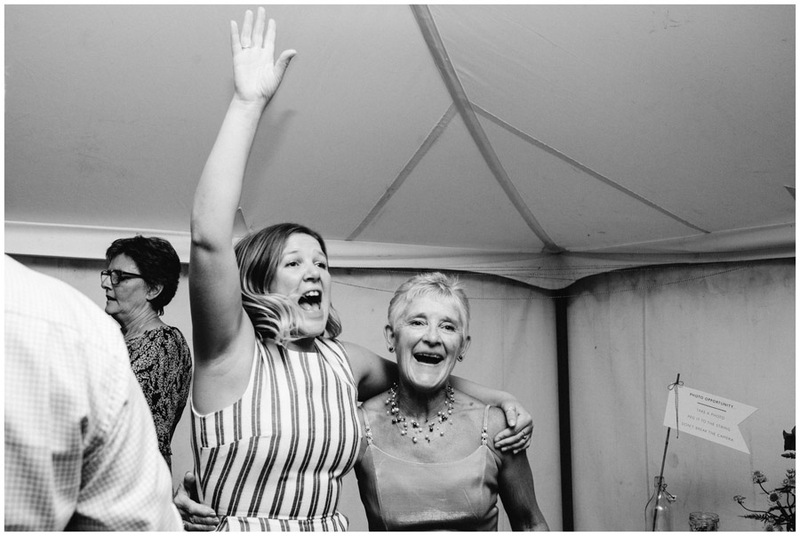 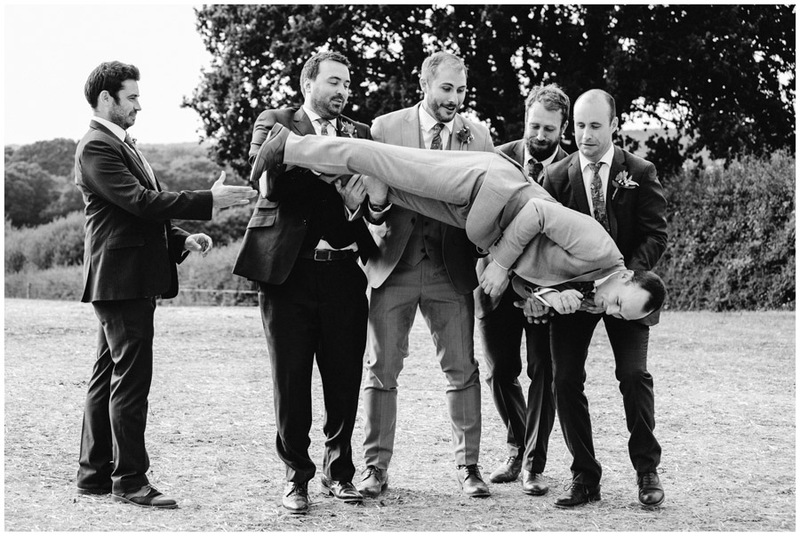 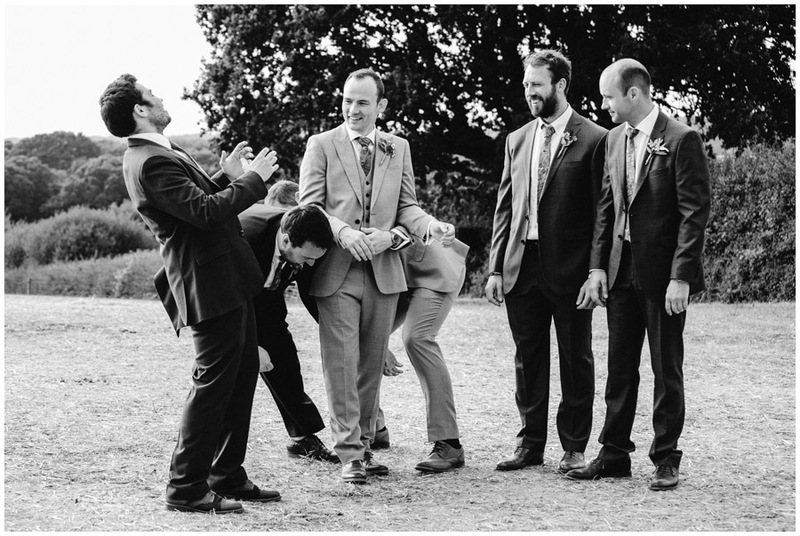 I am so bloody lucky – I absolutely LOVE photographing the weddings of groups of friends and this was one of those! 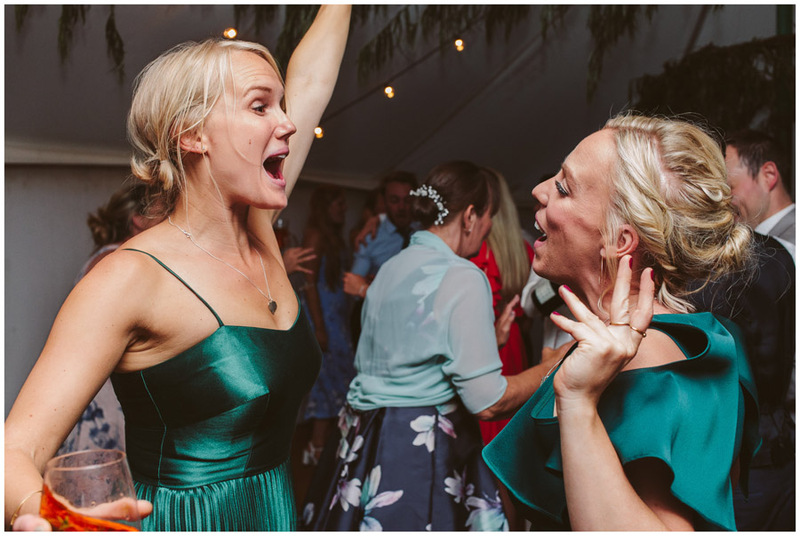 J&M found me via one of J’s best friends weddings that I had shot a few years previously so it was really lovely to see them again and other familiar faces from their day! 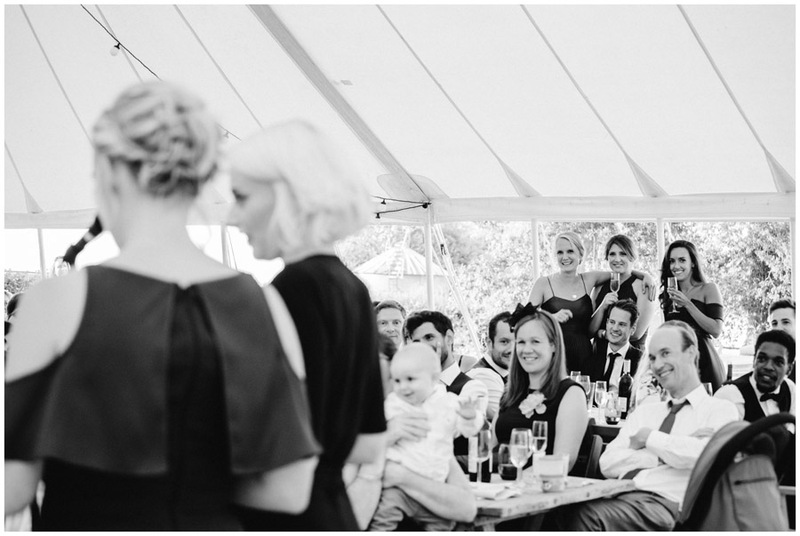 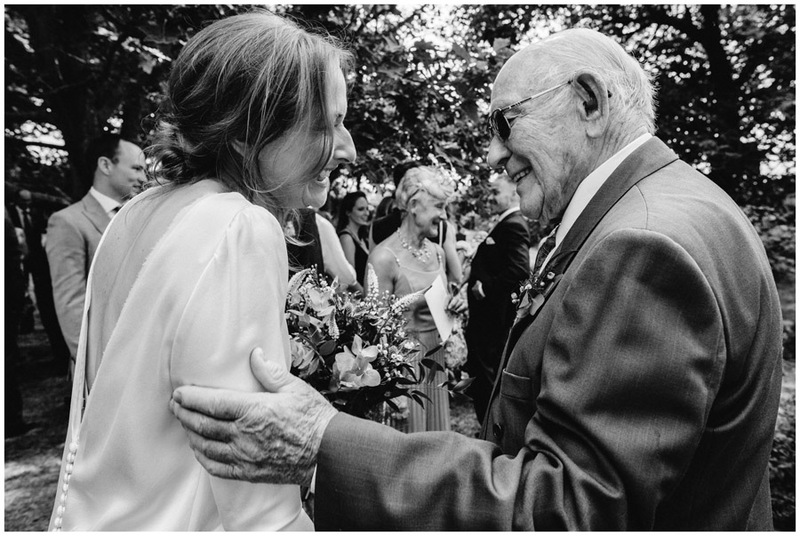 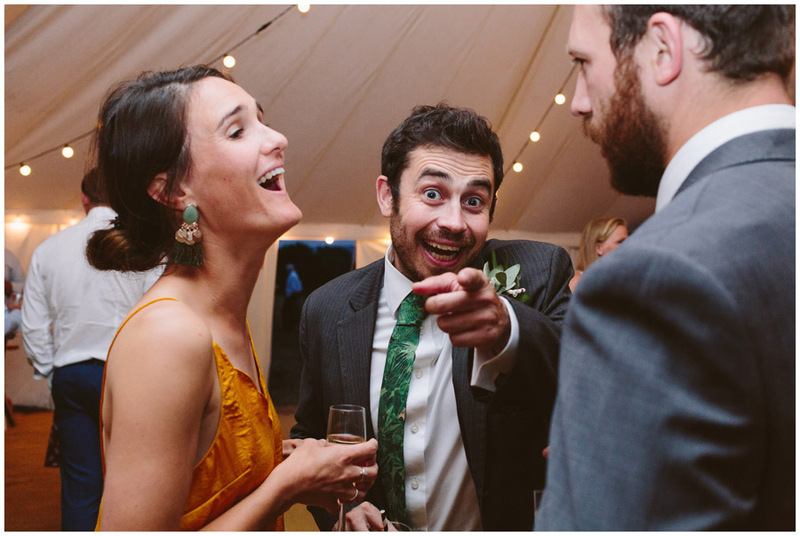 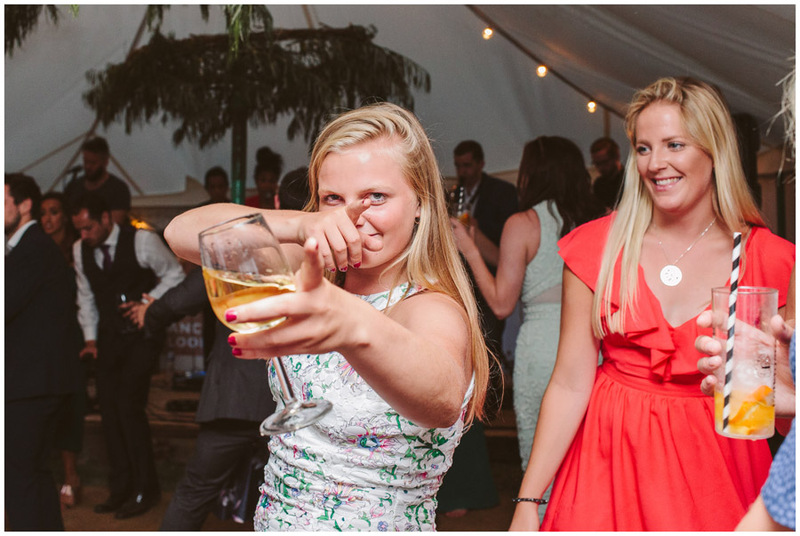 It almost feels like shooting an old friend or families wedding when you already know other guests. 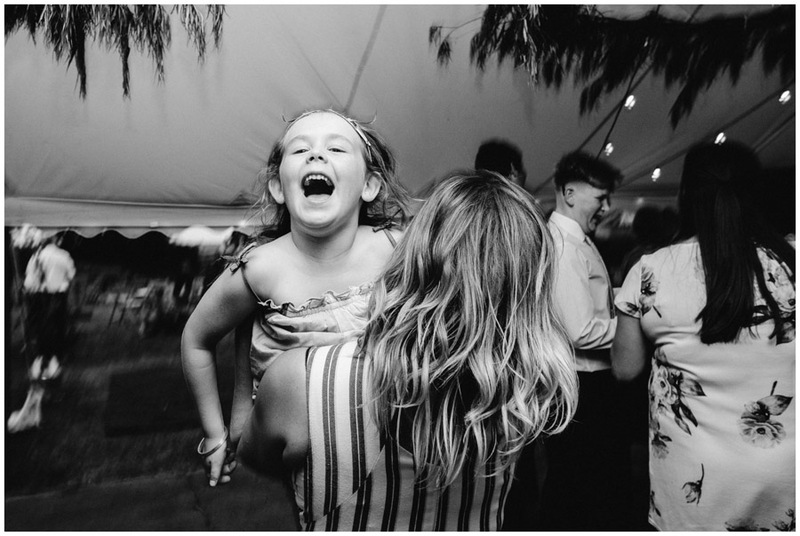 – I hope they will love looking back at them in years to come and laughing at them. 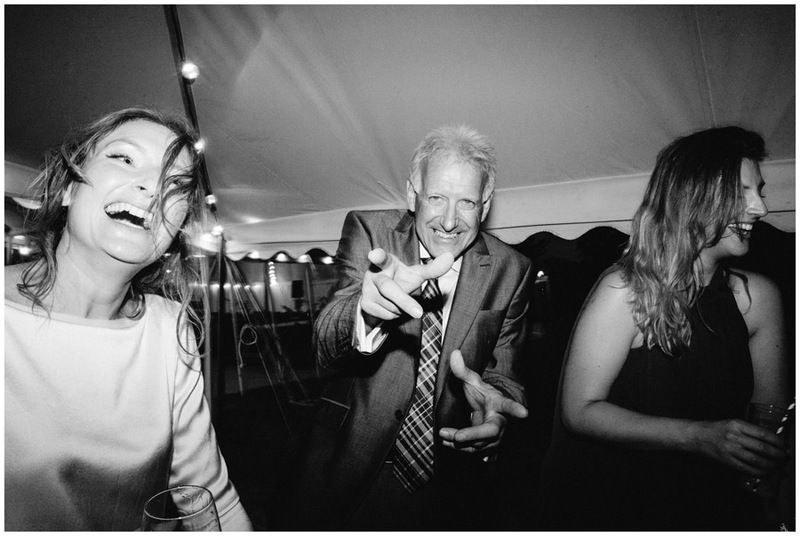 either so your photos should be unique to you and your day. 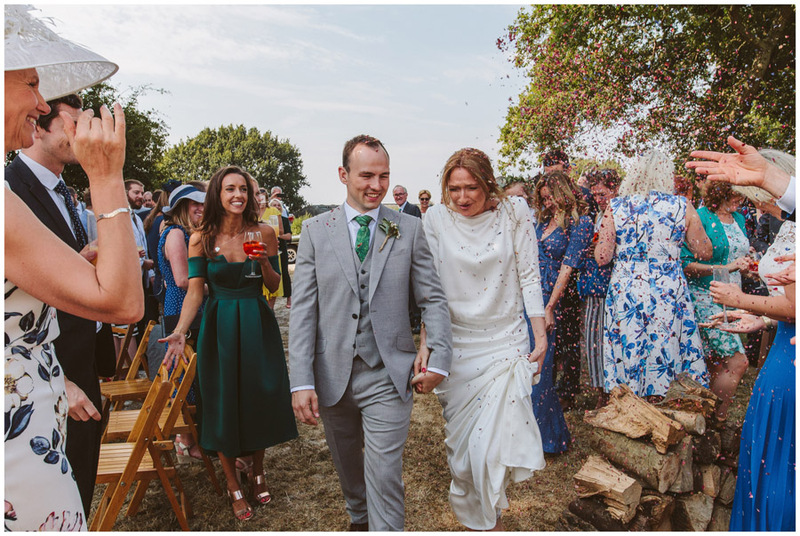 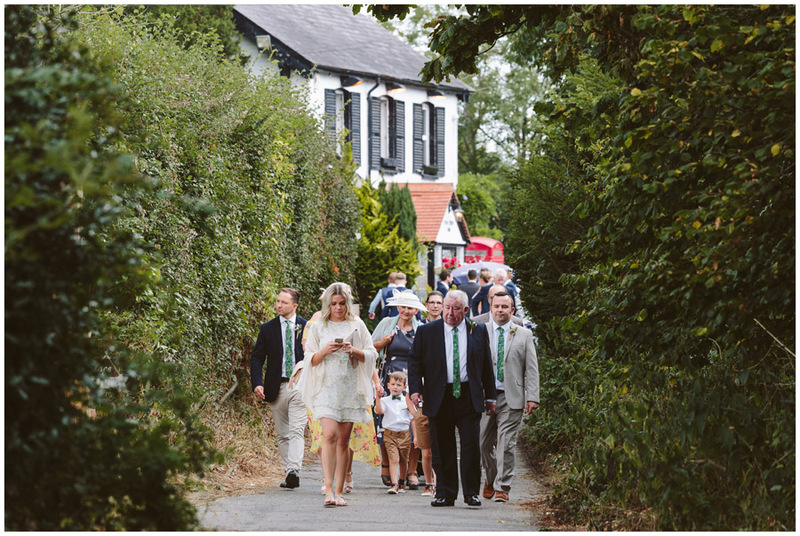 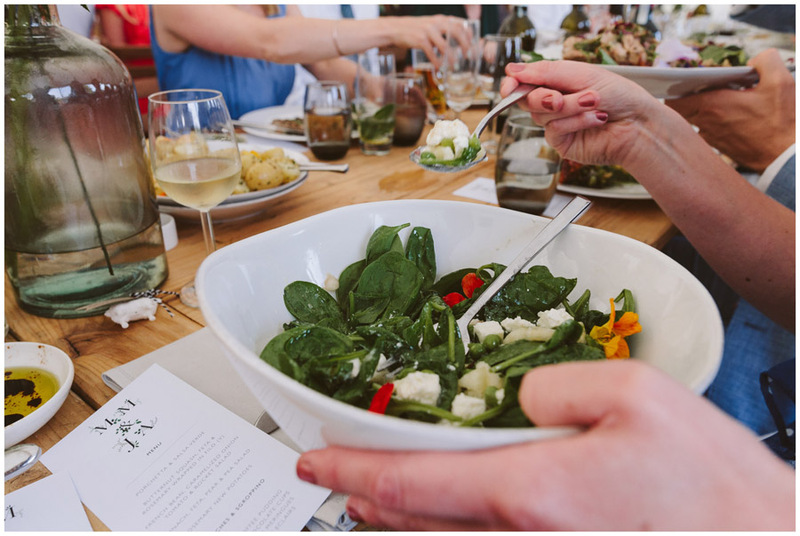 What a lovely account of the most perfect day and brought back so many lovely memories. 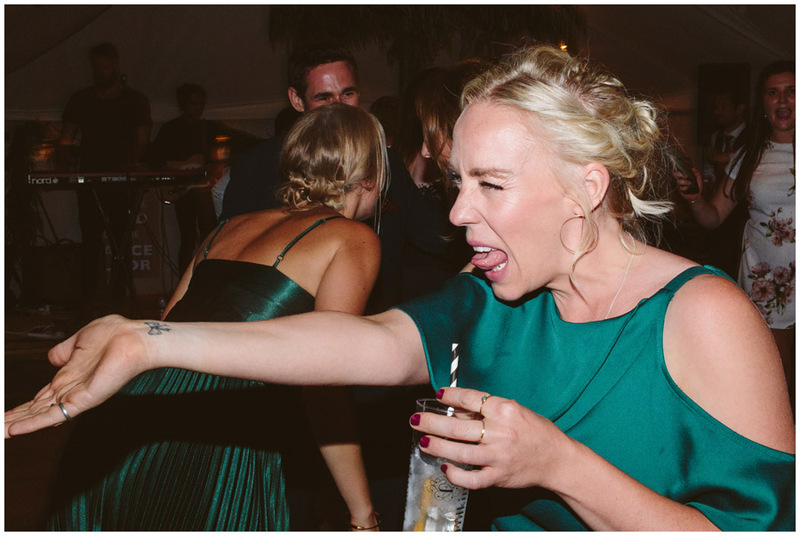 Thank you Sarah for recording it so perfectly. 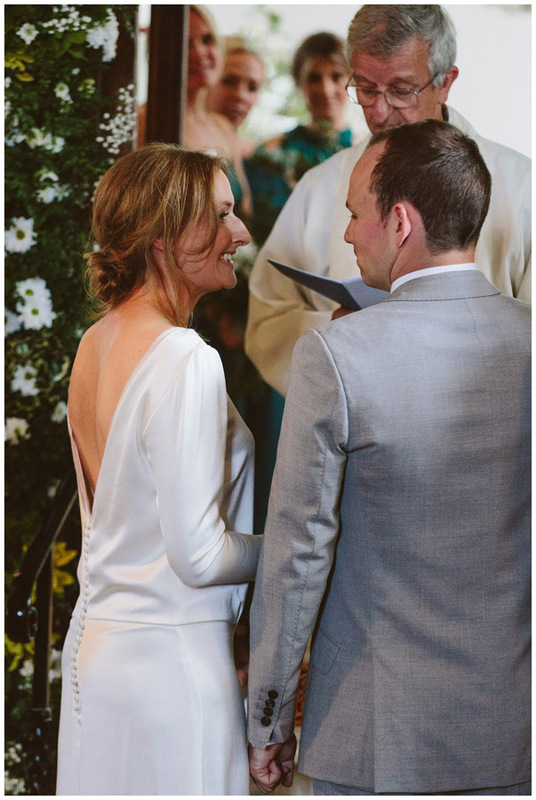 I have no hesitation in recommending your services to any prospective couple.